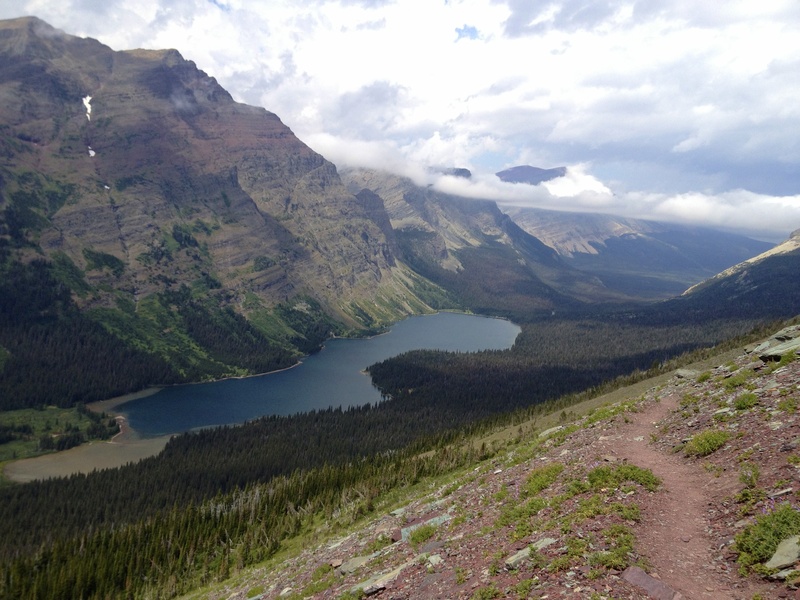 Our final hiking day would take us from Fifty Mountain campsite to The Loop parking lot via Flattop Mountain Trail in Glacier National Park (Montana). 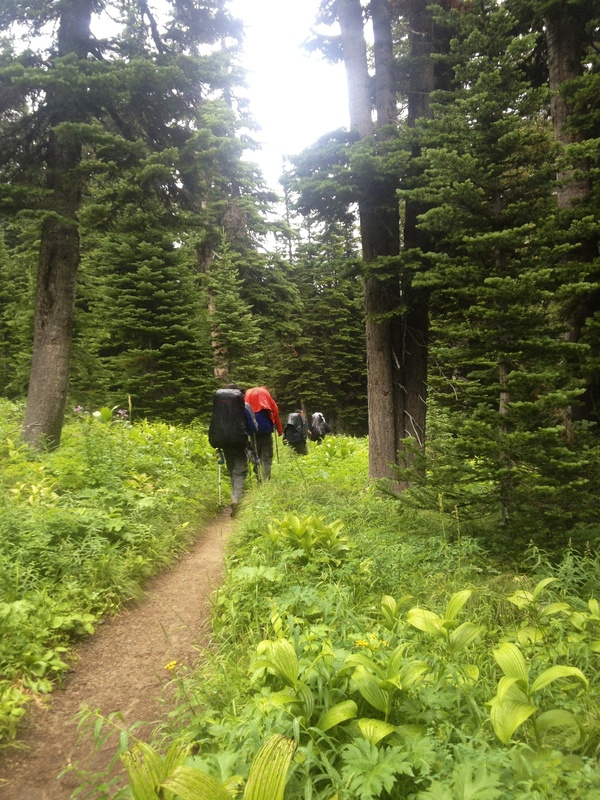 We knew this hike would involve significant distance and a ton of downhill with a big climb at the very end. The only significant elevation, other than the end, was within the first hour of our hike and it was about 300 feet. The elevation gains and losses are estimates, as I had a hard time finding exact numbers online. 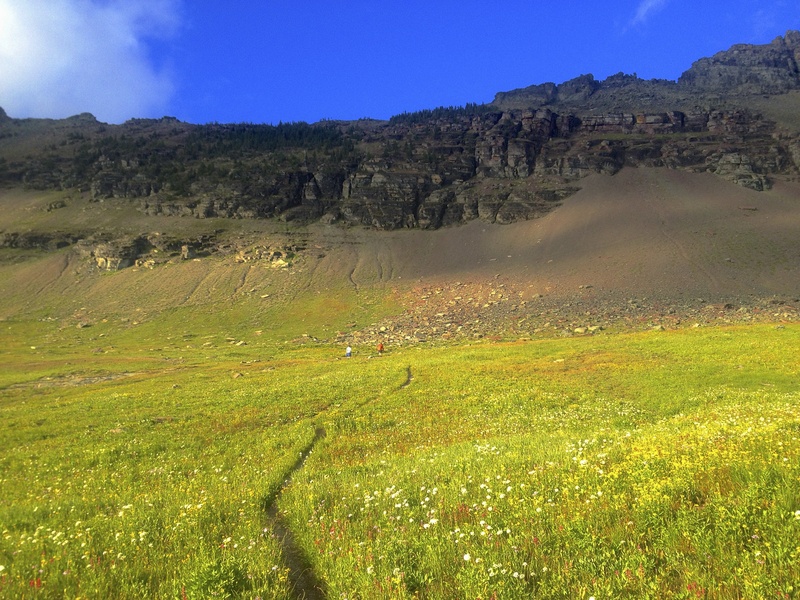 As you would imagine, this trail runs almost entirely along the top of Flattop Mountain and then gradually descends from it. We got up early to get a good jump on the day. We were estimating the hike taking roughly 6.5 hours at 2mph. As it turned out, we averaged about 3mph and finished in about 4.5 hours. 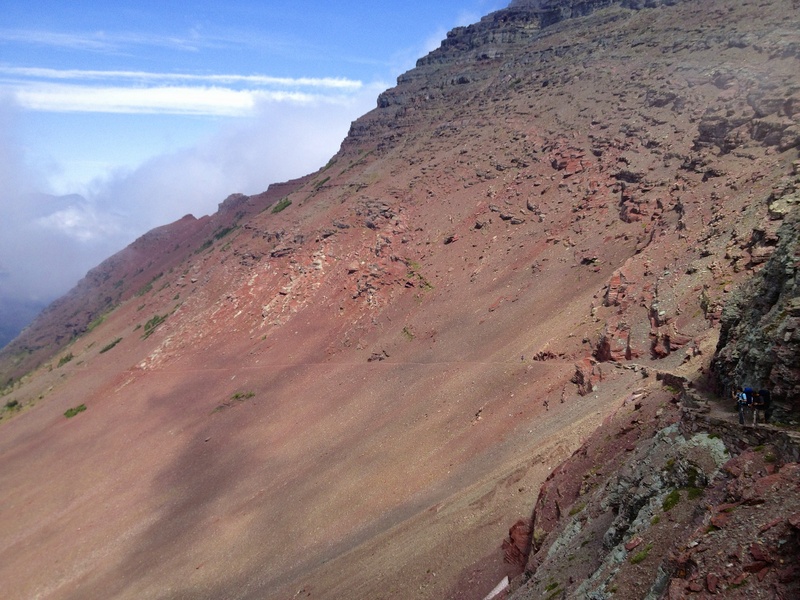 To the top of Flattop Mountain and along the top of it, it is… well.. flat (as it’s name suggests). And the hiking is easy. The trail was easy without any obstruction. 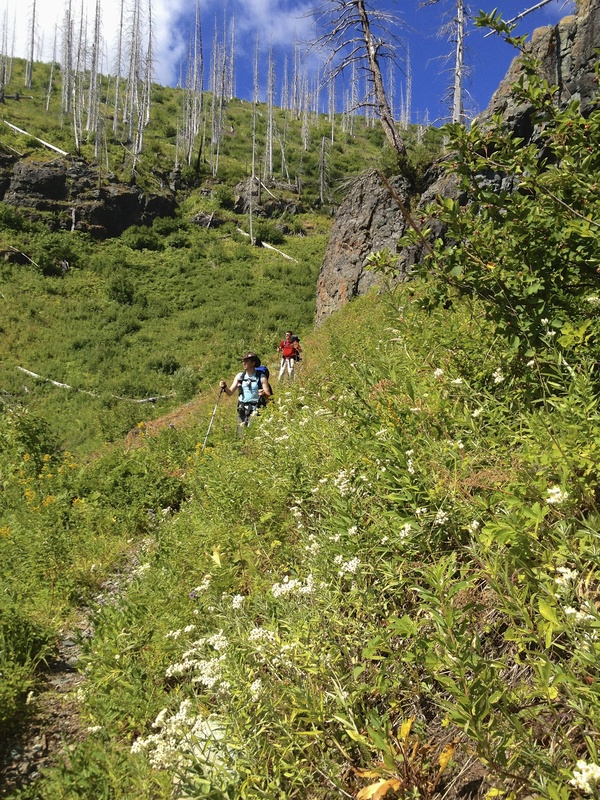 The only portion that begins to be obstructed is the descent, as the Thimbleberry plants choke the trail. 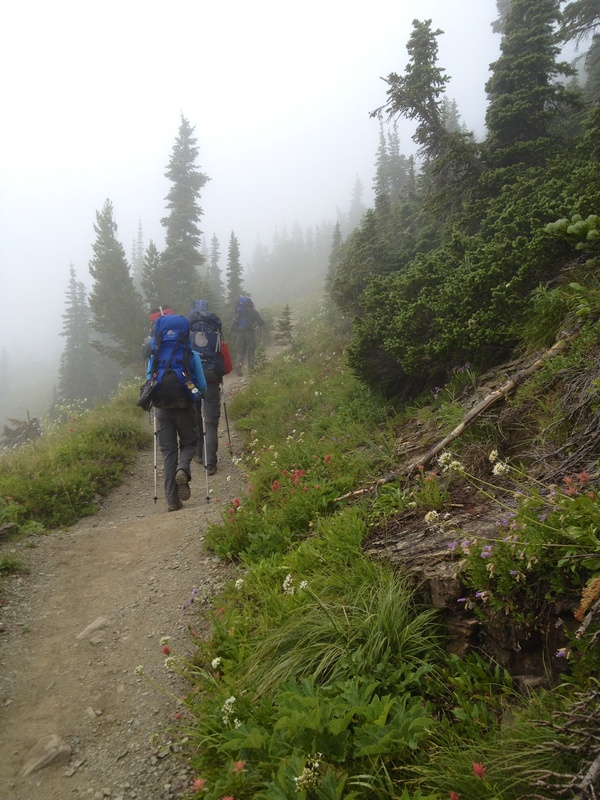 I have to admit that this was my least favorite hike over the eight days. There were a couple of reasons why. 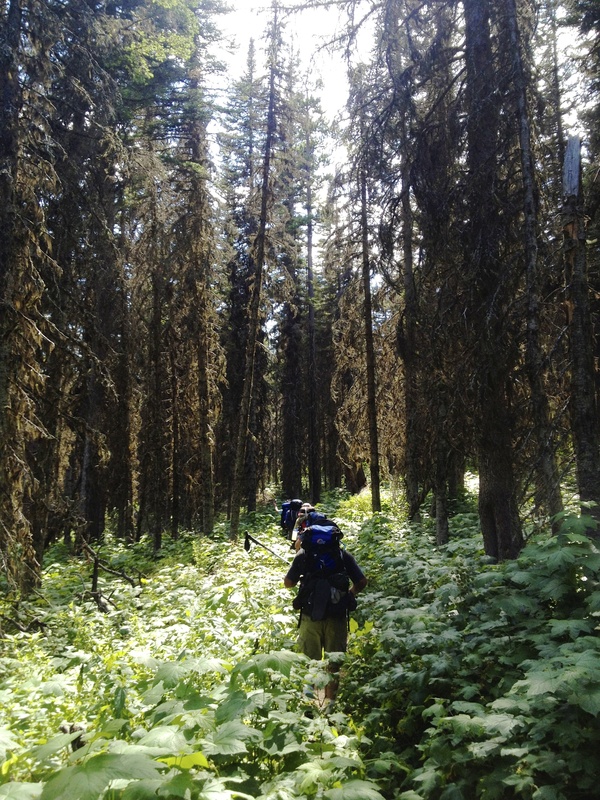 First, about 90% of the hike was among the scorched pines. 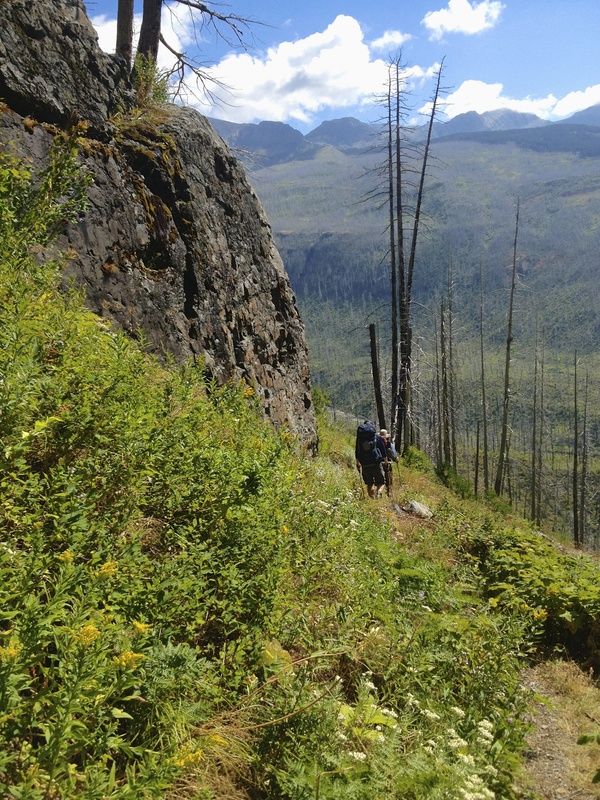 There were two forest fires that ravaged the park a decade ago, burning a third of the park. 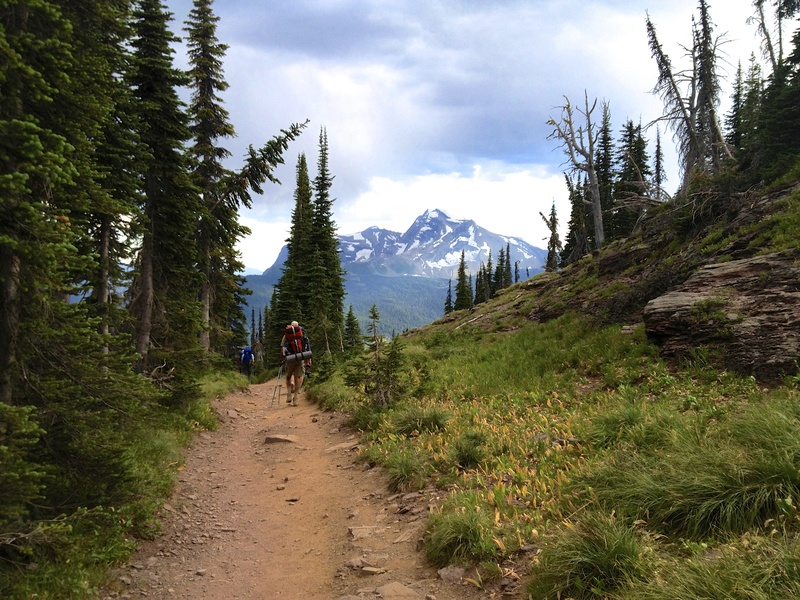 If I had to rethink the final leg of this hike I may have opted for Highline Trail. 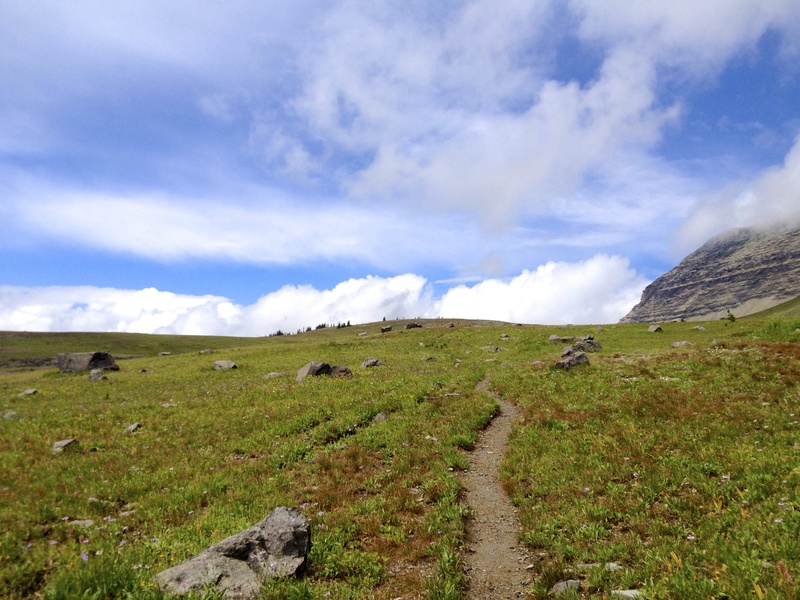 Second, while even the beauty of my least favorite portion of the North Circle Route is greater than most places I have been in my life, compared to days one through seven Flattop Mountain Trail was definitely not an exclamation point at the end of the trip. Don’t get me wrong, it was beautiful. But it just didn’t measure up to the previous days. 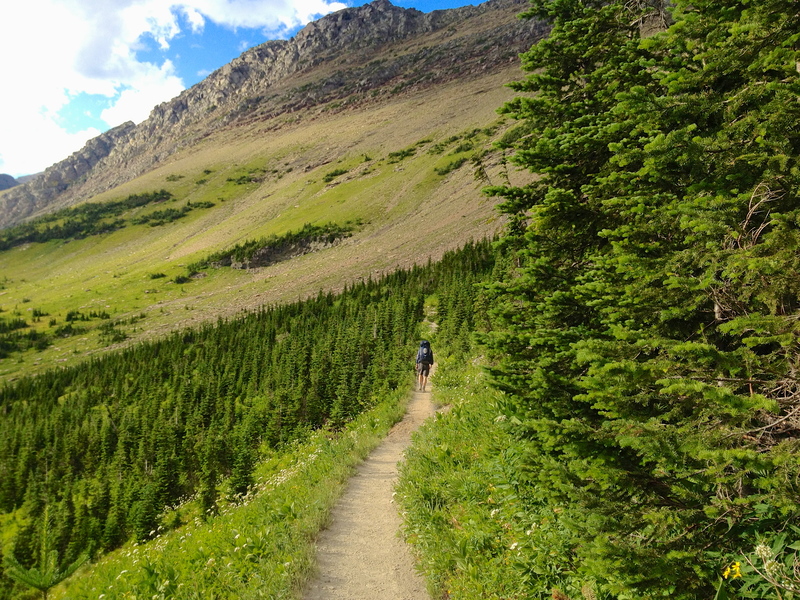 I know I kind of sound like a trail snob, and I realize that Flattop Mountain Trail crushes anything in Indiana, but we had been spoiled up to this point. 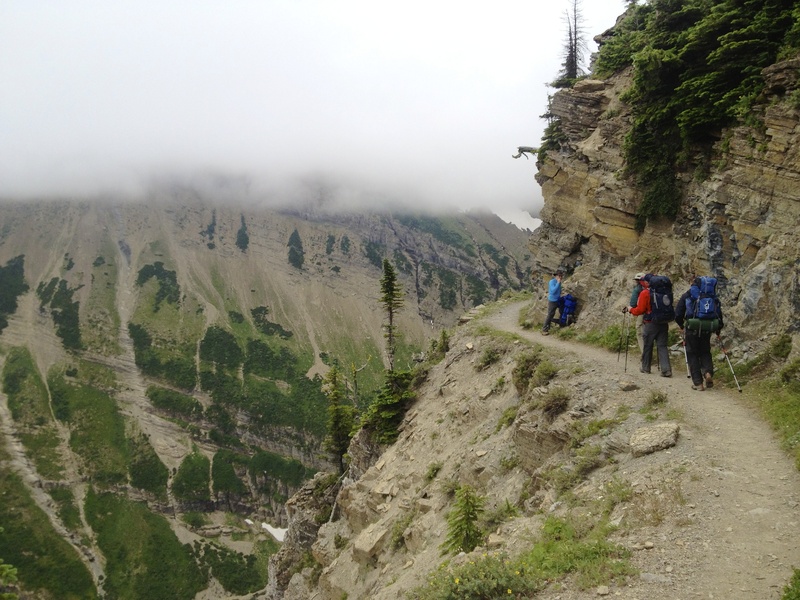 Once we were finished descending, the hike was still about two miles to the junction. The junction sign will show Granite Park and Granite Park Chalet to the left. If you parked in The Loop… this is your turn. Let me say something about the final ascent. 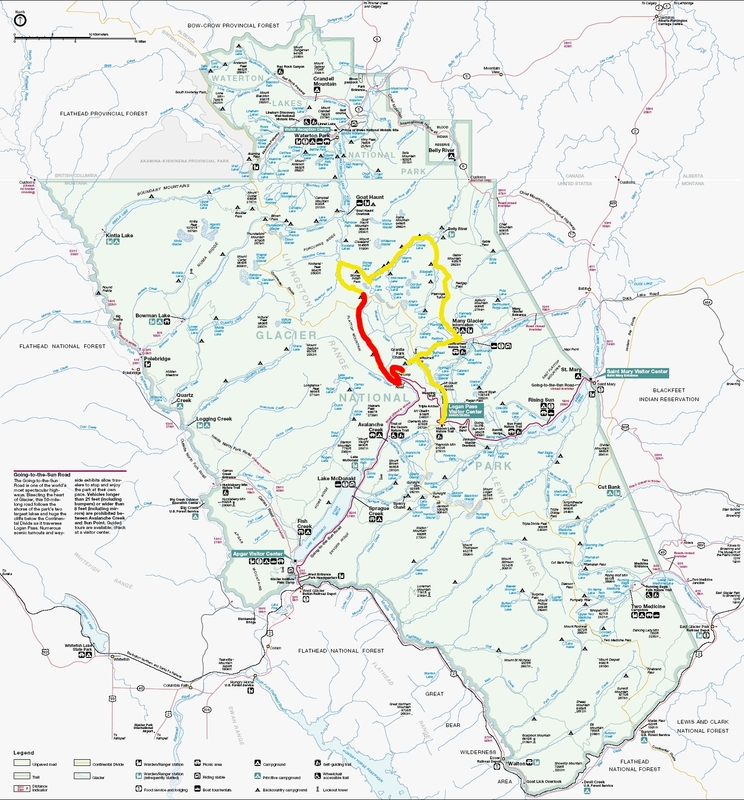 It is approximately 700 feet and approximately a half-mile. 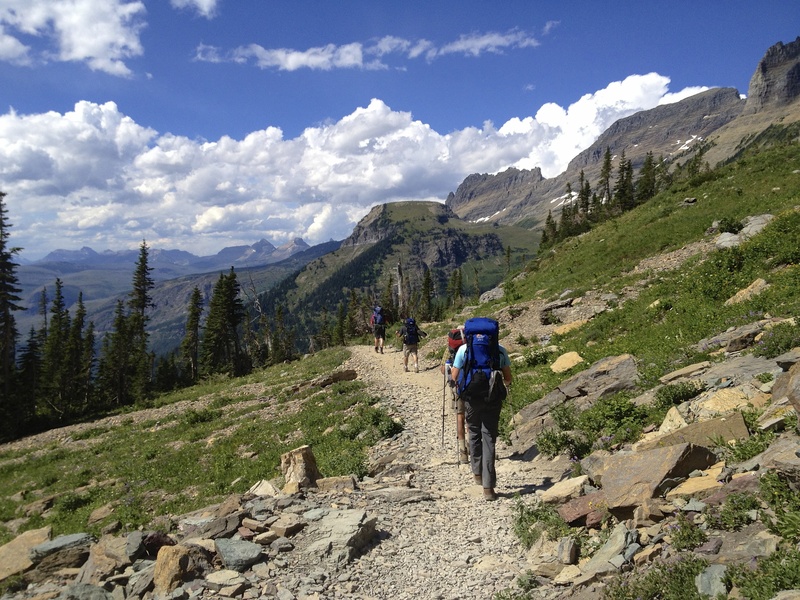 After hiking 12.5 miles, you may have a second wind as you think about getting into your air-conditioned vehicle. But just be prepared for the climb. It seems as if it goes up forever! The North Circle Route was nothing short of spectacular. 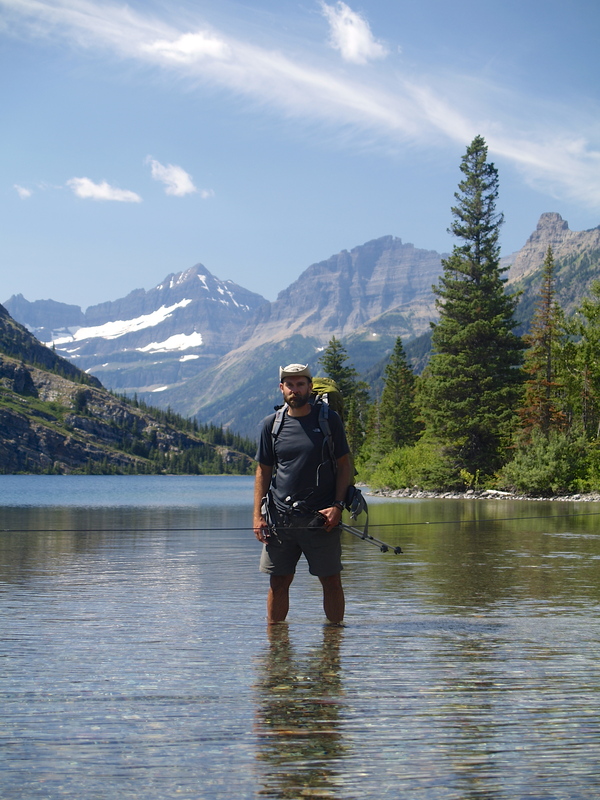 As I mentioned early in this series of posts, it was rated by several blogs as one of the top 10 hikes in the world. After hiking it I would have a hard time disagreeing. 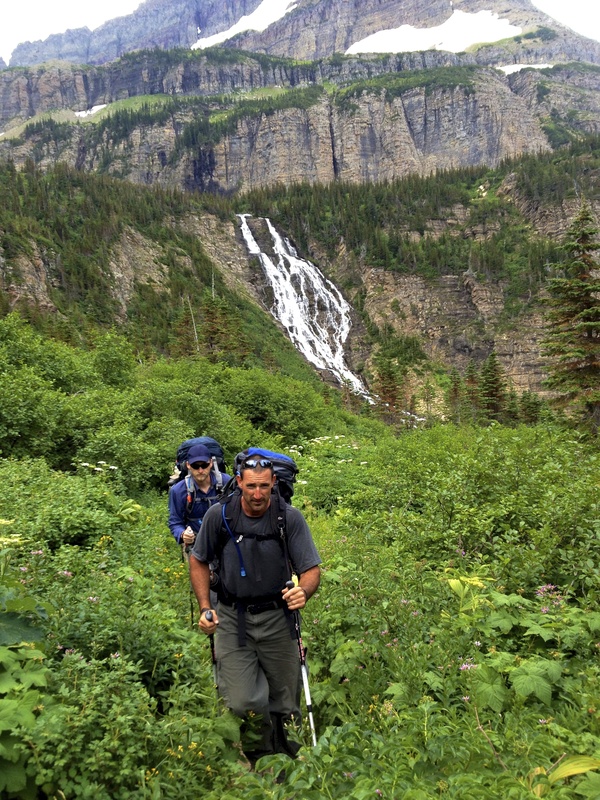 I would, without question, recommend this hike to serious backpackers. It is truly a trip of a lifetime. As a side note, Arvin’s boots made it. After the soles breaking out on Day 2 and significant surgery on them throughout the trip… they reached their final destination: the trash can. 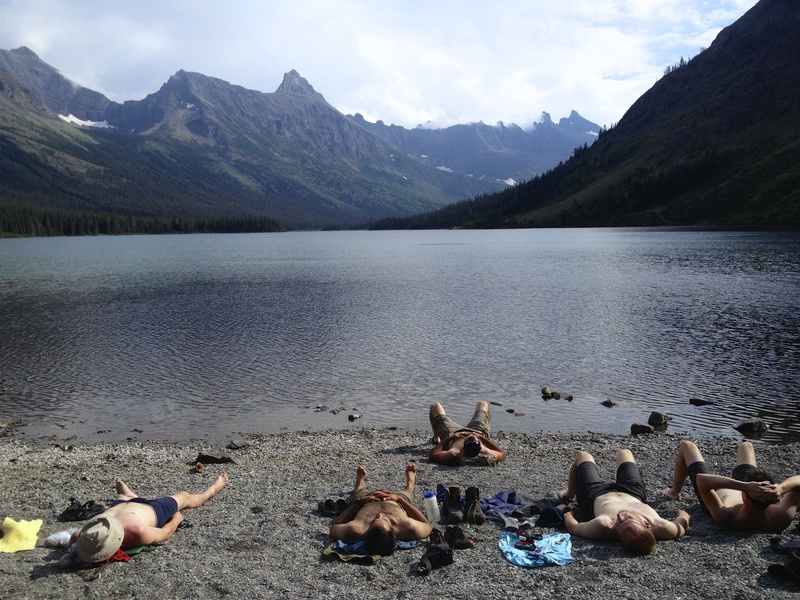 We had just finished a 33-hour marathon in our tents, as it rained non-stop at 45 degrees at Stoney Mountain Lake in Glacier National Park (Montana). At 7am the rain finally subsided. 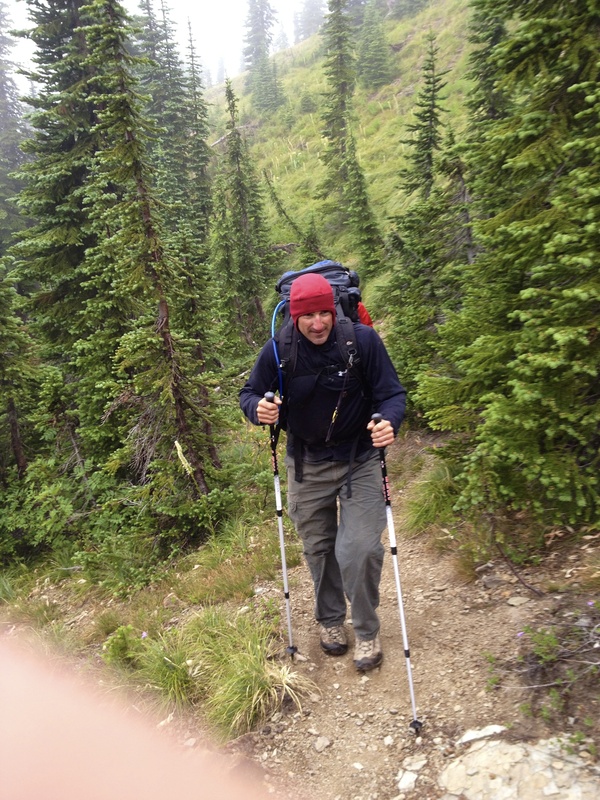 We immediately began to break down the tents and pack up all of our gear. By 8am we were ready to begin our hike to Fifty Mountain, which would be all uphill. As we were waiting for a couple of the guys to tie up some loose ends… it began to rain. And then it began to pour again. 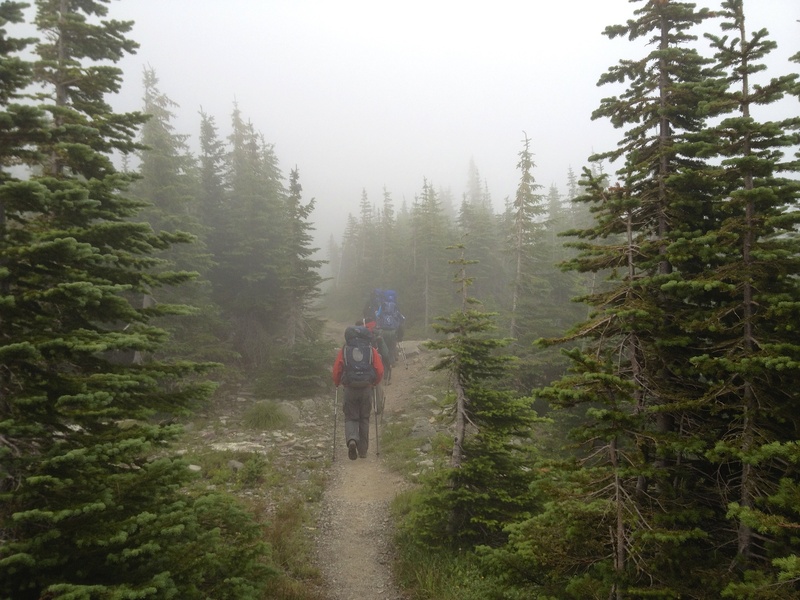 We had no choice but to begin hiking… praying for some sun along the way. Only about an hour into the hike we saw a small shack (probably used by the Park Rangers), but it was all locked up. We stood on the covered porch, ate a small snack, and watched it rain. Would it ever stop raining? 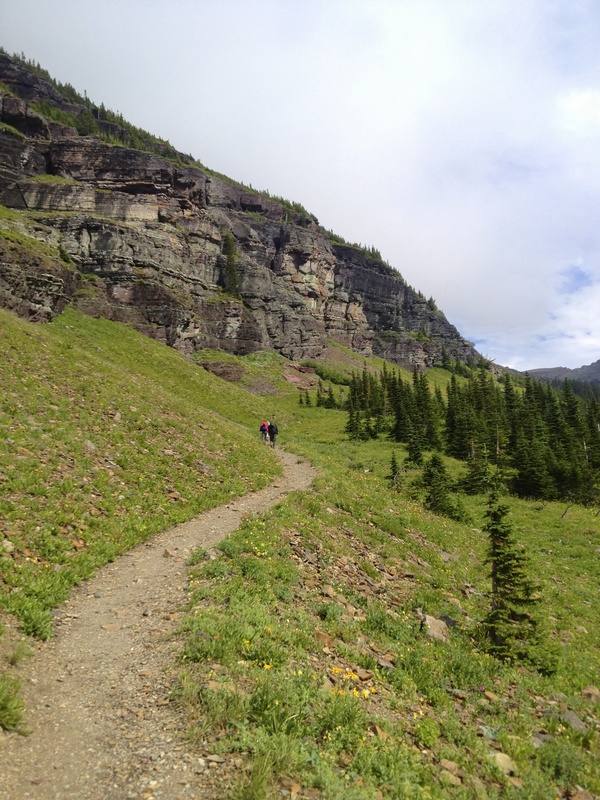 We continued traveling south on Waterton Valley Trail. 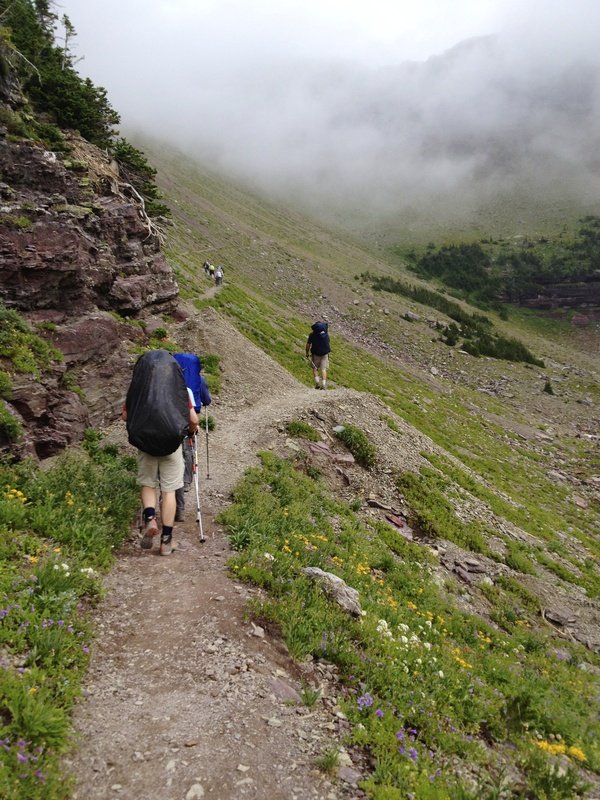 It was a gradual ascent and not very taxing. 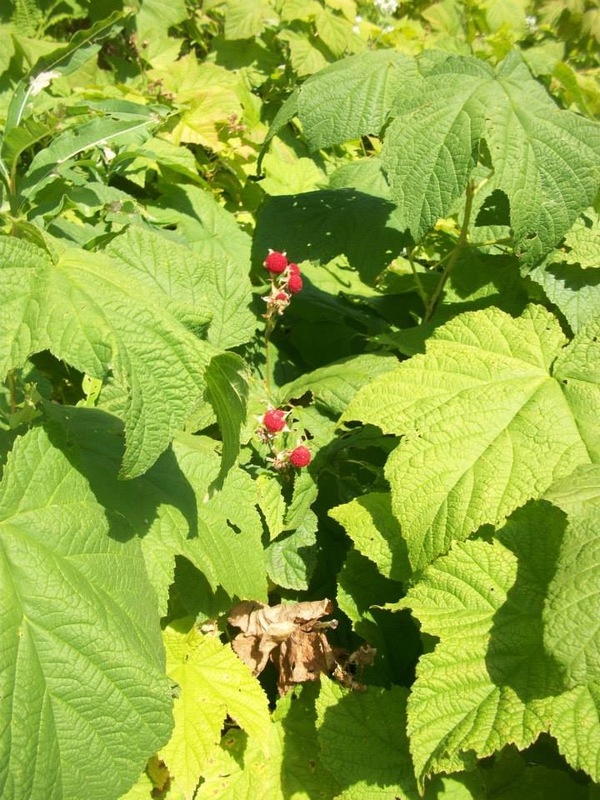 The trail had a significant overgrowth of thimbleberry plants. Yes, we loved eating them but the plants were closing in on us, hugging our upper arms. In one sense it was humorous, but in another sense it was a bit overwhelming- pouring rain and overgrowth closing in on us. At one point I remember stopping and just laughing at how comical it all was. Sure we were “waterproof” but “waterproof” is relative. 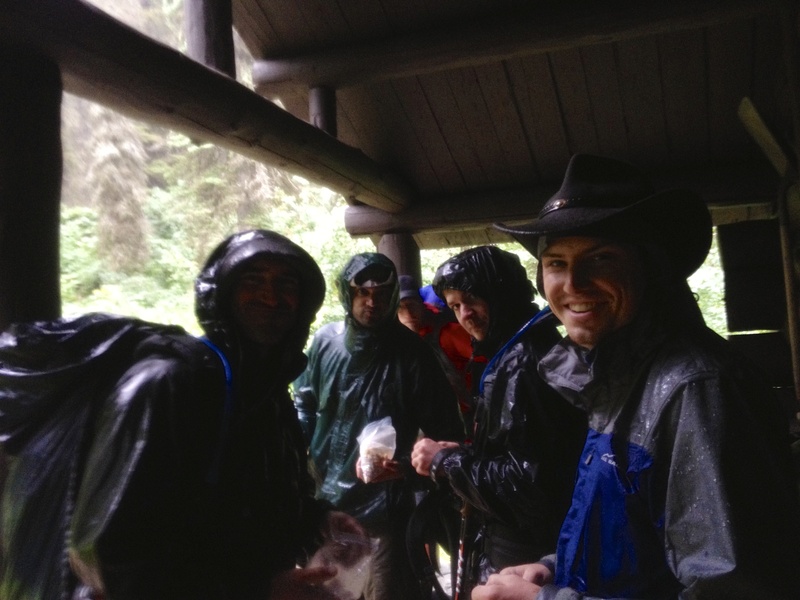 When you are hiking and moving around in a torrential storm… you are going to get soaked. And we were soaked. After four hours of hiking through thimbleberries and pine trees we could see light at the end of the tunnel. Our view, which had been significantly limited by the wooded area and overgrowth, opened up into a beautiful alpine panorama. Welcoming us was a cloud covering that slowly began to open, teasing us with a few rays of light. While we were excited to see the sun attempting to break through, we were even more excited that the rain stopped. 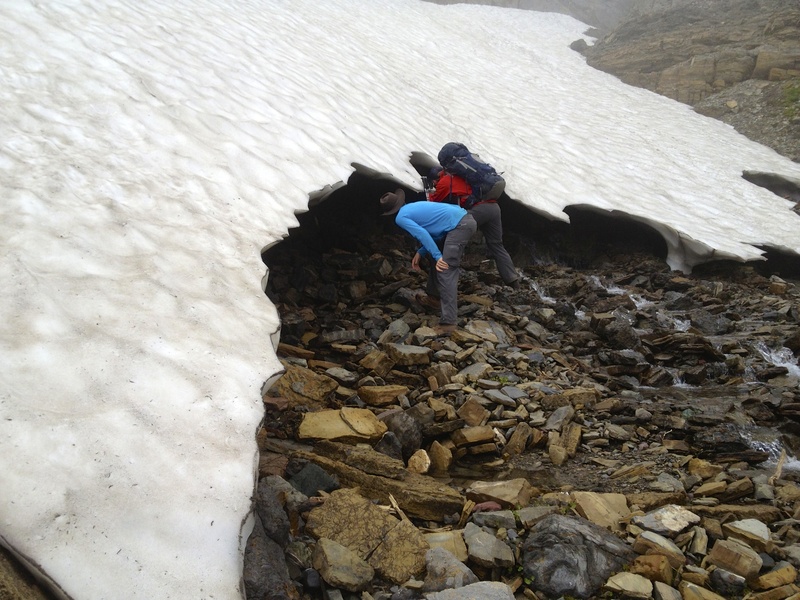 We approached what looked like an old stone foundation and began to shed our wet gear. We were beyond excited with the rain stopping and the sun breaking through, while standing in one of the most beautiful areas of the trip. Our stop at the stone foundation lasted about an hour and a half… and we dried out as much as we could. I even stripped down behind the stone wall to dry out. The good news was that we were only about a half mile from our camp at Fifty Mountain. And the way the weather was changing, it looked as if we would have the best day yet. 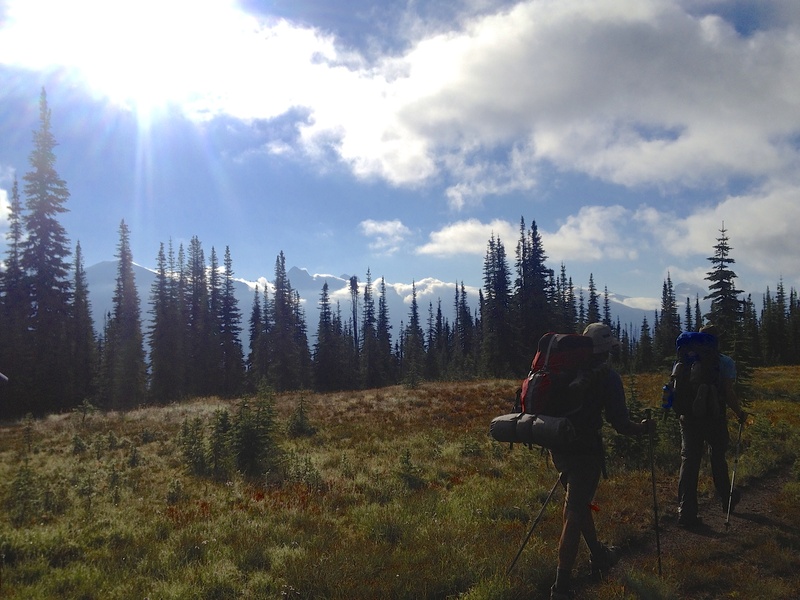 The hike to Fifty Mountain campsite was a real treat, especially with blue skies making their appearance behind the retreating clouds. This is what we had been waiting for after 37 hours of rain. And it was the perfect place to have a beautiful day. 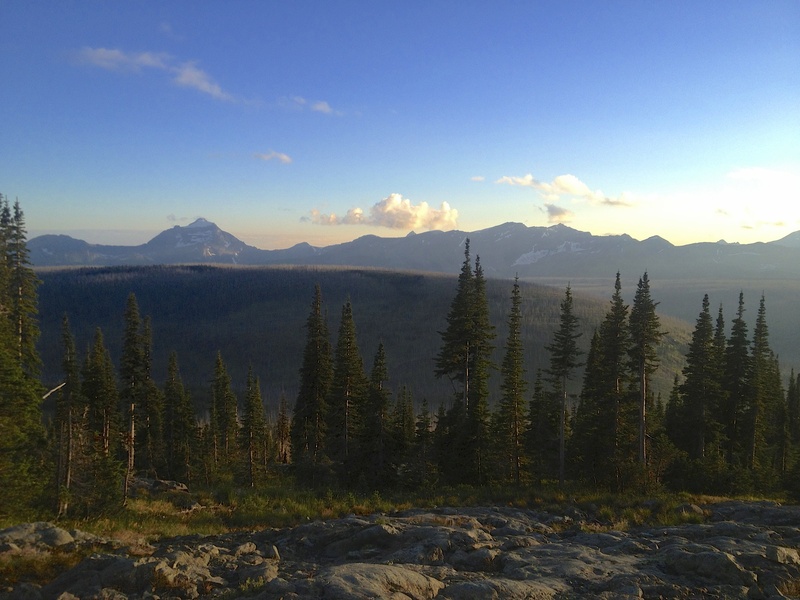 The Fifty Mountain campsite has the same three main areas as the other backcountry campsites: tent areas, food eating and storage area, and a single outhouse. 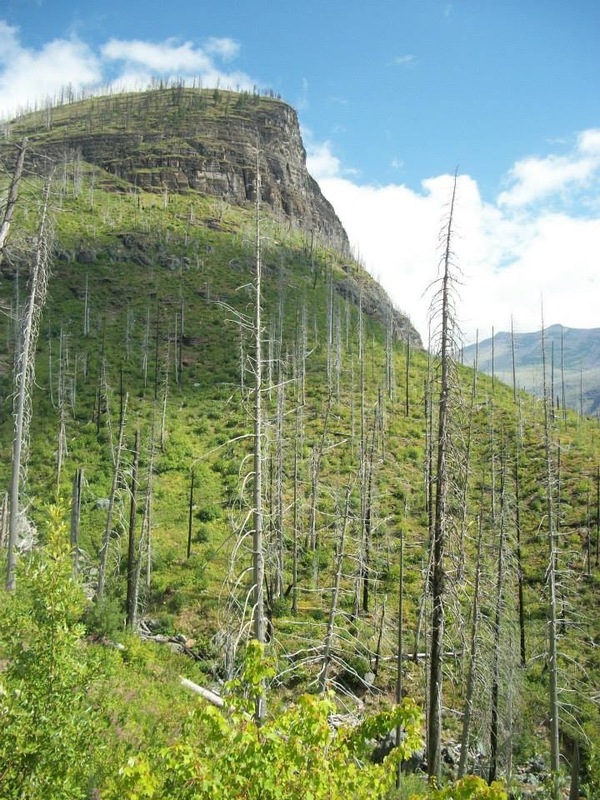 You can begin to see some of the aftermath of the two forest fires that devastated Glacier a decade ago. This became even more evident on Day 8 as we hiked out of the park. You could tell that the undergrowth was rebounding but the pines looked like skeletons. 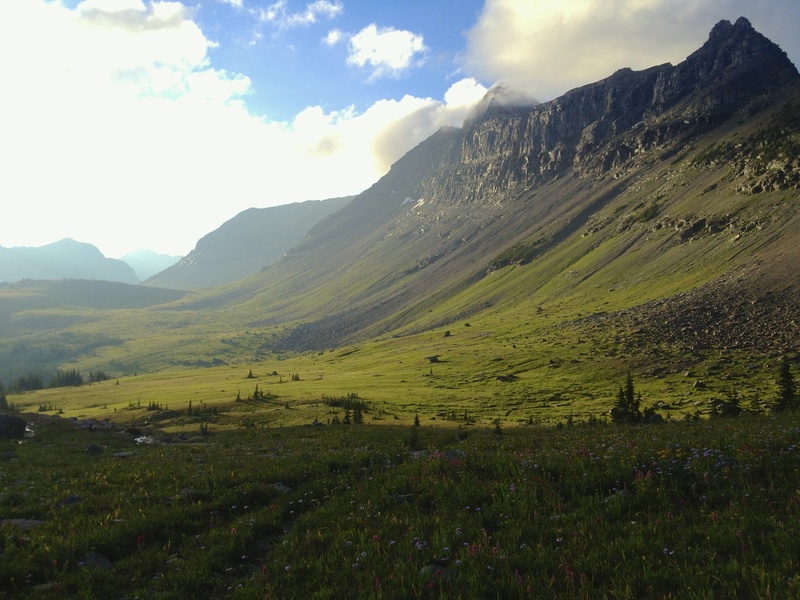 That evening we hiked into the open meadow area and sat on a large boulder and just took in the experience. After about thirty minutes we hiked up a small hill that presented the greatest 360 degree panorama that I have ever seen in my life. Pictures do not do it justice. If you are ever at Fifty Mountain do some short hikes and look for views. 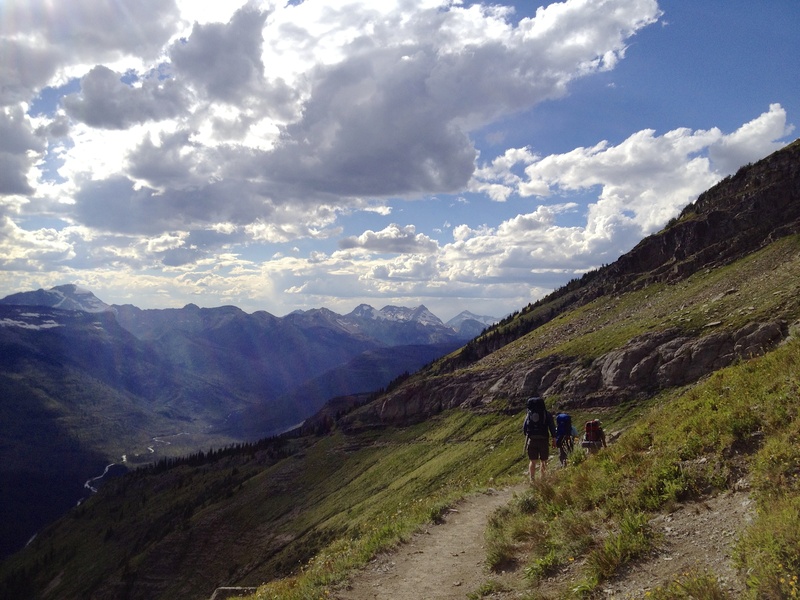 For the most epic view, take a hike up Mount Kipp for an experience you will never forget. 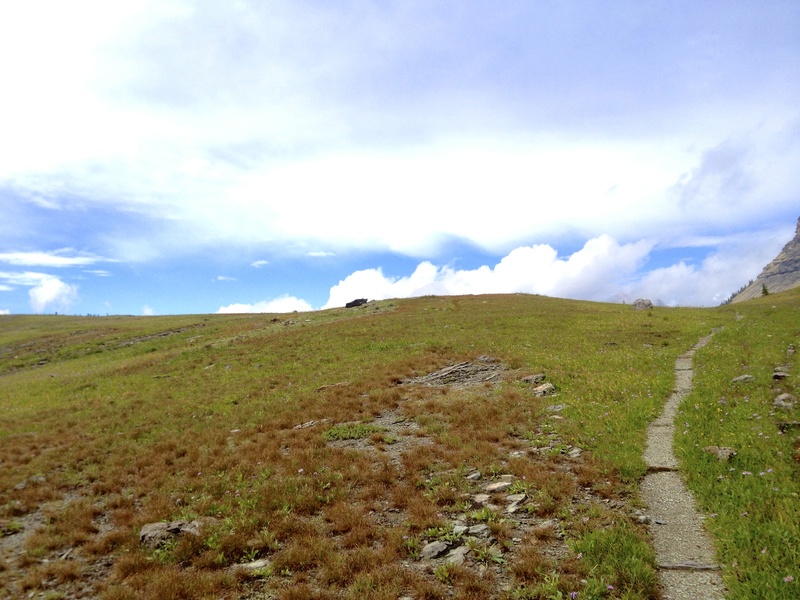 In the next post I will be detailing the final leg of our hike from Fifty Mountain along Flattop Mountain Trail to the parking lot at The Loop. We did not hike on Day 6. 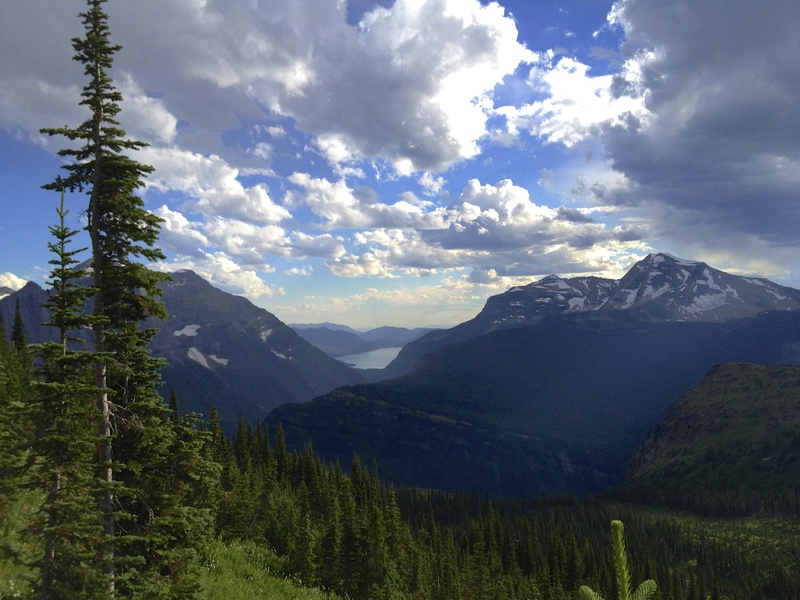 We were stuck at Stoney Indian Lake in Glacier National Park, Montana. Here is the story. We went to bed at Stoney Indian Lake around 10pm and that is when it began to rain. We could tell by looking at the sky that evening that something was brewing. But without any sort of communication or the ability to check on our iPhones, we didn’t know if/when it would come or how long it would last. It poured all night long. And the temperature bottomed out around 45 degrees. At around 7am I could tell that water was pooling outside of our three-man tent. Sure enough we set the tent up in somewhat of a depression where water would run and collect. There was probably an inch and a half of water around the tent. We quickly exited the tent and relocated it atop a large rock that drained quite well. Unfortunately during the relocation we got soaked and cold. 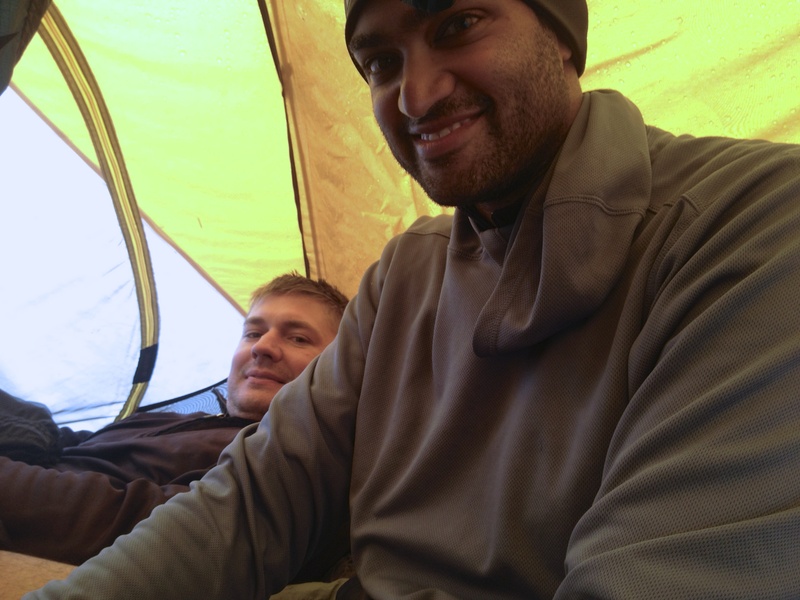 We hopped into the tent fully clothed with boots and sat patiently waiting for the storm to pass. But it didn’t. It continued to pour. Fortunately for the guys in the other tent, they were on higher ground, which meant (for the time being) they were dry and content staying in their tent. After a couple of hours sitting uncomfortably in my tent, I suggested to the other two guys that we should probably plan for an extended stay. So to that end, we began to clean the tent, set up our sleeping pads and sleeping bags, and organize our wet stuff. At least this way we would be able to lie in our sleeping bags and warm up, which we did. When a person is enclosed in a tent for hours, wide-awake, there is plenty to talk about. And so we talked. What is the plan? 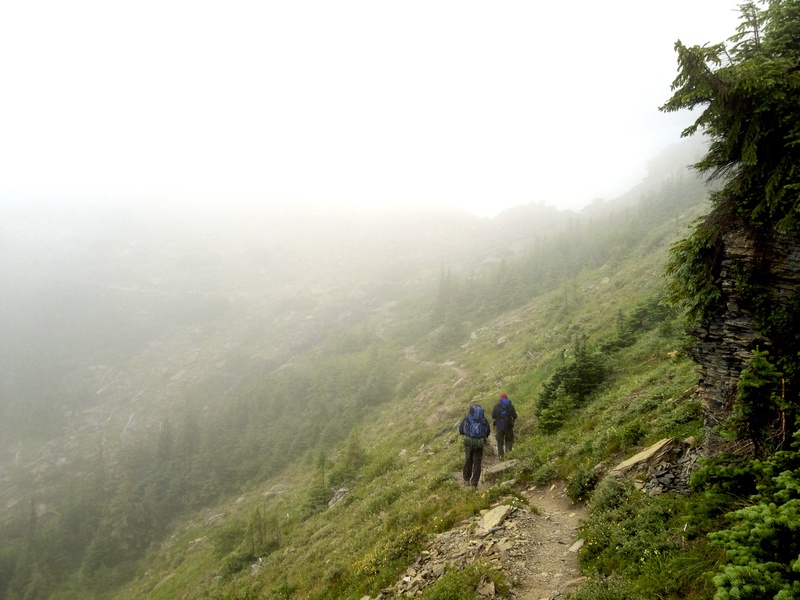 Do we pack up in the pouring rain and hike to our next destination? Do we stay put until it stops raining? Will it ever stop raining? We surmised that the safest plan was to stay in the tent where we knew, at least, we were warm and dry. We had no way of checking to see how long the storm was going to last, so we continued to wait to see if it would finally break. As a result, we waited until mid-afternoon… and it was still pouring. 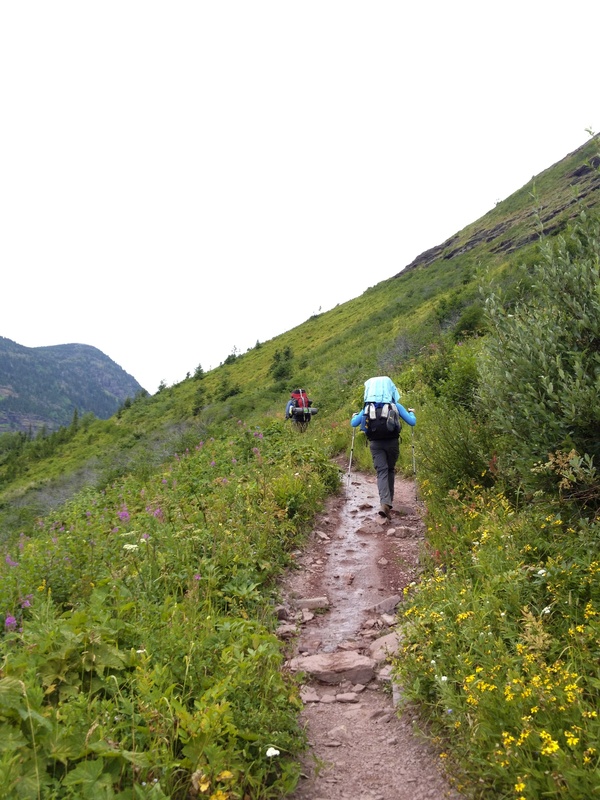 At that point, if you begin to hike you will, no doubt get soaked, but also arrive at the next destination in the late evening when the temps have dropped again. Being that we were not allowed to build a fire in the backcountry, one has to consider how to get dry and warm in such a situation. 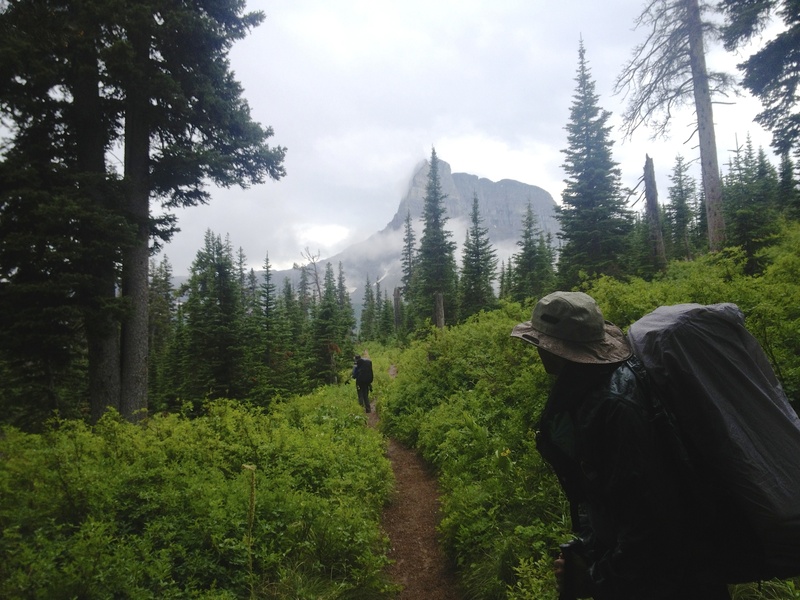 All of our gear would likely be soaked from a four to five hour hike in the pouring rain even with waterproofing (yes, it was coming down that hard). 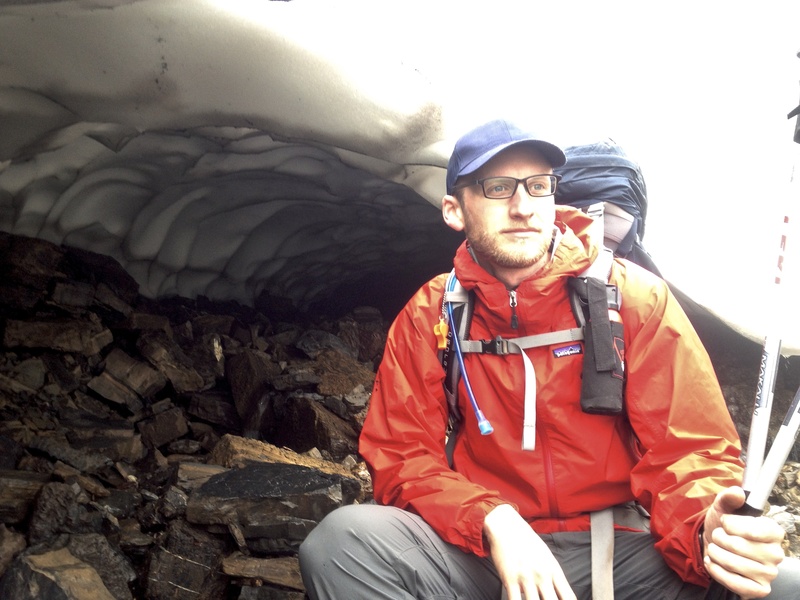 In our minds it was too much of a gamble to risk hypothermia by attempting the hike. 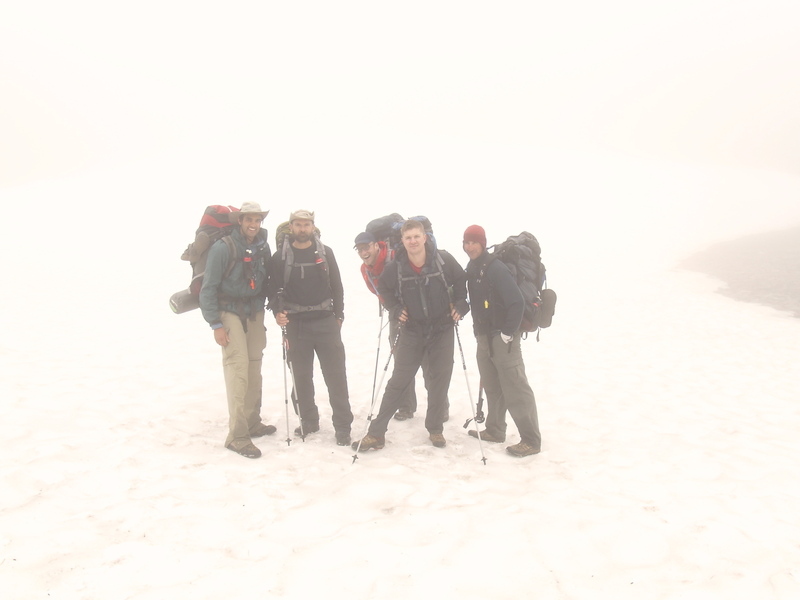 If one of us got hurt or exhibited the signs of hypothermia… how would we call for help? We couldn’t. 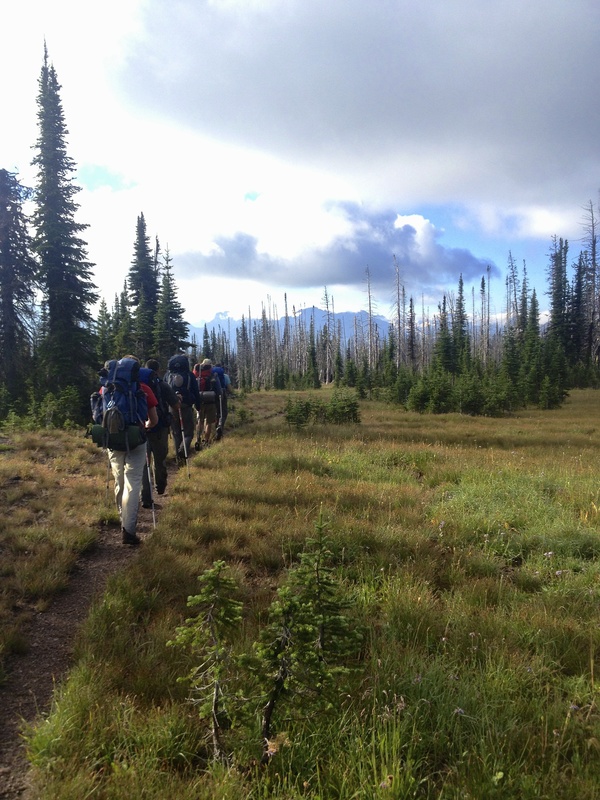 We didn’t have any cellular signal and the closest emergency help was a 15 to 20 mile hike away (a 7.5 to 10 hour hike). 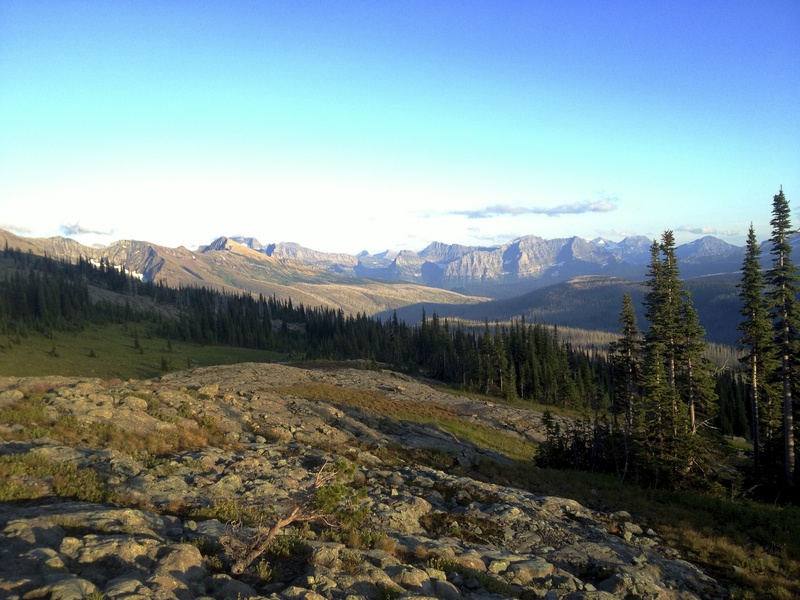 For proper perspective, we were far in the backcountry close to the Canadian border in Montana. In our minds, the most logical and conservative decision was to stay another night at Stoney Indian Lake. We discussed it with the guys in the other tent and they agreed. They had war-gamed the same scenario. And it turned out to be the correct call. At about eight o’clock that night a hiker approached our tent and asked, “Do any of you know the signs of hypothermia?” We said that we did. He went on to tell us that his fellow hiker was coming down from the pass as we spoke and was potentially exhibiting the signs of hypothermia. This is exactly why playing it safe is so important. We went to sleep the next night hoping and praying that the rain would break during the night and that the sun would be nice and warm the next morning. At 7am we looked outside of our tents and saw that it had indeed stopped raining. 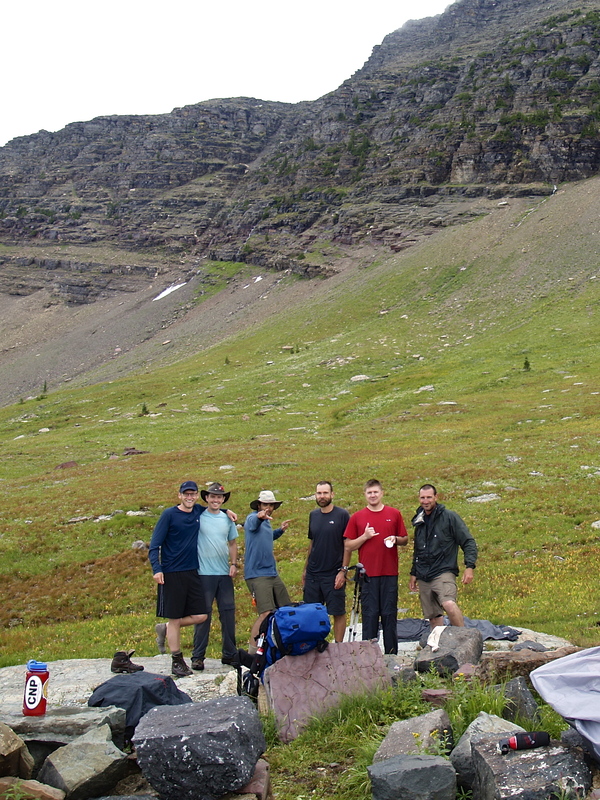 We quickly began breaking camp and packing up the wet gear as quickly as we could. When we were packed and just waiting on a couple of guys to finish a quick breakfast… it began to rain. And so it rained and poured. From 8am until noon, we hiked to our Day 7 destination. But as it would turn out, our incessant prayers were being answered. 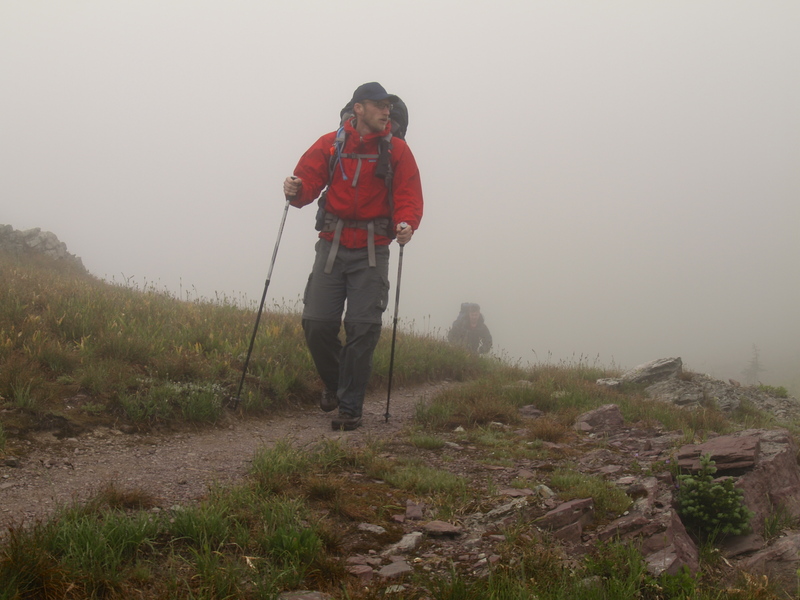 Not only did the rain stop when we reached the mountaintop… the sun began to break through the clouds and the wind began to blow. It was the perfect opportunity to lay out ALL of our gear to dry. As it turned out, Day 7 would be the most epic day of all. Day 6 was a real challenge in many ways… but the biggest challenge was the loss of control. 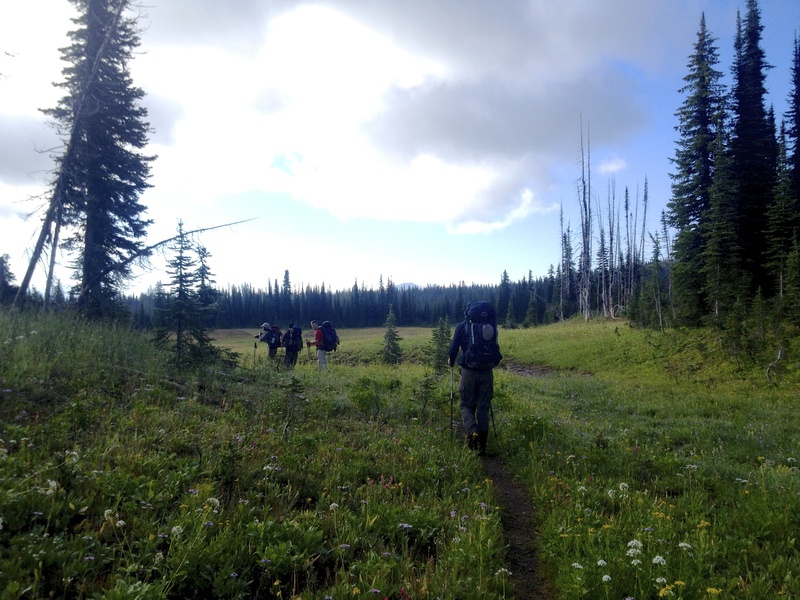 Many times when we go on our backcountry trips, we have researched and researched and planned and planned… so much so that there is very little we haven’t considered. In many ways we always feel as if we have everything in our control. When the temps dropped and it began to rain, I realized that I had very little control over the situation. The only thing we could really control was staying in the tent. At least there we could control staying warm and dry. So what did we do for 33 hours in a tent? Sleep and talk and sleep. What would you do? In the next post I will detail our hike from Stoney Indian Lake to Fifty Mountain. 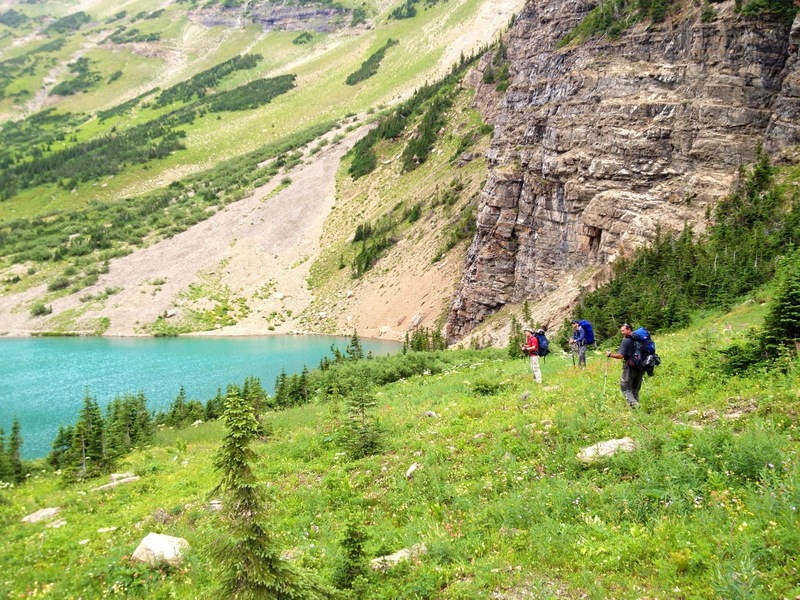 Our hike for the day was from Mokowanis Junction to Stoney Indian Lake, which included a significant ascent to Stoney Indian Pass and then down to the beautiful lakeside camp at Stoney Indian. While the morning began with sunshine and clear skies, the evening would bring an overcast sky setting up for 38 hours of rain. 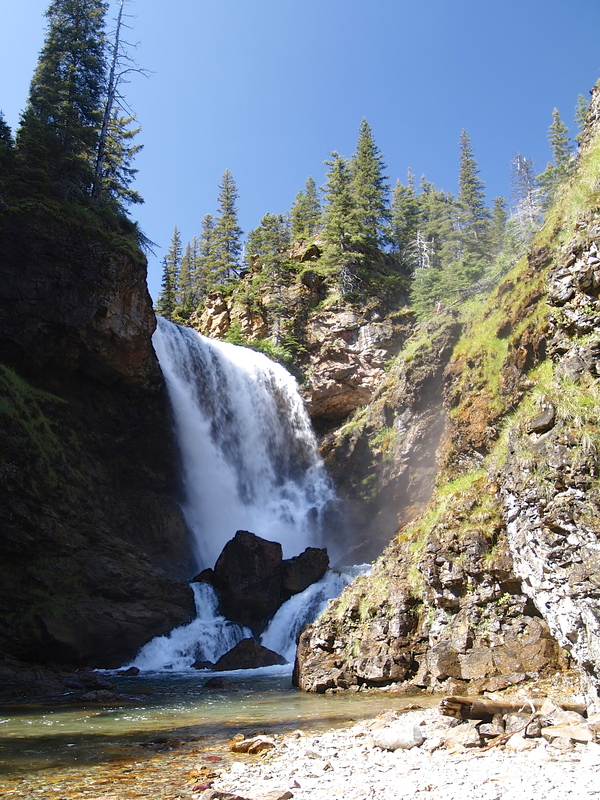 The trek from Mokowanis took us passed some magnificent waterfalls, hillsides of wildflowers, and a spectacular view of the valley looking to the northeast. 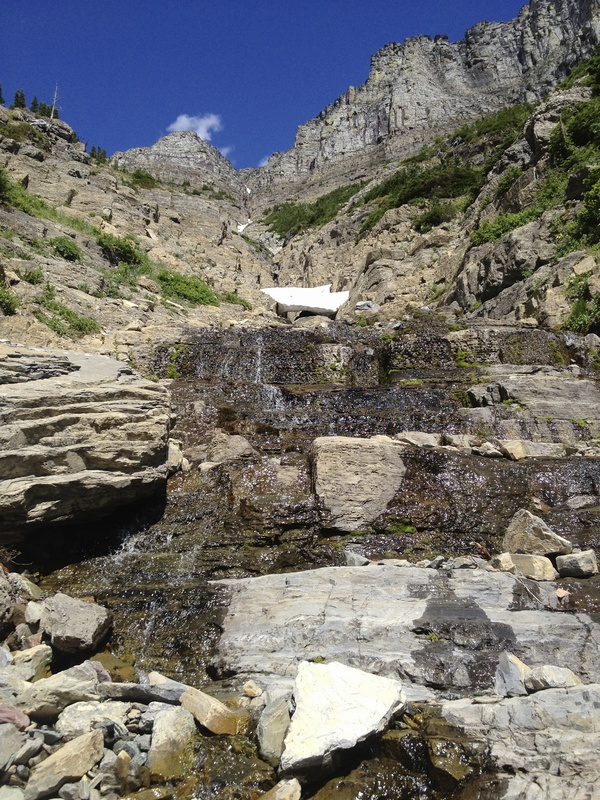 Did I mention the ridiculous waterfalls? 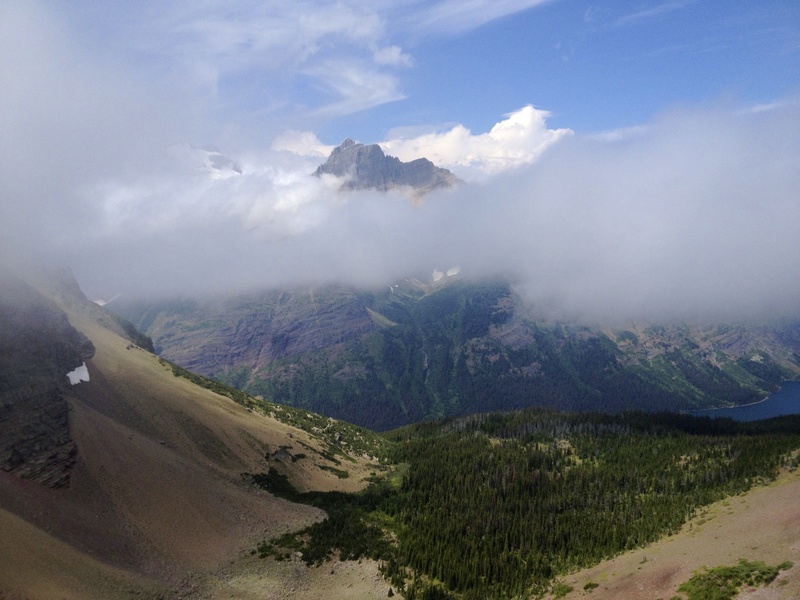 It seemed as if the more elevation that we covered… the more beautiful it became. 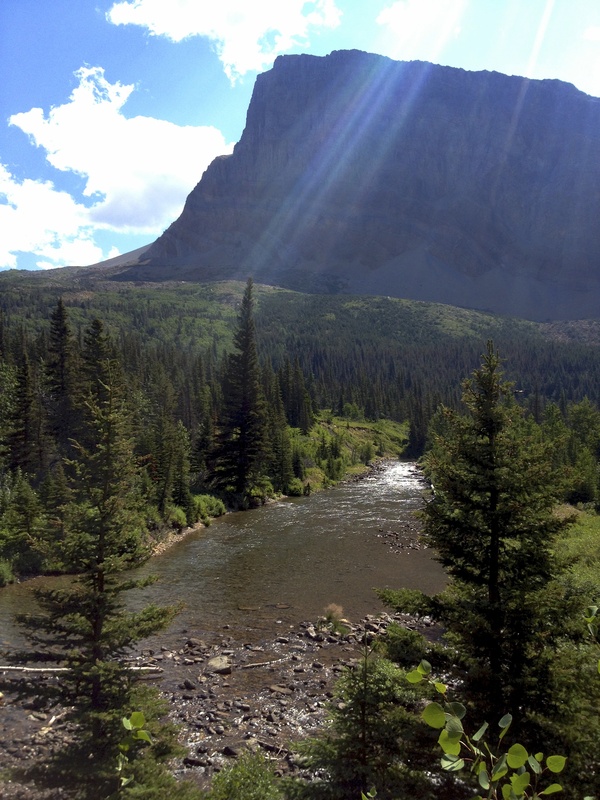 We got to the point on this trip that we stopped using adjectives to describe how “beautiful” or “amazing” a view was. It is almost as if we cheapened it by speaking. So when we would stop and stare at a view, we would just stand there in awe… looking at each other and shaking our heads. 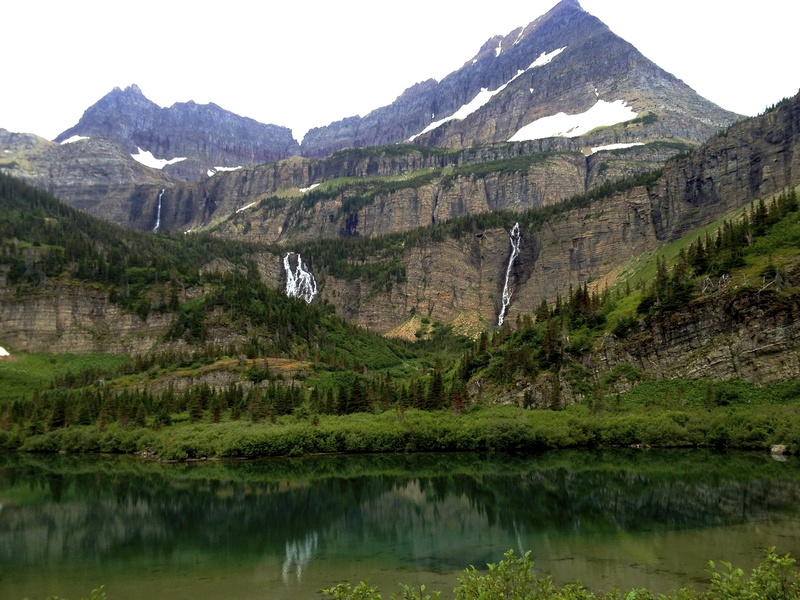 It is hard to imagine a more glorious place for a weeklong hike. 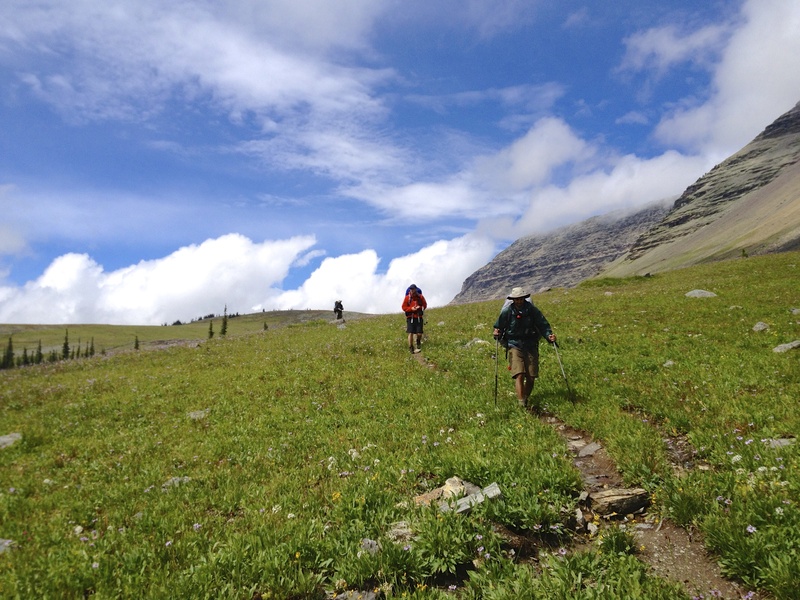 Before reaching the pass there was a debate as to where to eat lunch. Patrick went high and everyone else stayed low. Let’s be honest… you couldn’t go wrong at either spot! 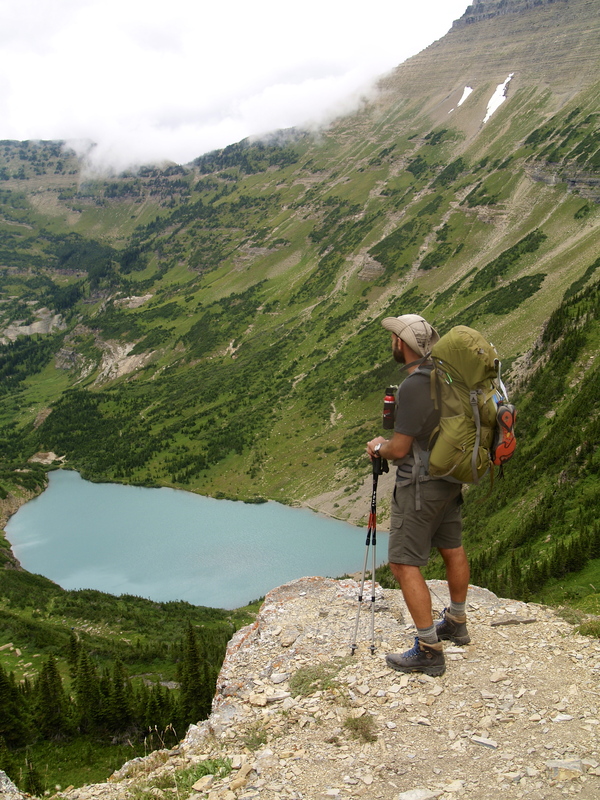 We reached the pass and stood there for a while looking at the crystal blue Stoney Indian Lake. The only thing in between us and our camping spot for the night was a 1000 foot drop via switchbacks down the mountainside. 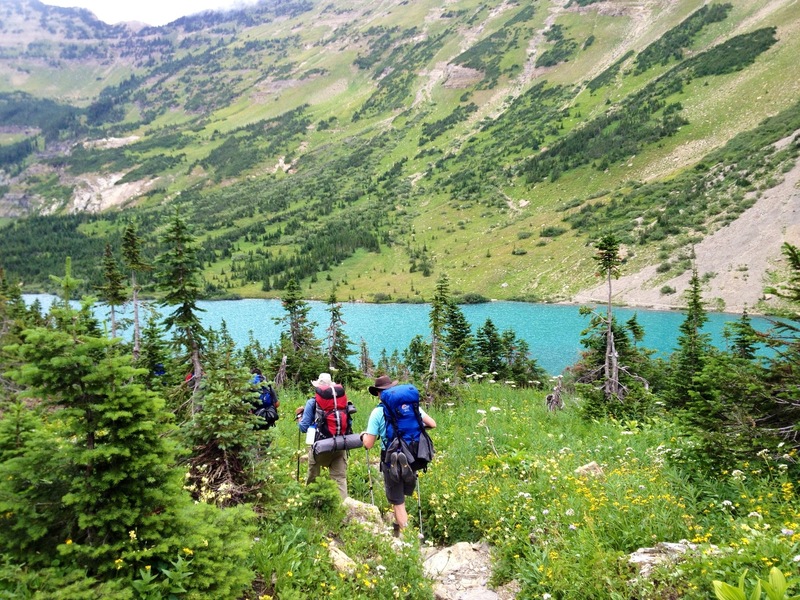 Once you reach the lake it is a short hike around the lake to the campsites. There are about four spots to camp at Stoney Indian Lake. 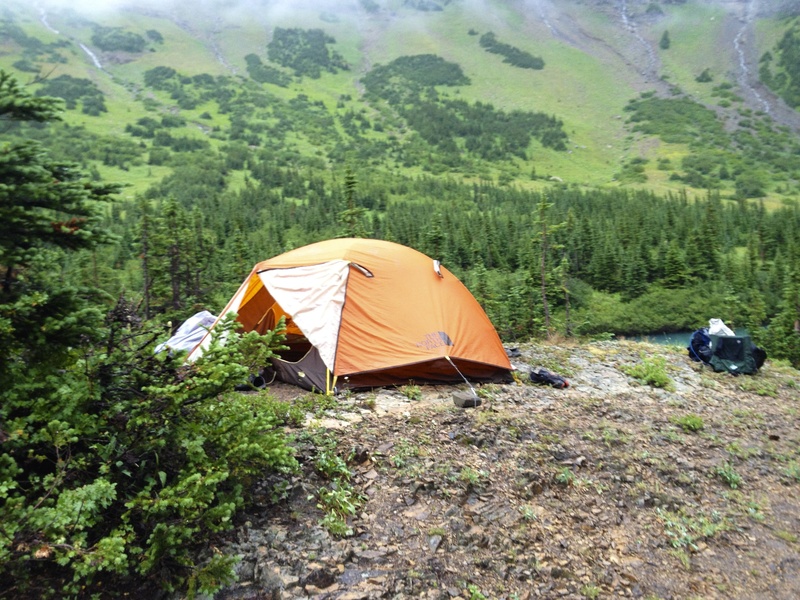 Based upon experience, which I will detail in my Day 6 post, make sure that you do not set your tent in an area that may potentially pool water when it rains. There are really great spots to do some cliff jumping into Stoney Indian Lake. 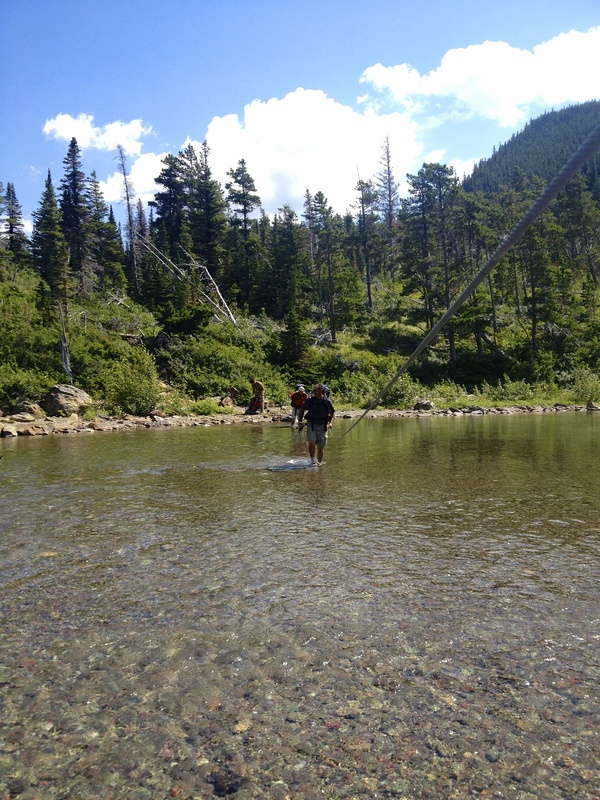 The lake is very deep in many area but make sure you get in the water first to check it out before jumping. 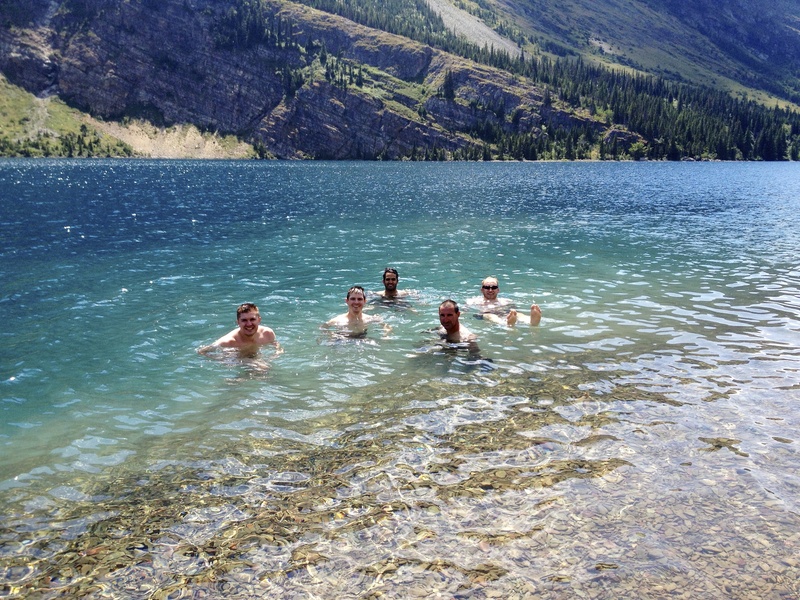 Only one in our contingency jumped because the water was so cold and they air temperature was dropping. Also, a bear walked through our camp right passed us. No joke… within 10-15 feet. We cleared the area and watched as the bear circled through the camp. 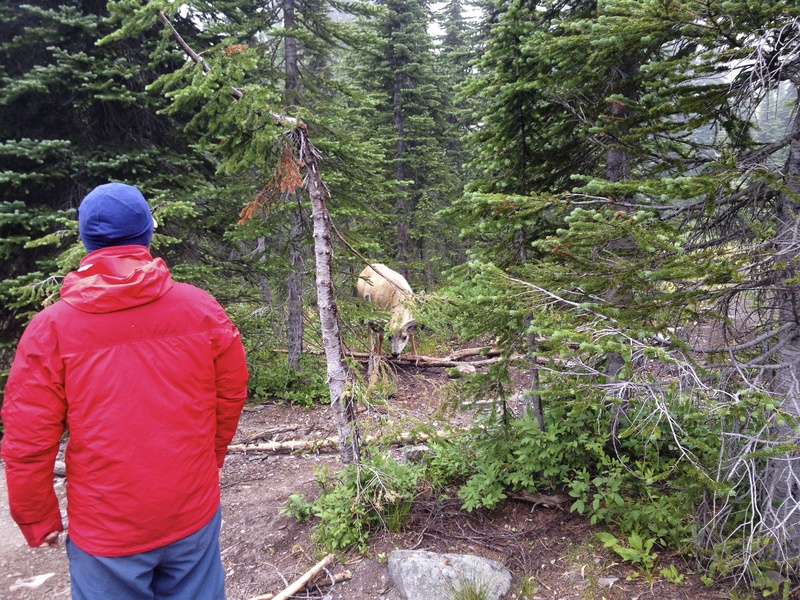 We all had our bear spray handy but this incident underscores the importance of NOT HAVING FOOD OUT IN THE OPEN. A couple of young ladies arrived at the camp only 30 minutes prior and had the equipment and food strewn about. The bear likely smelled it and came to investigate. While the bear didn’t get any of the food… they promptly stored their food in the metal food storage area. Bears are no joke. Take them very seriously. 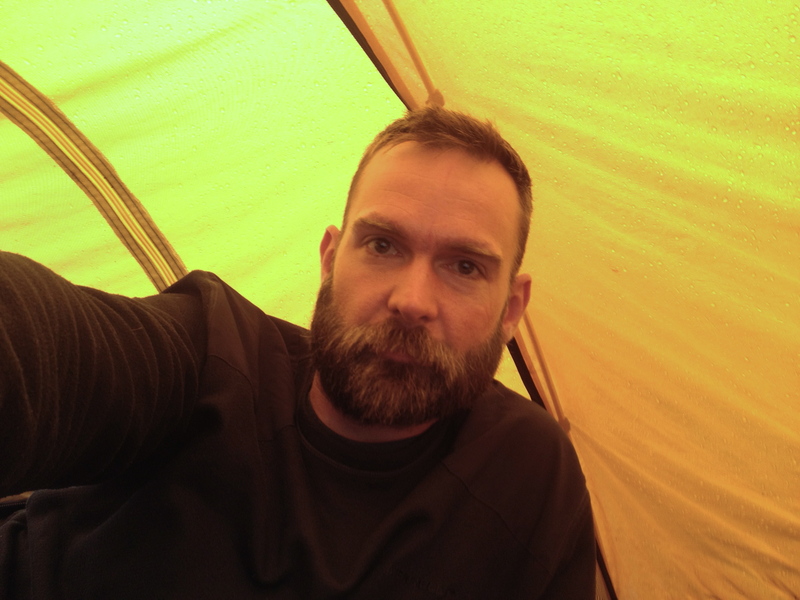 In the next post I will be detailing our 33 hours in our tent at Stoney Indian Camp. Elizabeth Lake was something special. 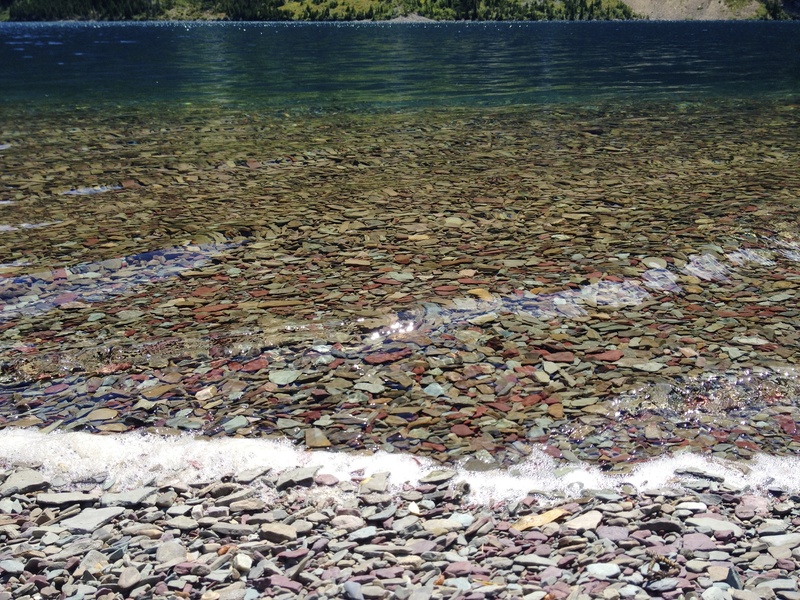 We spent hours on the finely crushed rock beach just looking at the lake and at the stars. Even the next morning we moved all of our gear to the beach to dry off the morning dew. It was great to have such a warm and clear morning. 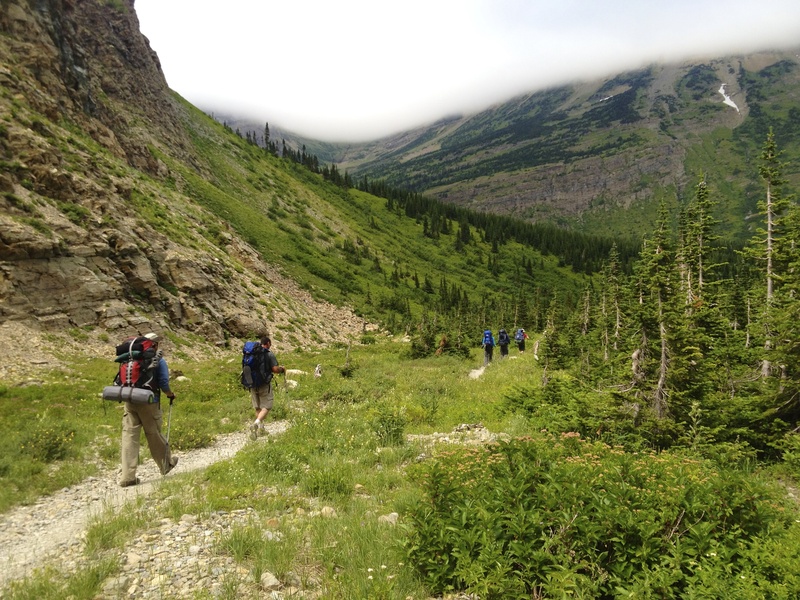 This was just a foretaste of our 8.7 mile hike from Elizabeth Lake to Mokowanis Junction. We didn’t have any significant elevation between the two locations and so we planned to have a leisurely stroll. 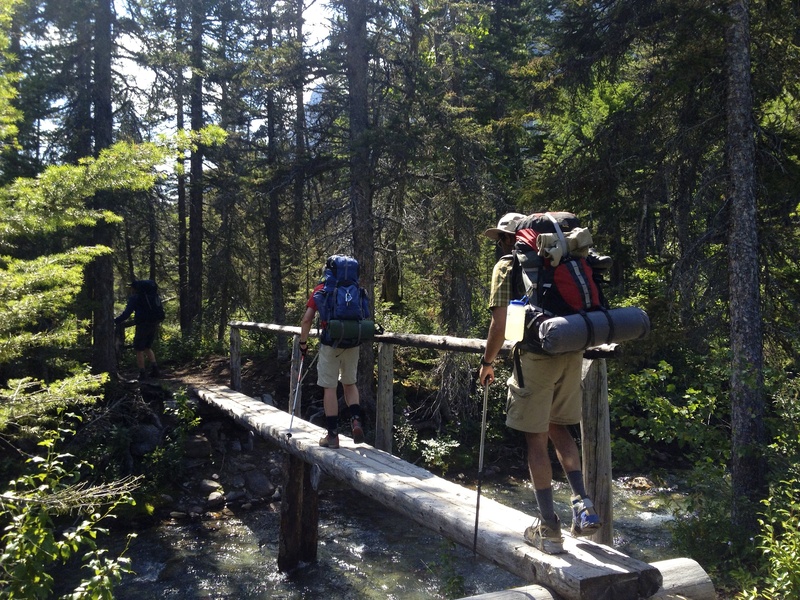 Our route began with Ptarmigan Trail and then connected with Stoney Indian Pass Trail, which we followed southwest to Mokowanis. 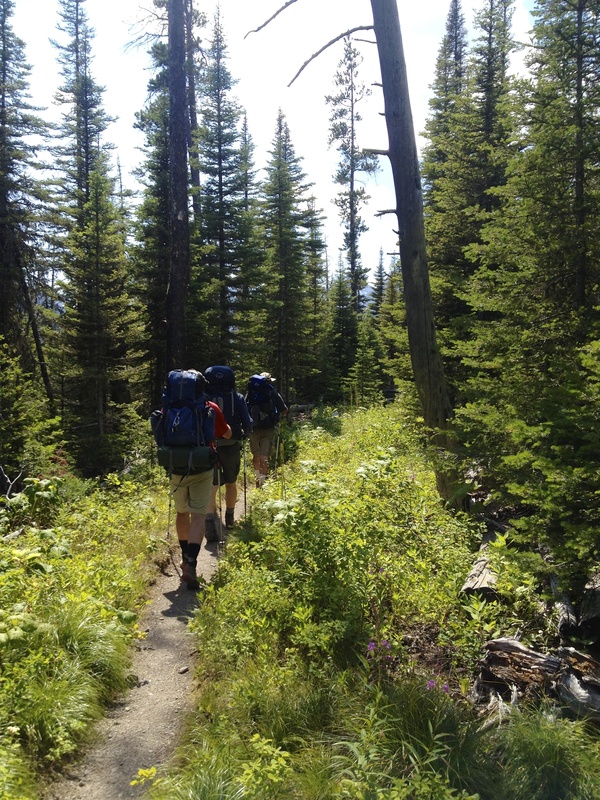 This final portion of Ptarmigan Trail is a dirt path and takes you gently among the pines. 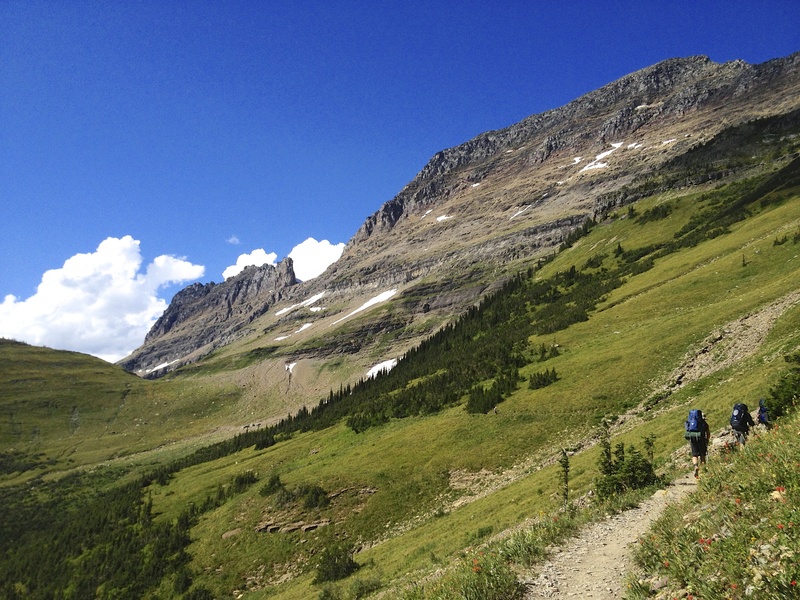 This is the kind of trail that you just have to stop occasionally, close your eyes, and breathe deep. 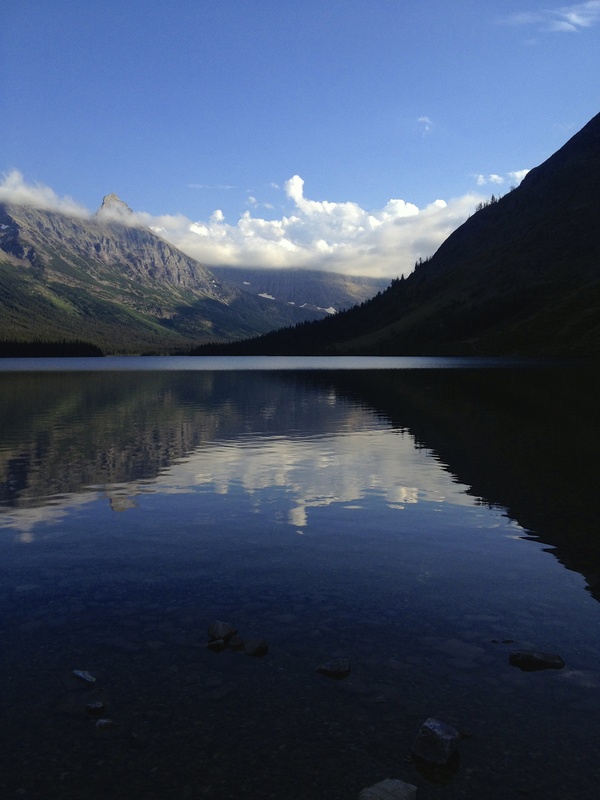 If this doesn’t recharge your batteries and stir your soul… you aren’t human. Dawn Mist Falls will be on your right when you have traveled about a mile from camp. 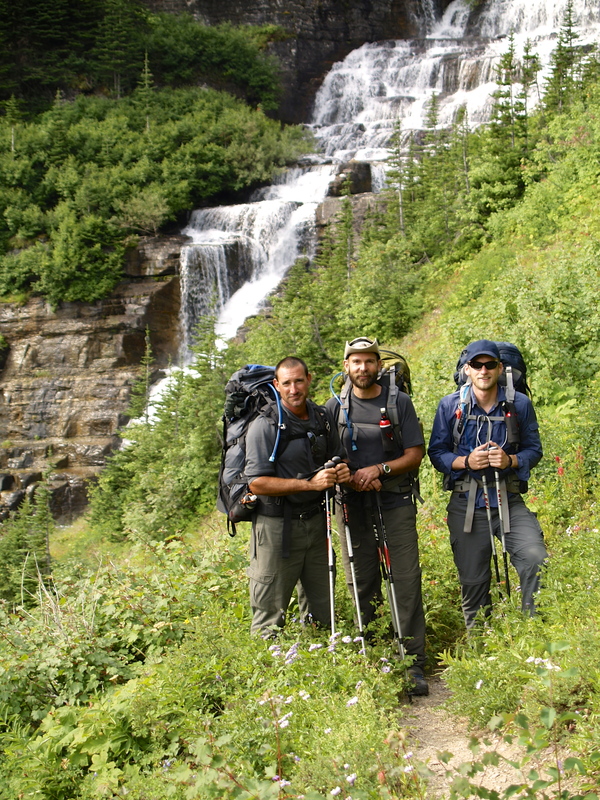 Drop your packs and hit the side hike to see the base of the falls. 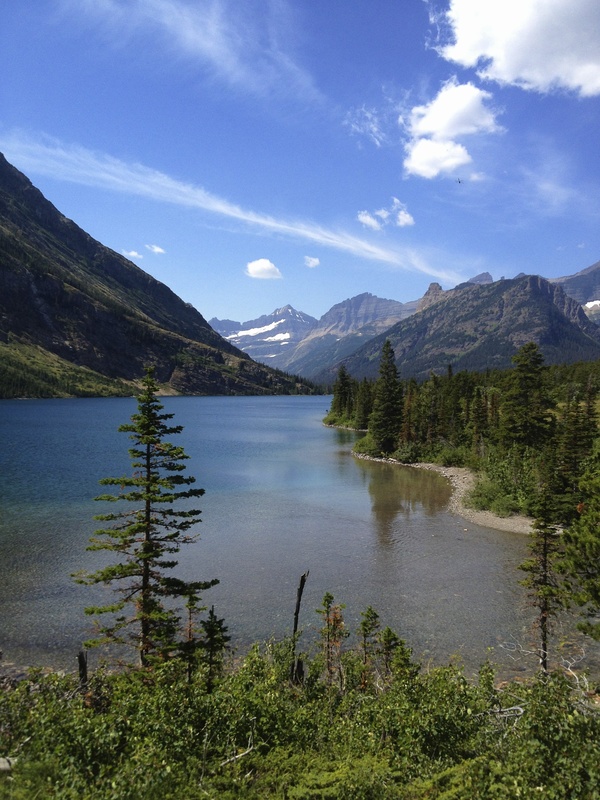 As you approach the junction with Indian Pass Trail be prepared for some of the most glorious views on earth. 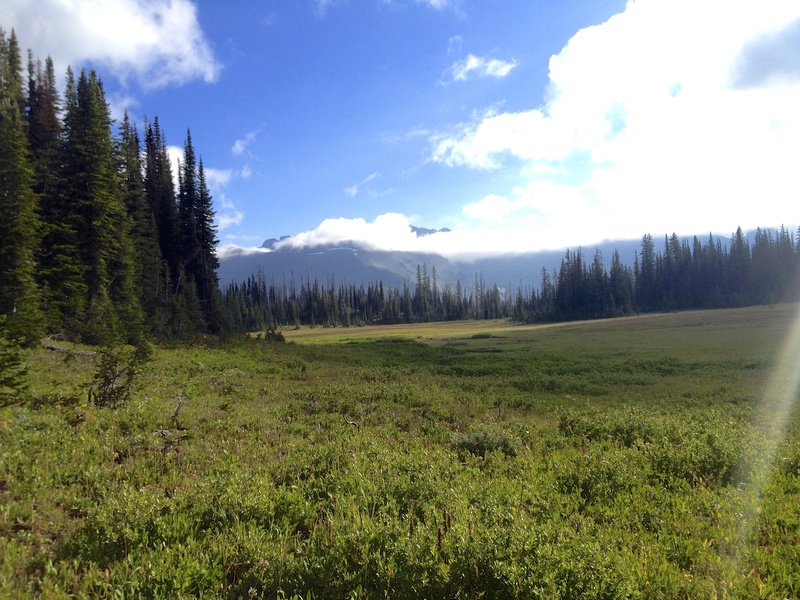 Cosley Lake comes into view on your left… and you have to take some pictures. You will see a guide line stretched from your side to the beach on the other side. 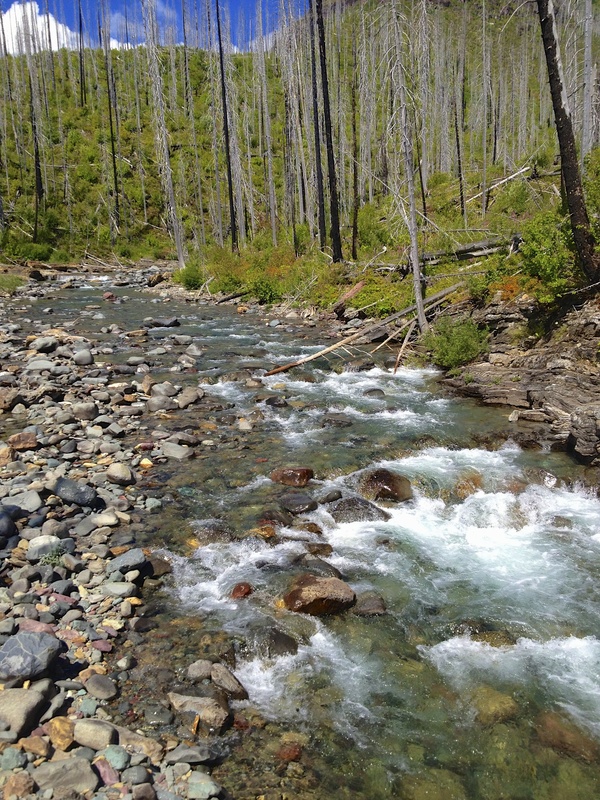 The stream that pours into Cosley isn’t very fast moving but it was about knee deep. 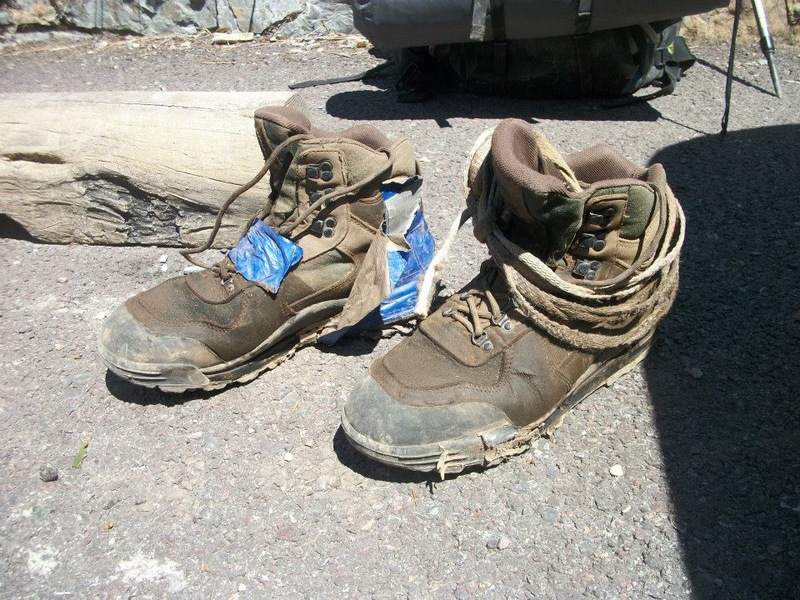 I tied my boots onto a carabiner on the back of my pack and put on my Merrell Barefoots and crossed. What a stunningly beautiful place. 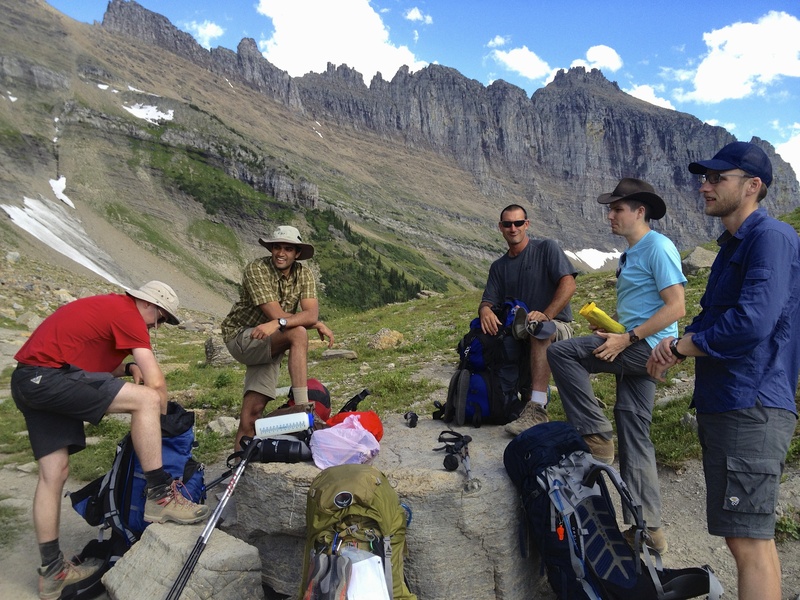 We decided to take a break for lunch another mile down Stoney Indian Pass Trail. 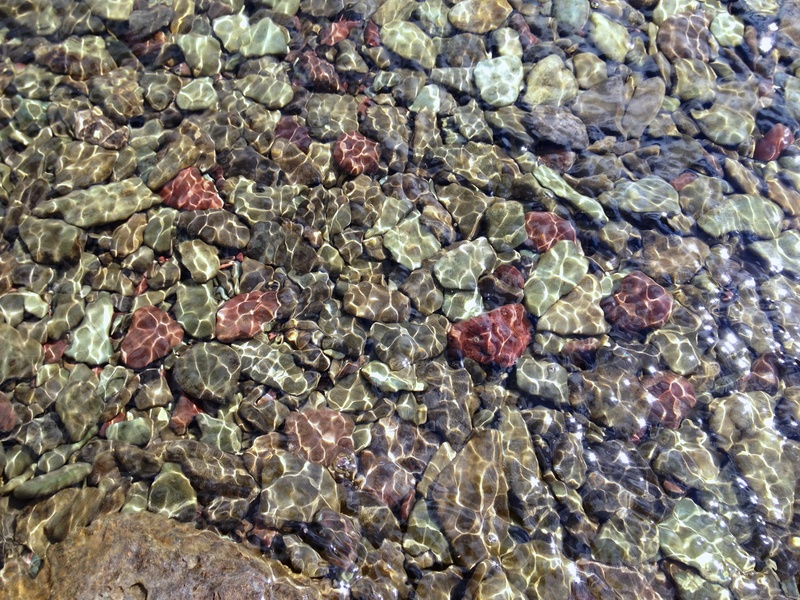 There is a really nice beach area at one of the campsites at the head of Glenns Lake. 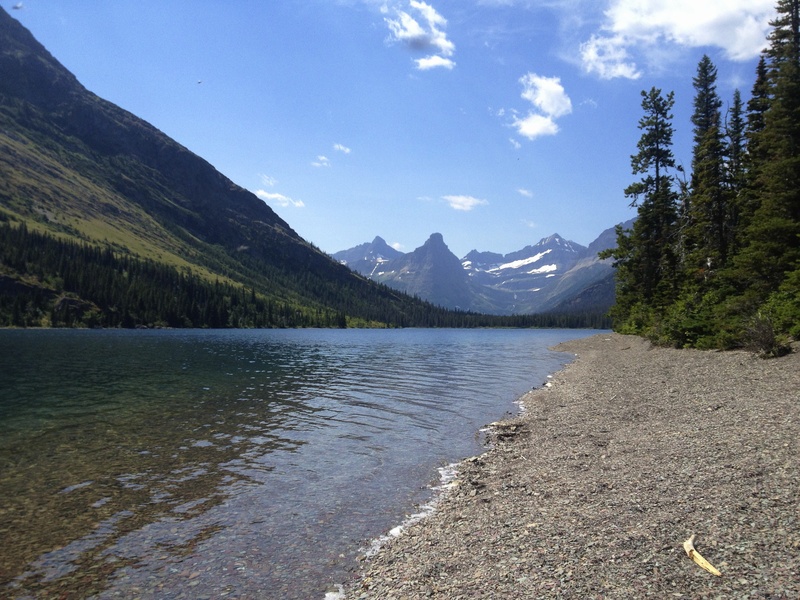 If you are going to take your lunch break here make sure that you eat in the designated food area… and then enjoy a swim in the crystal blue waters of Glacier National Park. 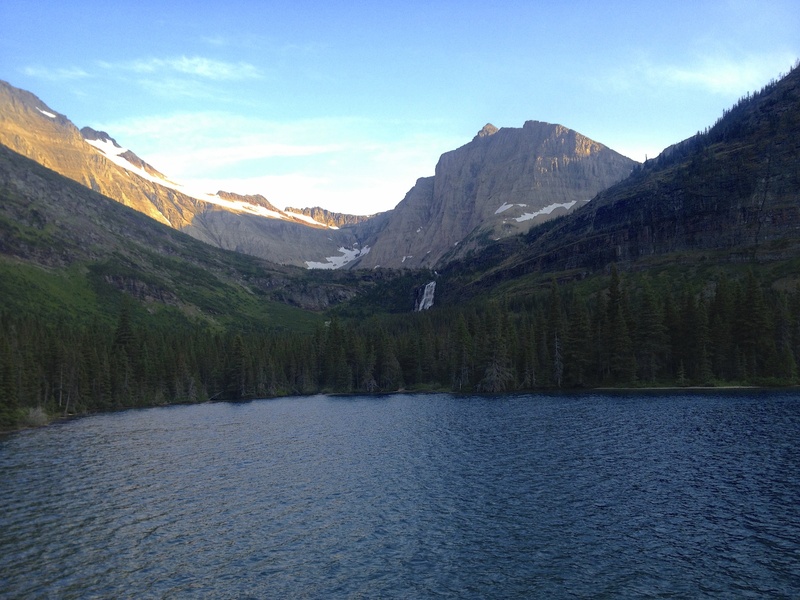 Indian Pass Trail hugs Glenns Lake until you reach Mokowanis Junction. Along this route it opens up a few times for some great shots of the lake, takes you across a few creeks, and introduces you for the first time to the Thimbleberry plant (edible by the way). Mokowanis Junction campsite is in the woods with no water view. It was likely our least favorite spot to camp BUT every single spot in this park is incredible… so it is relative. 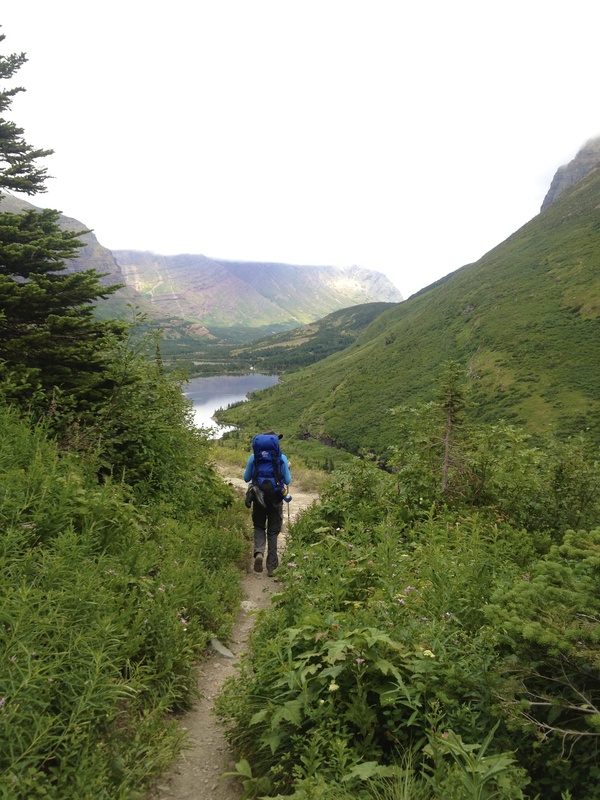 Once you set up camp and get your food secured… take a hike down toward Mokowanis Lake. 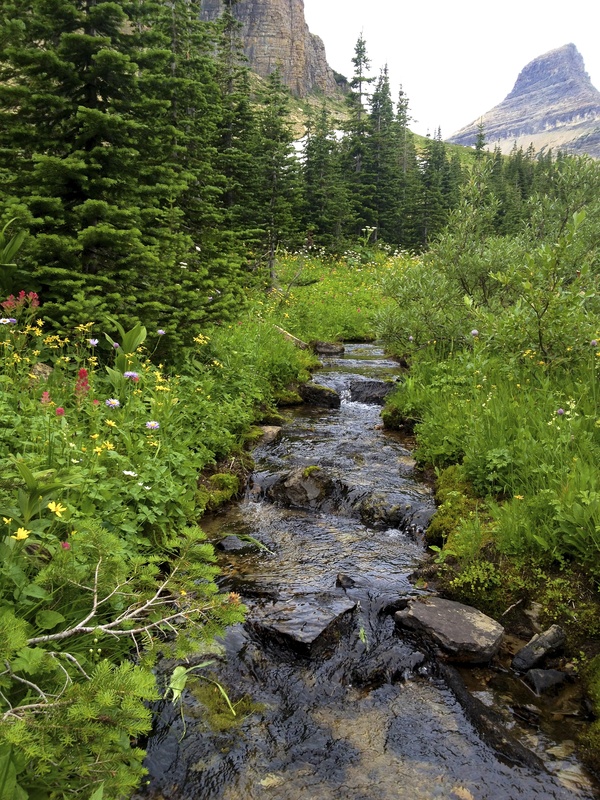 You will cross a creek that pours into Glenns Lake. 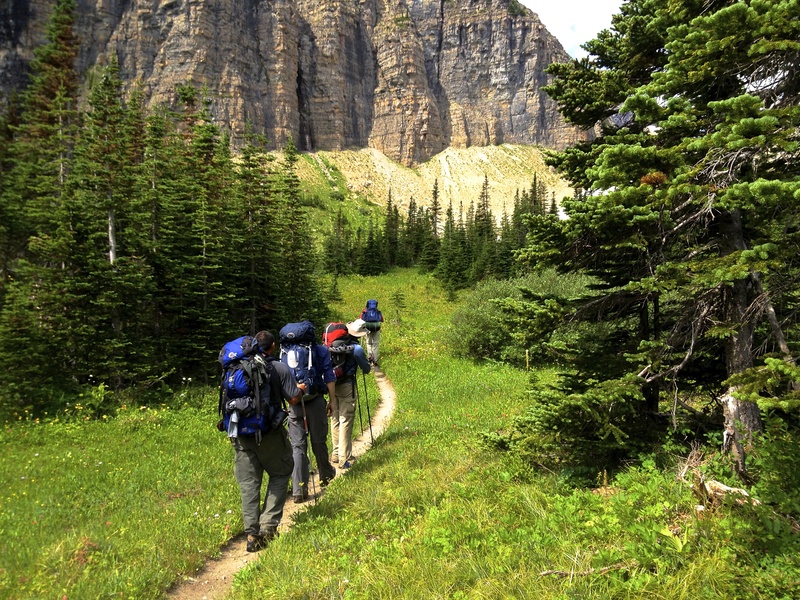 Continue on the trail and you will see Pyramid Peak directly in front of you. Another half-mile and Mokowanis Lake and Mokowanis campsite comes into view. 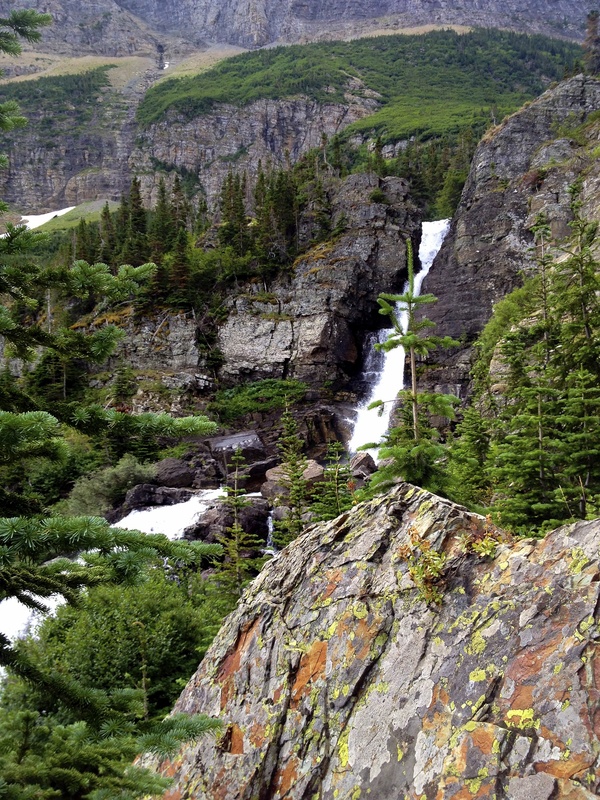 If you head right off of the trail there is an amazing ledge that overlooks the lake with an amazing falls on the other side. Don’t miss this. It is amazing. In the next post I will be detailing our hike from Mokowanis Junction to Stoney Indian Lake. 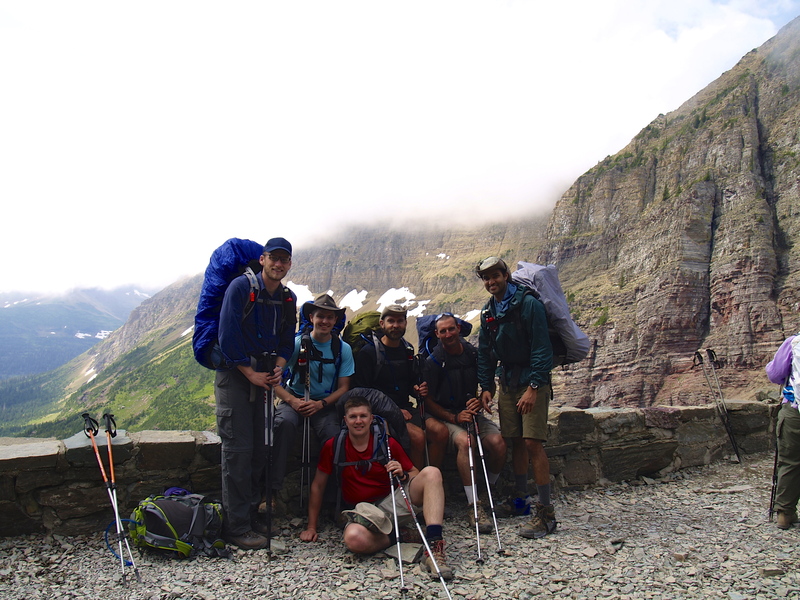 We packed up early at Many Glacier as we had over ten miles and significant elevation in front of us. 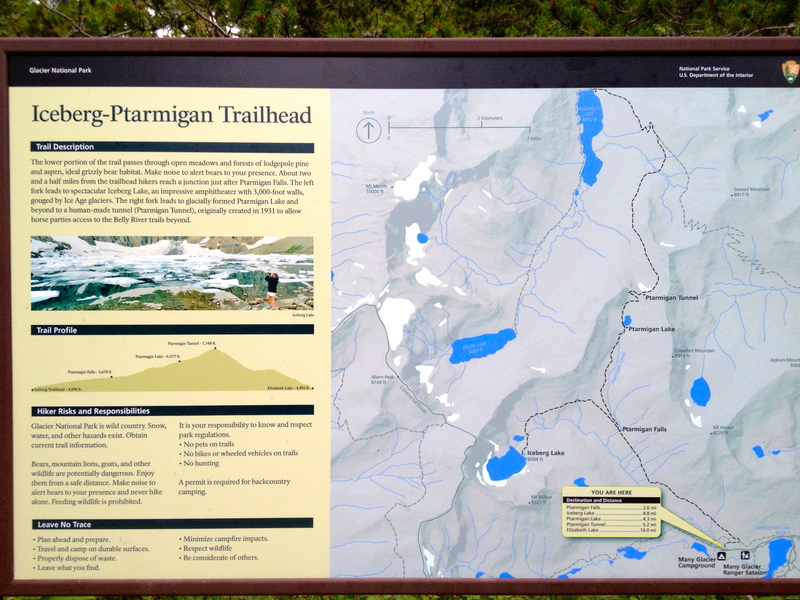 Day 3 would have us traveling Ptarmigan Trail over 2400 feet up to Ptarmigan Tunnel, which is a very cool spot, and then descending down to Elizabeth Lake. 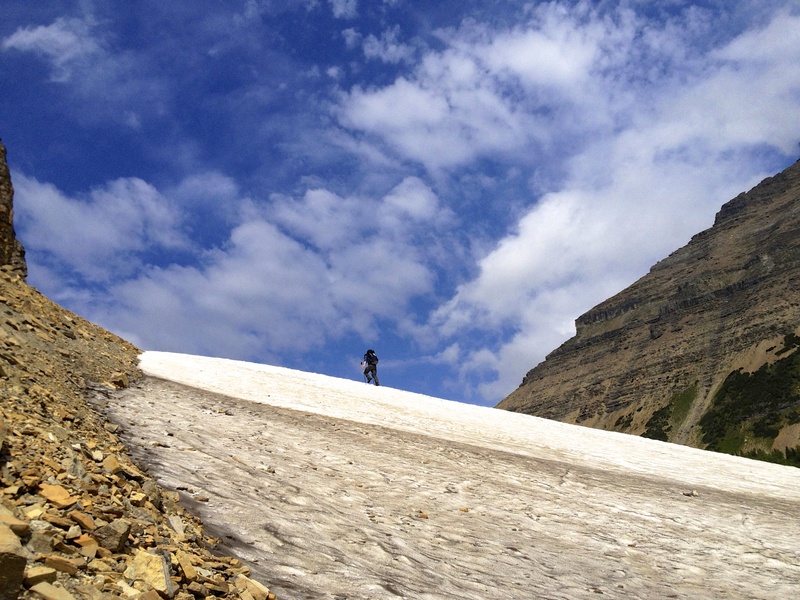 Leaving Many Glacier we saw Ranger led tourist groups who would be traveling the same trail up to Ptarmigan Tunnel. 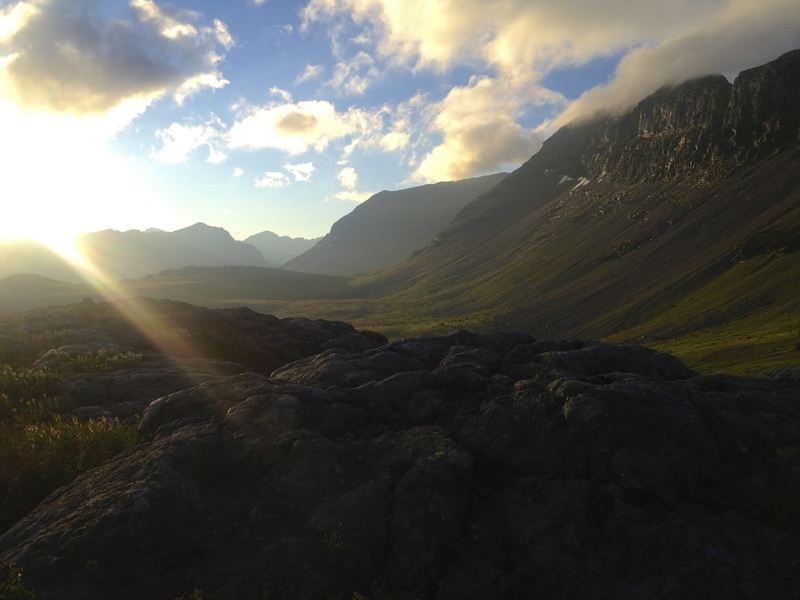 Ptarmigan Tunnel is the last location along the remainder of the North Circle Route where we would encounter day hikers and tourists. The morning began a bit overcast and we were confident that we would eventually run into some rain at some point. 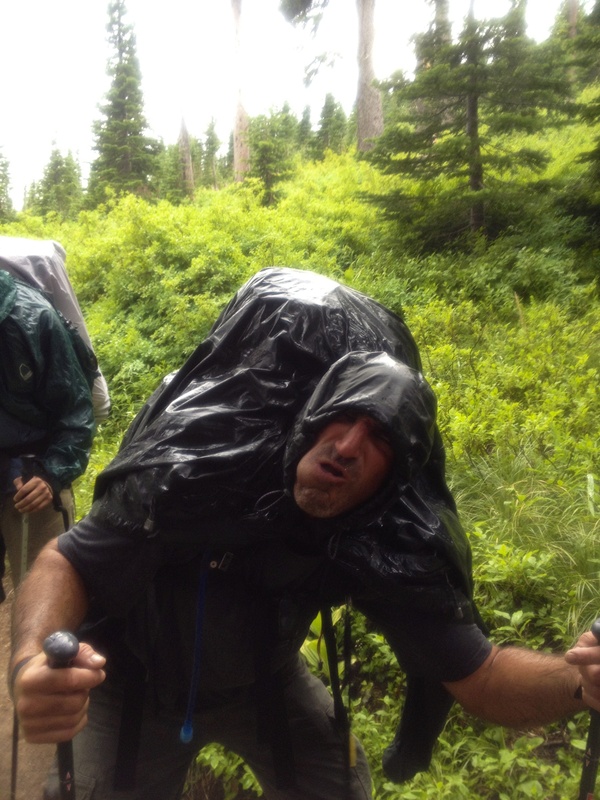 Needless to say that we had our pack covers and rain jackets readily accessible. 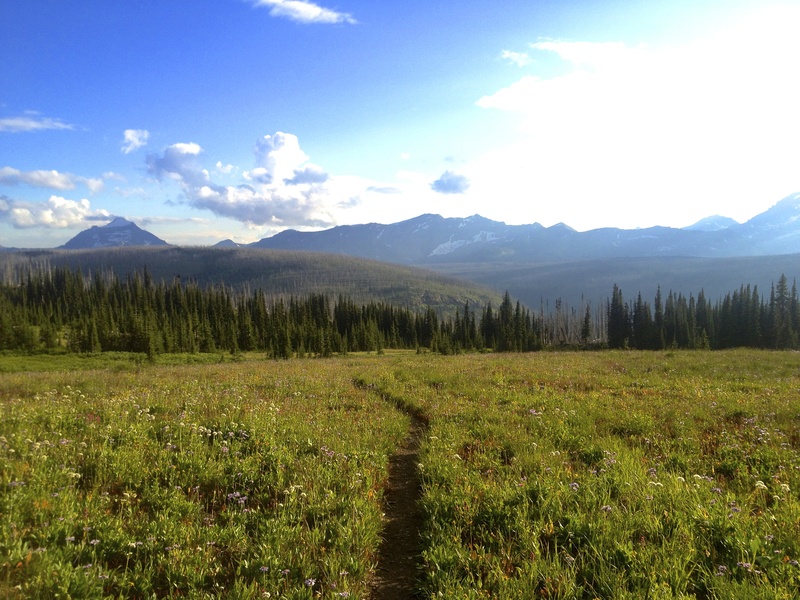 Ptarmigan Trail is heavily used and well-maintained. Our ankles and knees appreciated the fine, dusty dirt trails. 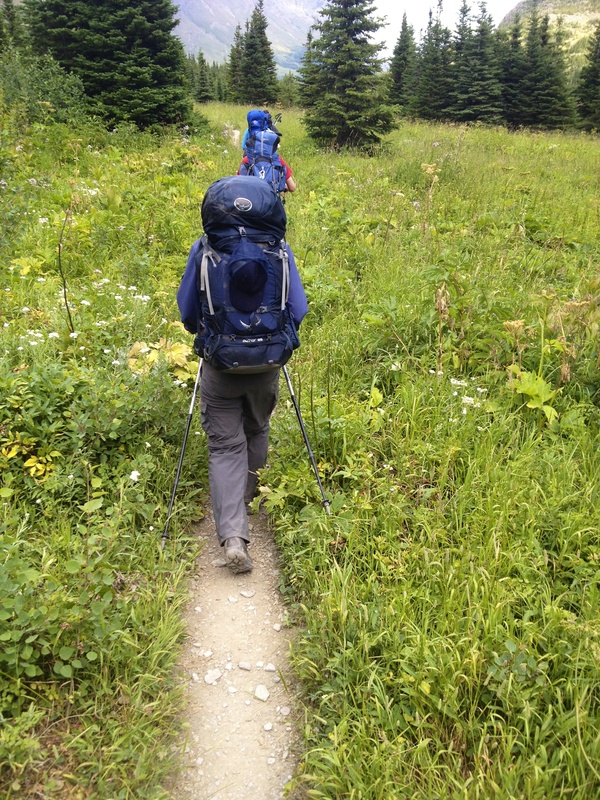 In the days to come the trails would not be so well-maintained… primarily because they do not get as much traffic and there is significant plant growth over the trails… but more on that in another post. 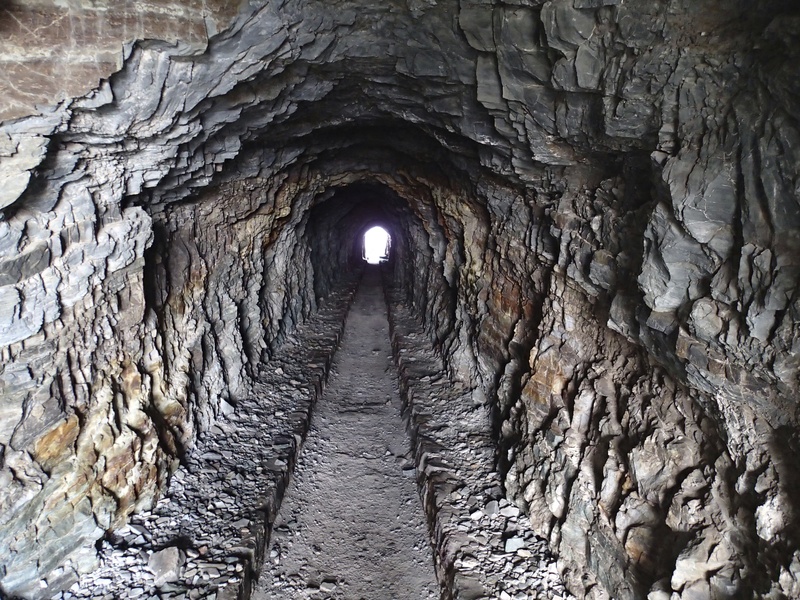 For now, we are enjoying the gradual ascent up to the tunnel. Once Ptarmigan Lake comes into view the tunnel does not seem to be very far away, but it is still a couple of miles and several mountainside switchbacks away. 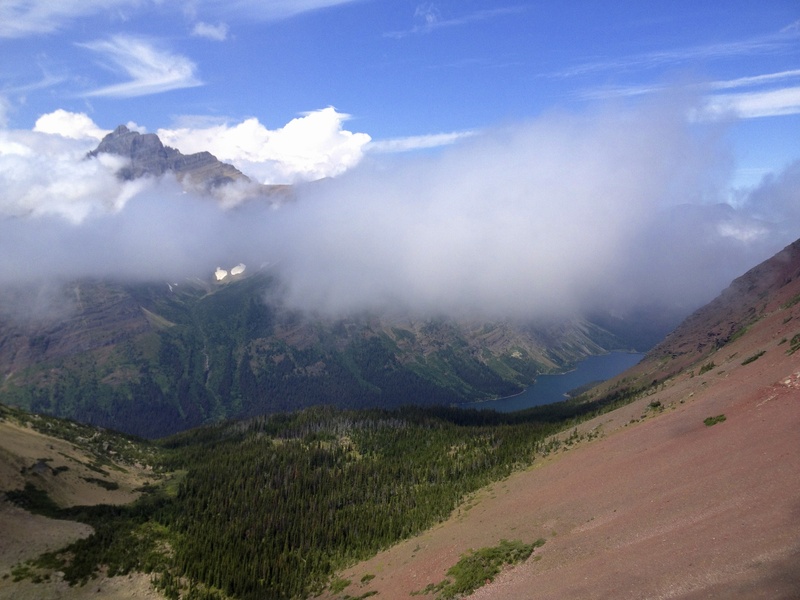 The switchbacks offer a beautiful southern facing view of Ptarmigan Lake and Mount Wilbur in the distance. 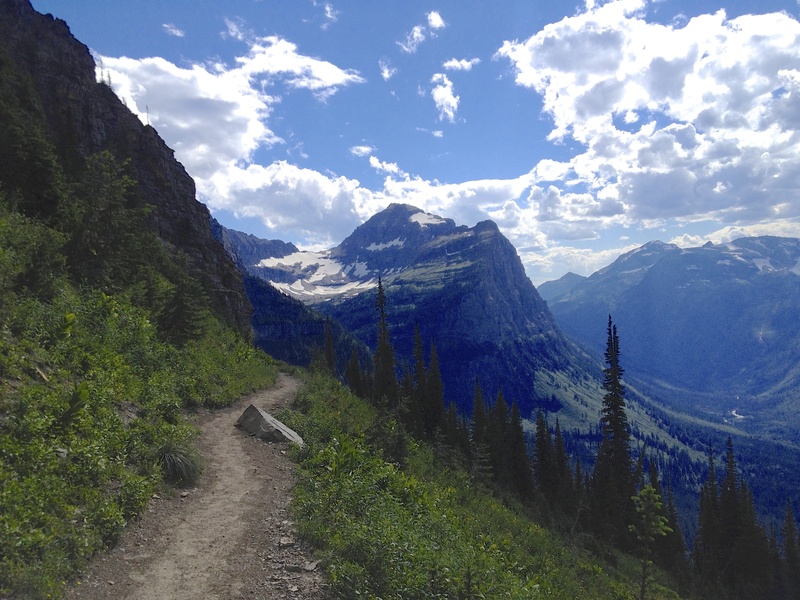 Make sure you stop along the switchbacks to take it all in… it’s spectacular. 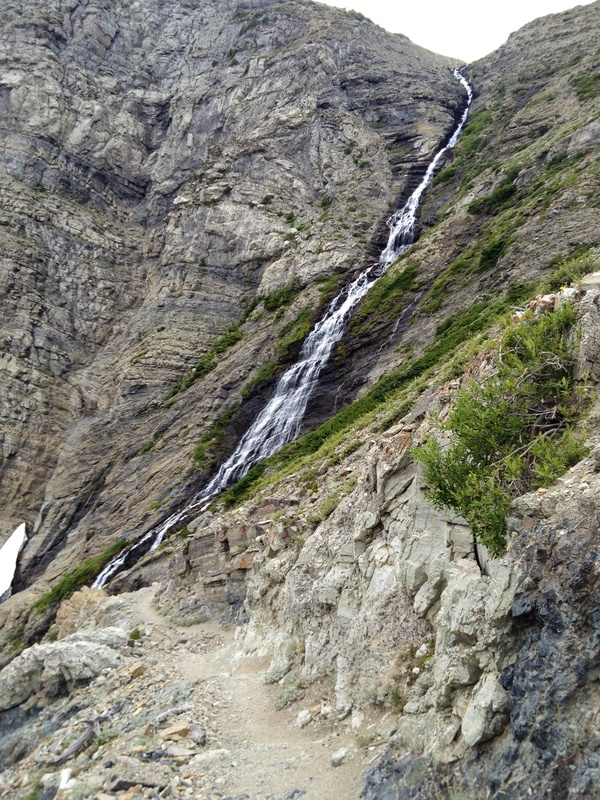 Ptarmigan Tunnel is passed the half-way point from Many Glacier to Elizabeth Lake. Passing through the tunnel has a real sense of accomplishment and, at least to me, signified the break between day hiking and backcountry backpacking. 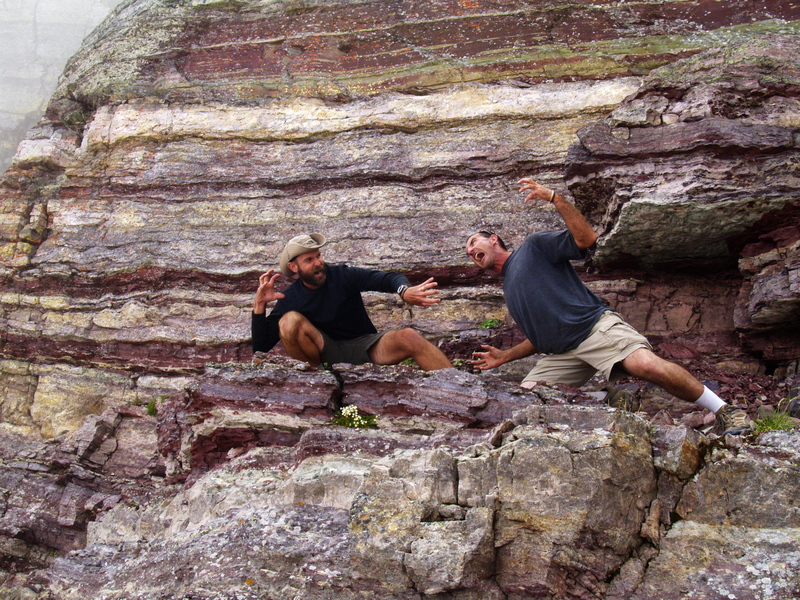 We stopped for a significant lunch break and took the opportunity for some pics and for some fun. You will notice the cloud cover hovering just above our heads. 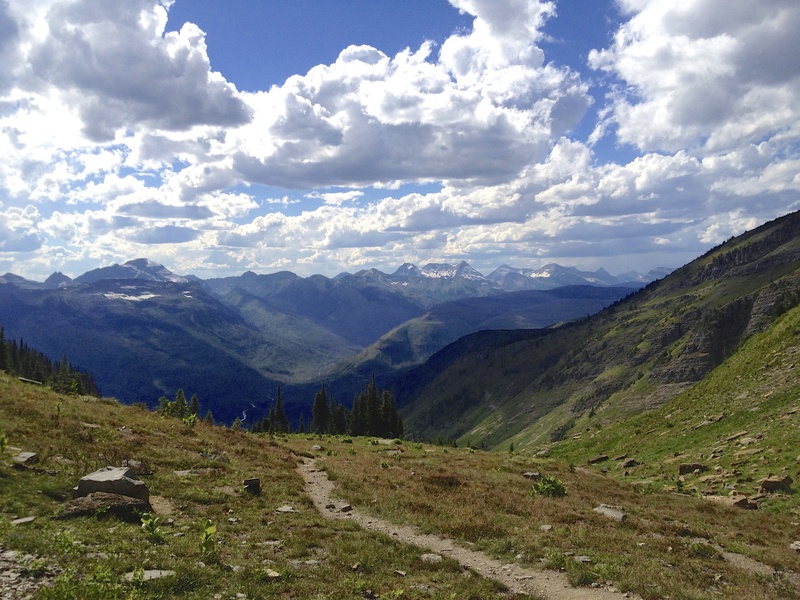 As we descended Ptarmigan Trail the clouds began to break… opening the skies for some much needed sunshine. At this point the trail was composed of a fine, brick-like rock which was, again, easy to hike. As we started down this portion of the trail we could see Elizabeth Lake coming into view. 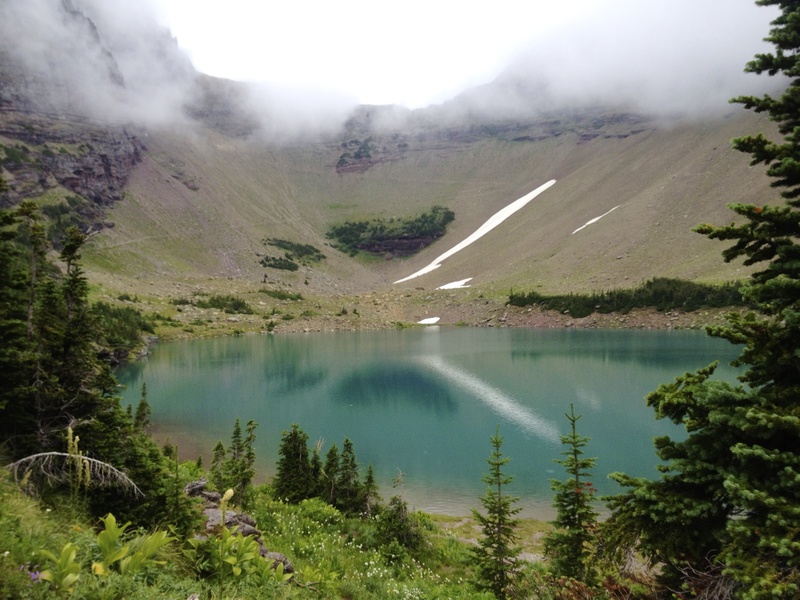 I remember stopping and saying, “This spot may be the most beautiful place I have ever been in my life.” I would subsequently say the same thing later that evening at Elizabeth Lake and then again at Fifty Mountain on Day 7. Pictures are so inadequate. 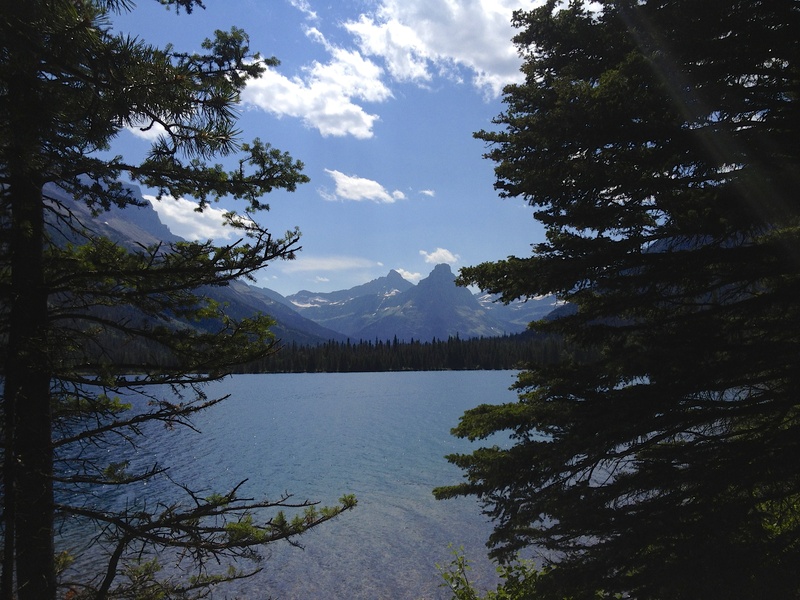 The Elizabeth Lake FT campsites are located on the north side of the lake, which is closest to the trail. 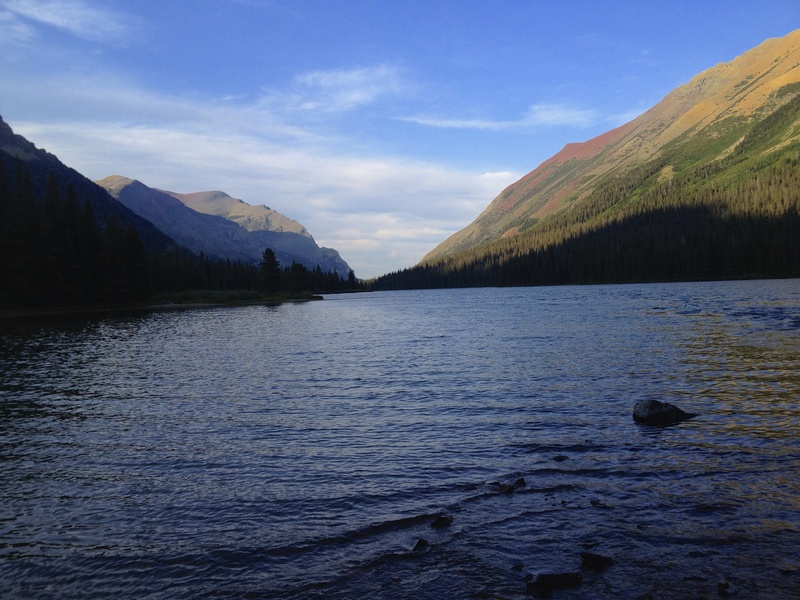 If you are staying at the campsites labeled as Elizabeth Lake… they are at the south end of the lake, which adds an additional mile to your hike as you can only arrive there by first passing Elizabeth Lake FT and then hiking southward around the lake. At this point I should note a couple of things. 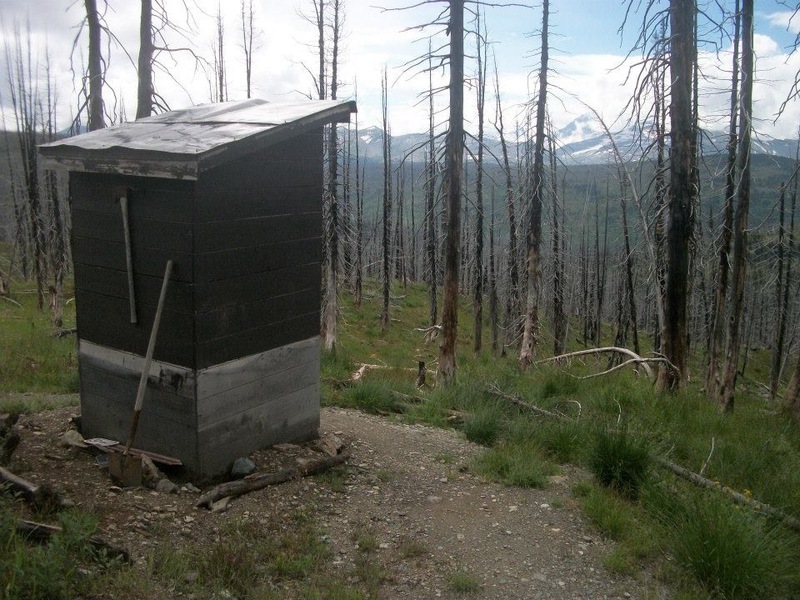 You are now legitimately in the backcountry. Please take ALL precaution with your food. Immediately store your food in the metal bins in the eating area and DO NOT leave your food unattended even for a split second. 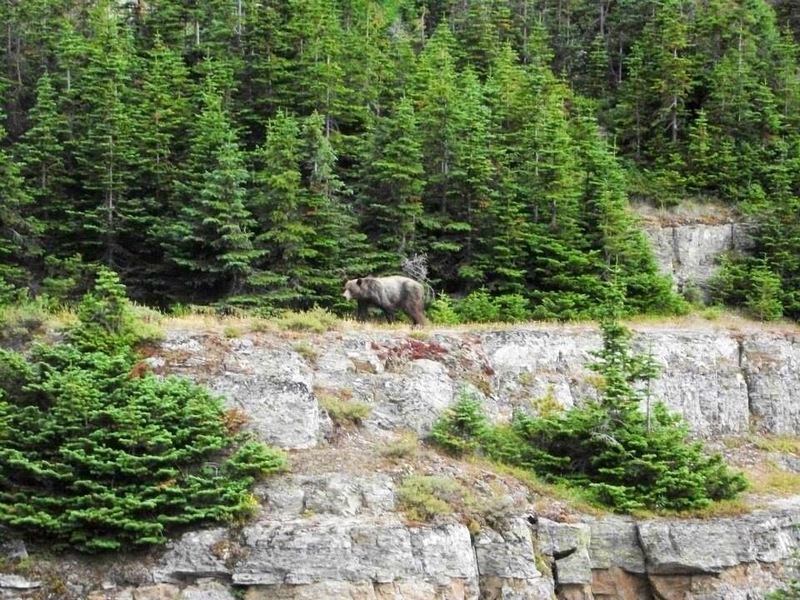 A few hundred yards from our camp (but only 50 feet from us) we saw a very large grizzly. Fortunately we had been making enough noise that he wasn’t alarmed and he subsequently moved along. The animals WILL come into your camping areas to take your food. Early the next morning as we were packing up a Ranger approached us and asked for our permit and also asked where our food was located. We told him that we had already put it in our packs so we could leave. 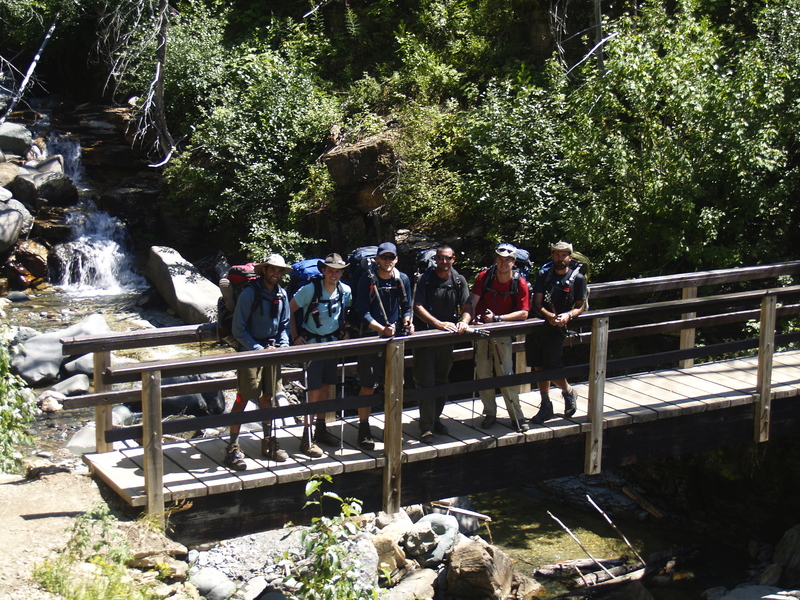 Six out of seven of us had our packs with us so this wasn’t a problem. Unfortunately one guy in our group had packed his food but left his backpack unattended by our tents. The Ranger reprimanded him for his carelessness and told him/us that we could very easily write a citation for the offense. He spent thirty minutes with us telling us stories as to why it is essential that we always keep our food with us or stored away. The most notable reason is that once a bear eats food in the camping vicinity, the park has to close down that area for over two weeks so that the bear will no longer connect that area with food. 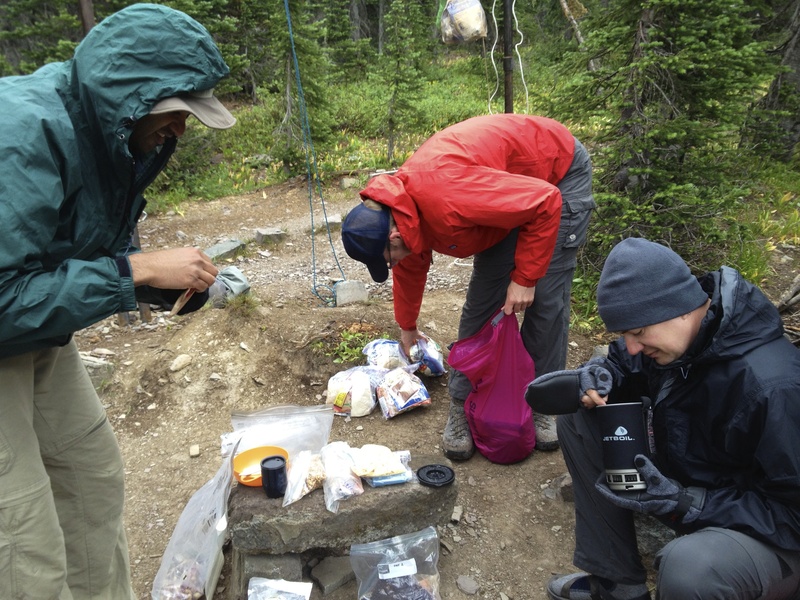 For the sake of the bears and for the sake of future backcountry campers, take all necessary precautions with your food. I hope that you enjoy Elizabeth Lake as much as we did. 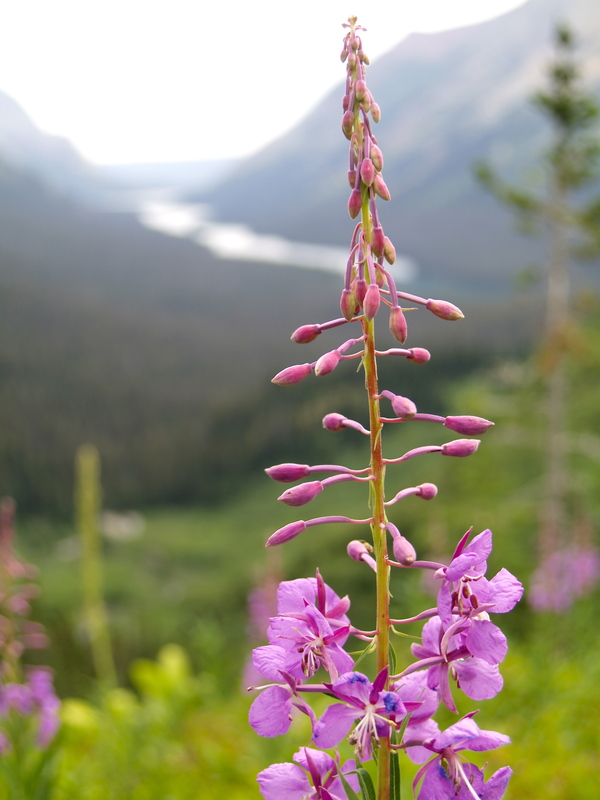 In the next post I will be detailing our hike from Elizabeth Lake FT to Mokowanis Junction. There have been a rash of reports in the news recently (here is one from CNN) about bears attacking and mauling unsuspecting victims . Since last Thursday (just 4 days ago) there have been seven attacks on humans by bears in Michigan, Idaho, Wyoming, Alaska, and Colorado. 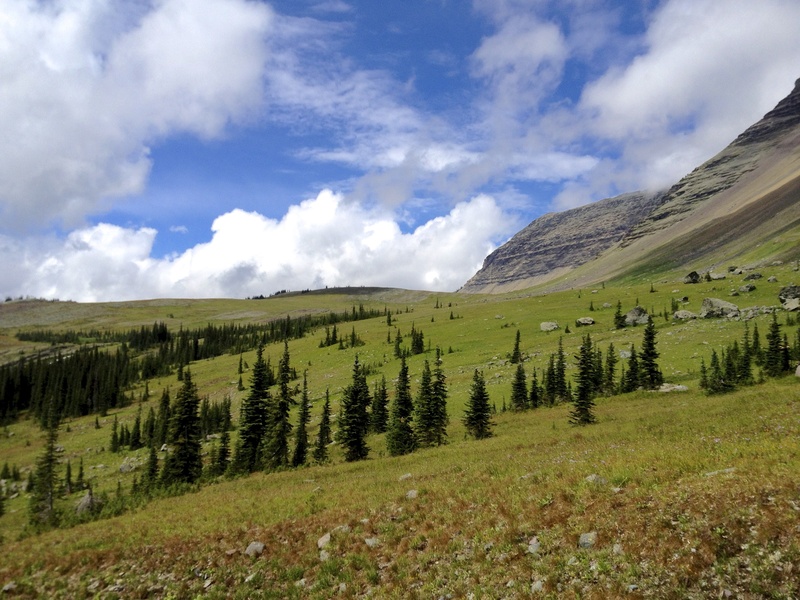 I was planning to write a post at some point about bears and the proper precautions to take when in bear country, since I just completed a 70-mile backcountry hike in Montana and saw two bears along the way. But being that there has been so much press about bear attacks, it may be the right time to write while people are paying attention to this issue. 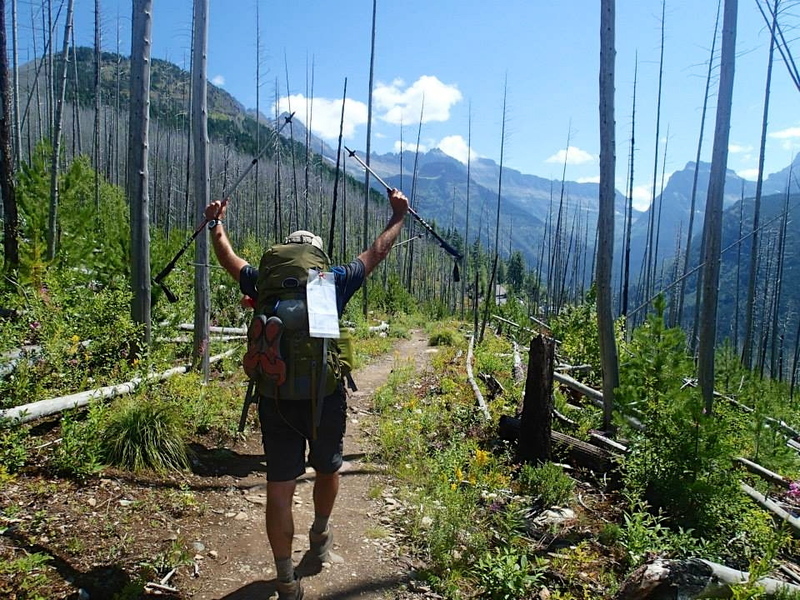 It never ceases to amaze me how many people I encounter on trails, and yes sometimes in the backcountry, who are ill-equipped, ill-prepared, or who have completely neglected studying, researching, or seeking out good advice. Keep in mind that I was in Grizzly Country. So I did my research in advance to insure that I could control everything that was in my control. Yes, there is always a chance that something could happen in which you can’t control the situation BUT you can control those things that can be controlled- so plan, read, and equip yourself with the best advice in order to eliminate as much risk as possible. 1. 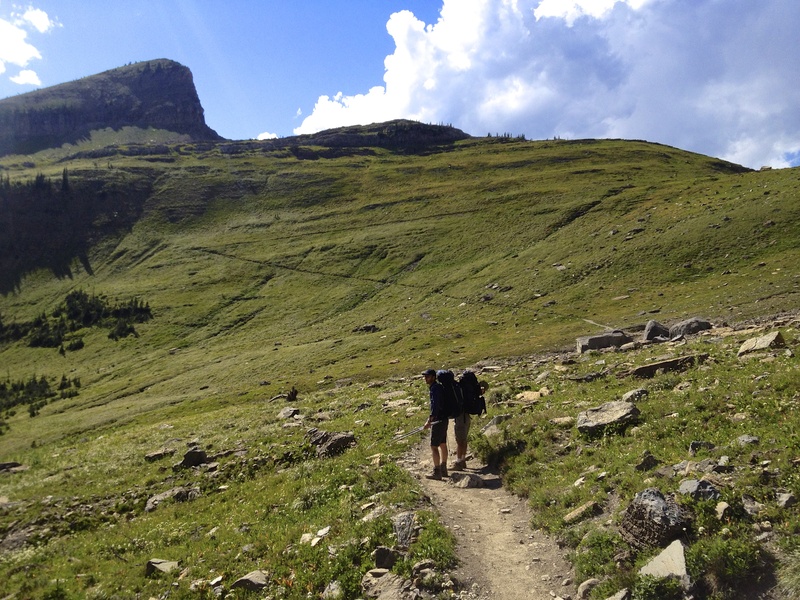 I saw individuals hiking alone (without bear spray). 2. 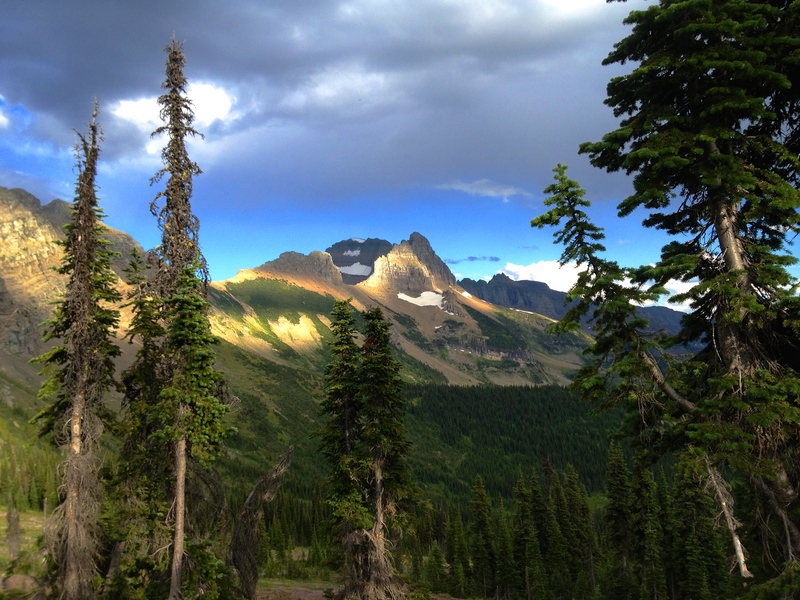 I saw two young girls hiking together at dusk in the backcountry (without bear spray). 3. I saw both individuals and groups hiking without making loud noises to alert bears they were in the area. 4. I had a guy admit to me that he and his wife DID NOT take time to hang their food away from their camp… instead keeping it in their tent overnight. 5. I witnessed a young lady emptying the contents of her backpack (including food) then leaving the area… only to have a bear walk right passed the food. 6. I saw a group of a dozen tourists run into woods along a trail to get a peek of three moose (a baby with it’s parents)… only to have a Ranger run after them in frustration. 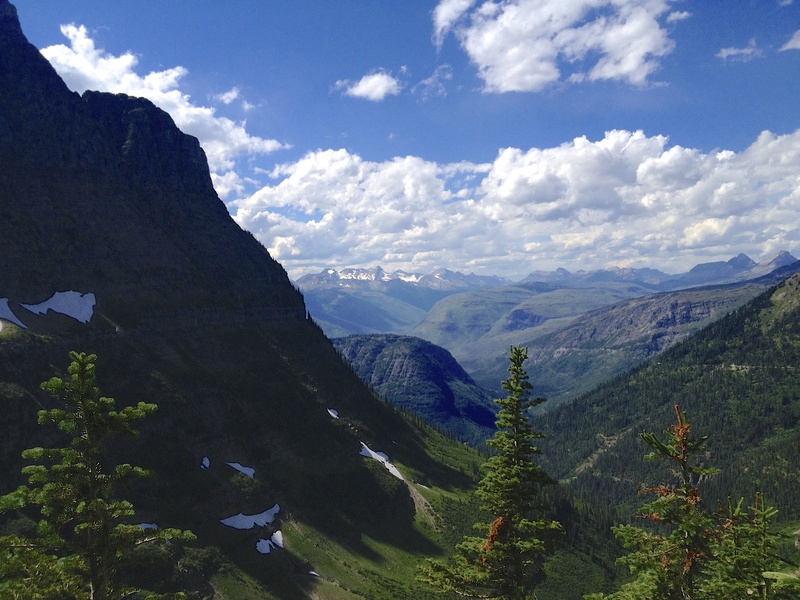 This was in the span of eight days in specific locations in Glacier National Park. I can only imagine how much carelessness goes on each day around the US in bear populated areas. I believe the reason that so many people are so careless when in wild areas is because they really do not think they are in any imminent harm or danger. We kind of have a “zoo” mentality that everything is controlled and that there is no real way I will be in a precarious or life-threatening situation. The problem with this mentality… is that it is careless and wrong. When we go into nature we are entering the home of wild animals. That’s just the bottom line. To that end, we should ALWAYS enter with the utmost caution and always be prepared for the unexpected. I heard about a guy a couple of years ago in eastern Kentucky who saw a black bear walking along a trail a couple hundred feet in front of him. Rather than stopping and simply letting the bear go on its way… he followed it. He walked behind the bear and took pictures of it so he could show his buddies and wife. And then the bear turned around and began to walk towards him. He slowly began to back away but the bear got closer. Nervously, he continued to back away but eventually backed right into some steps and fell to the ground. The bear attacked him and tore him up pretty good. One hundred and seventy stitches good. 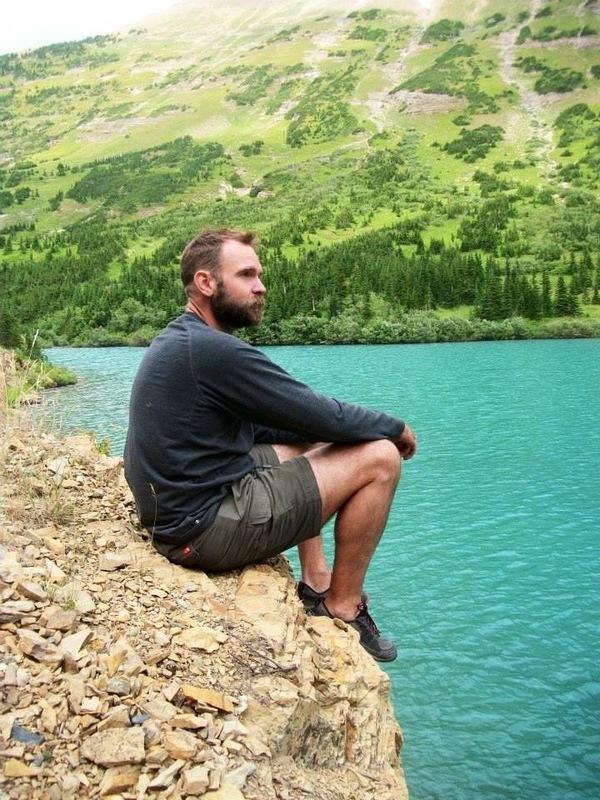 So what are some good pieces of advice to take with you in bear country? This isn’t an exhaustive list by any stretch, but certainly some pieces of advice to chew on. I would recommend doing even more research in addition to talking to park rangers about additional precautions that may be taken. 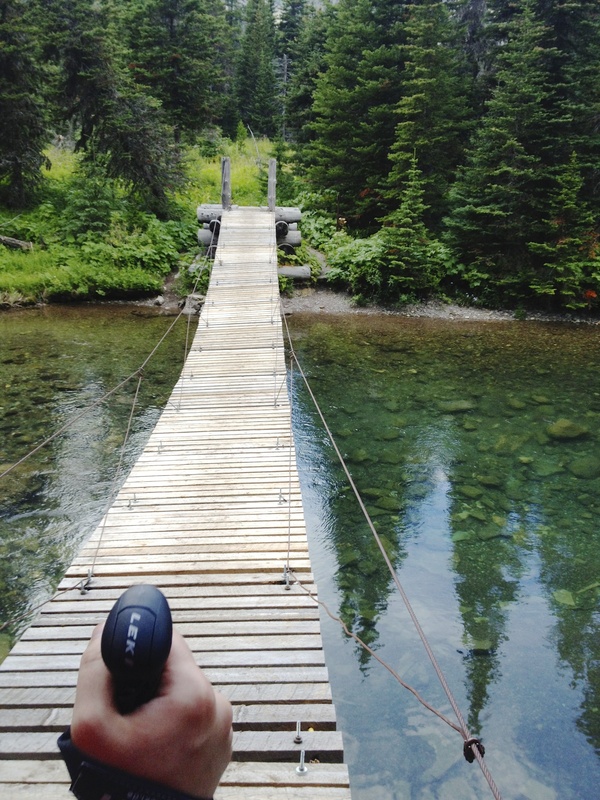 – Always have BEAR SPRAY on your person. From the studies that have been done bear spray is more effective than a firearm in dissuading a bear from attack. – Do not hike alone. 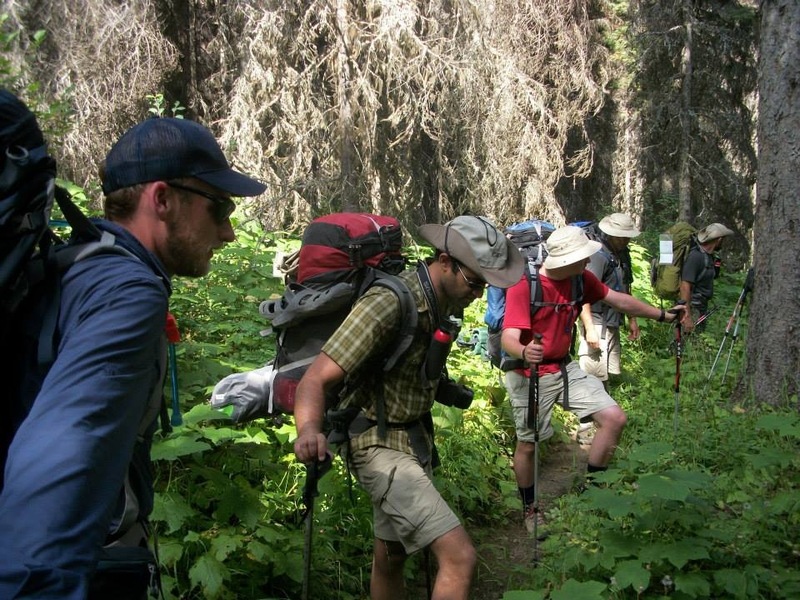 Hike with others and make plenty of noise. The noise won’t scare the bears. It simply alerts them that you are coming so that they aren’t startled. Attacks may happen when you startle an unsuspecting bear. 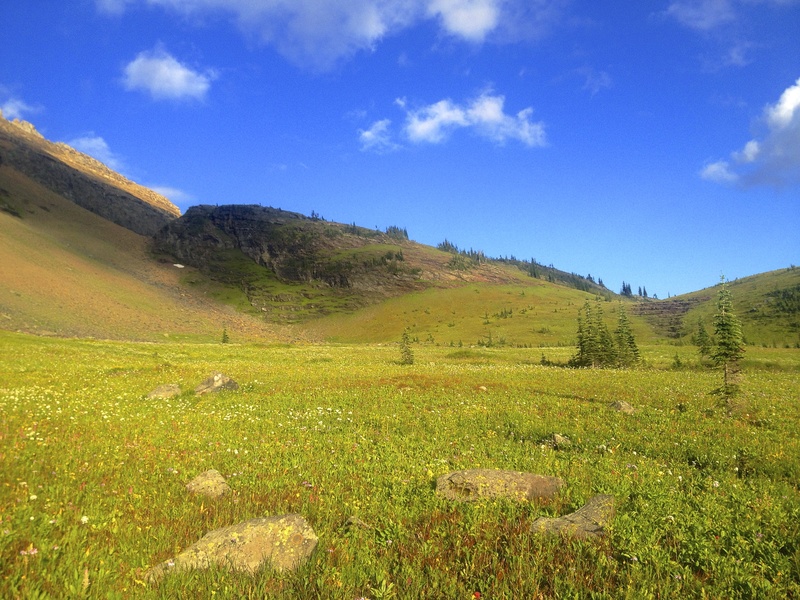 – Try to avoid hiking at dawn/dusk as this is the time when bears are active and feeding. – Do not approach a bear cub AT ALL… even if it is super cute. You are asking for the protective mother to tear you apart. 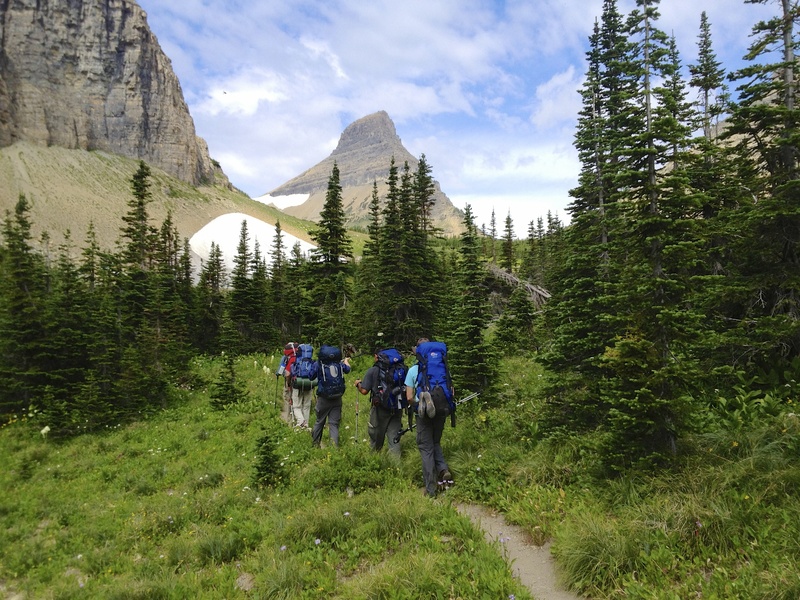 – Put all of your food and smelly stuff in a rain proof bag and hang it by rope over a tree branch a hundred or more feet from where you sleep- or- put your food in a bear canister and place it away from your camp. 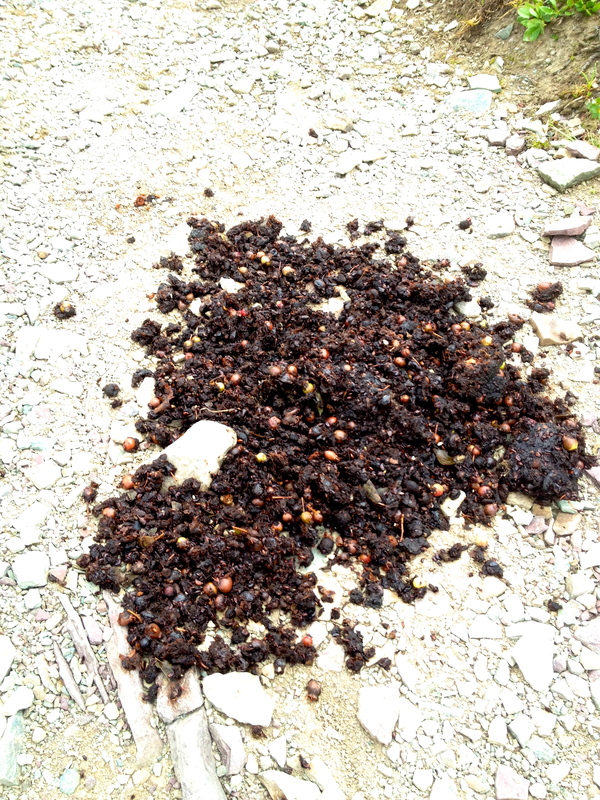 – Do not leave food at your camp unattended… even for a second. – If you encounter a bear, slowly back away and resist the urge to turn and run. – Do not move forward until the bear has cleared out of the area. – If a bear begins to move toward you… throw something between you and the bear. Hopefully the bear will be more curious about the item you tossed so you can continue backing slowly away. – If a bear begins to attacks, fall belly to the ground protecting your head and neck with your arms. 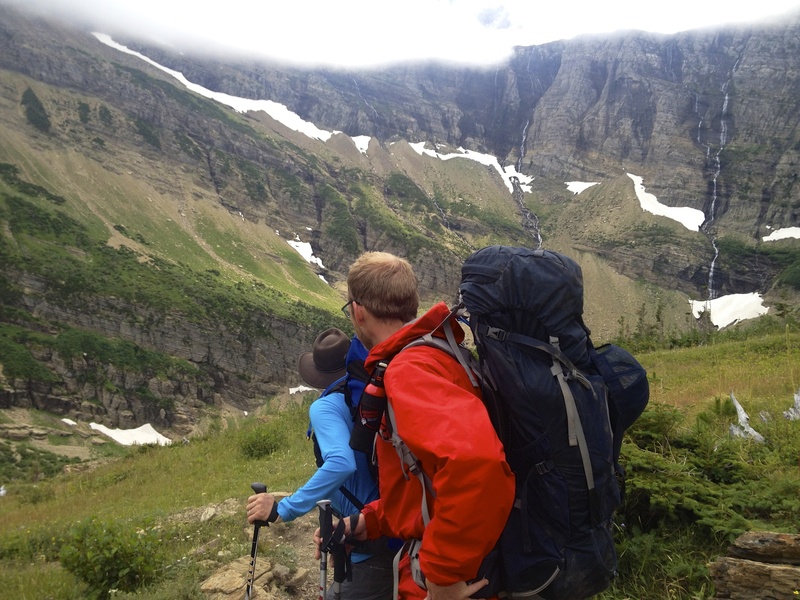 If you are wearing a pack, it may protect your back. 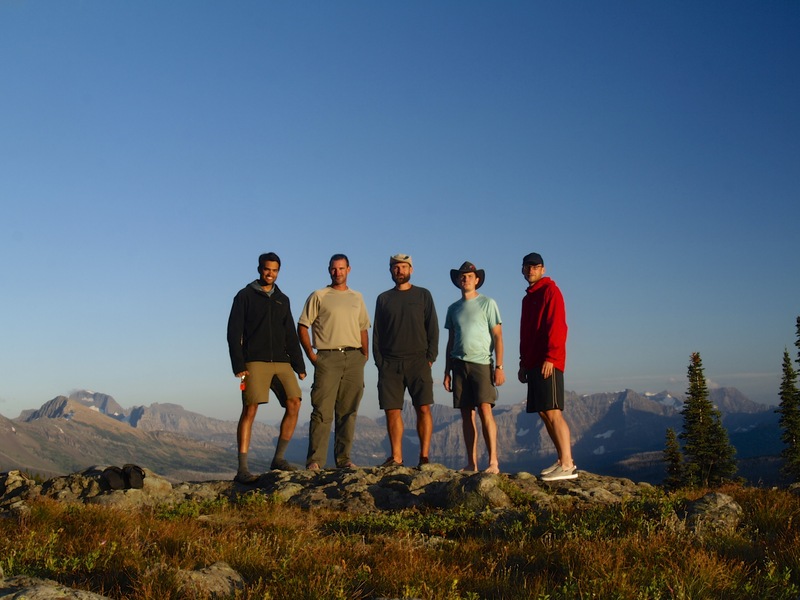 Since you are traveling in a group… they will spray the bear with bear spray. Again, this is not a complete list. 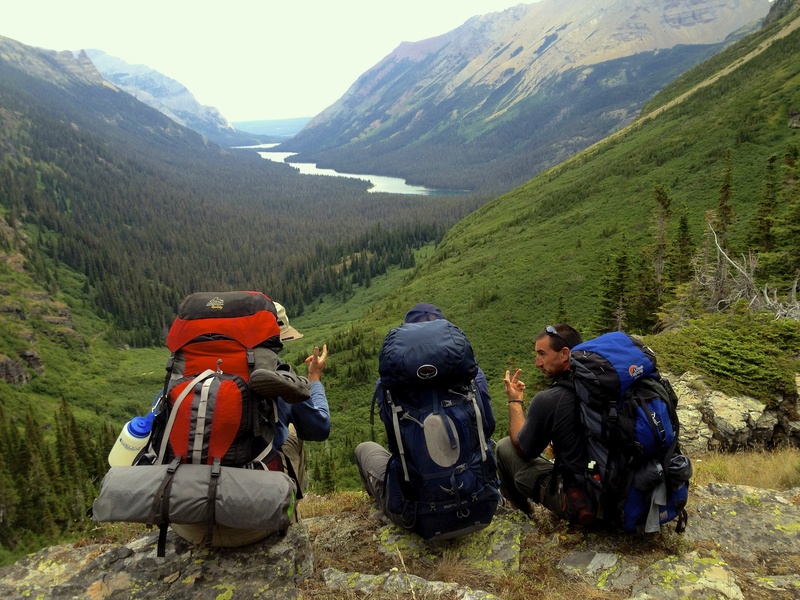 But a good beginning for you to read and study about the proper precautions in which to take before journeying into the wild. 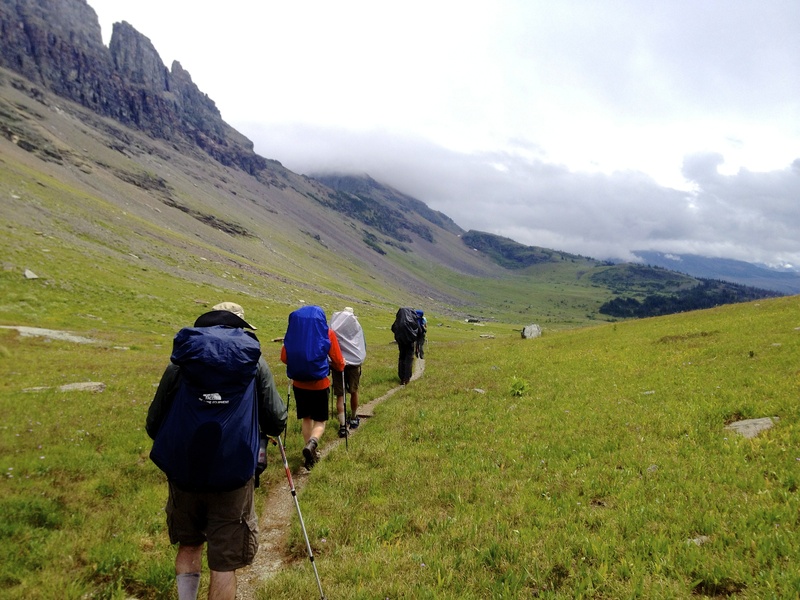 Granite Park to Many Glacier takes you along the Swiftcurrent Pass Trail up to the Swiftcurrent Pass, which can pose a snow hazard during parts of the season, and then down to the popular Many Glacier area. Despite it being the end of July the temperatures at elevation where a bit low seasonally. On Day 1 I mentioned that it began to get cold, forcing us to put on additional layers to stay warm. You may wonder why we don’t just start a fire and warm up. Well it’s easy- the park does not permit fires in the backcountry (only in designated areas). 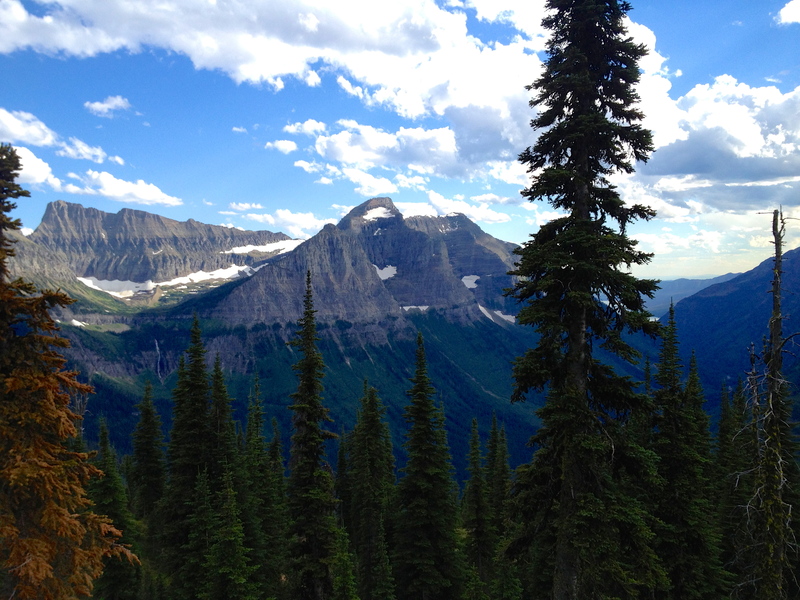 On our eight hike only one area allowed a fire… Many Glacier. Oddly enough we ended up not making a fire on that night. For some background, the park had two significant fires a decade ago that ravaged 30% of the park. You will notice in my pictures for Day 7 and 8 that many of the pine are burnt and charred. They are the casualties of the fires. One of the fires was started by lightning and the other intentionally by a person. So while it is unfortunate to not have fires while camping, I completely get it and agree with their position. All in all it meant that we went to bed just a little earlier, which probably helped all of us. The morning was incredibly foggy at elevation. This obviously inhibited any early morning site seeing. What we did see, however, was snow! Any like any group of children that you have ever seen… we had to go play in it! One of the guys asked at one point if bears would be up this high on the mountain. It wasn’t five minutes before he got his answer. 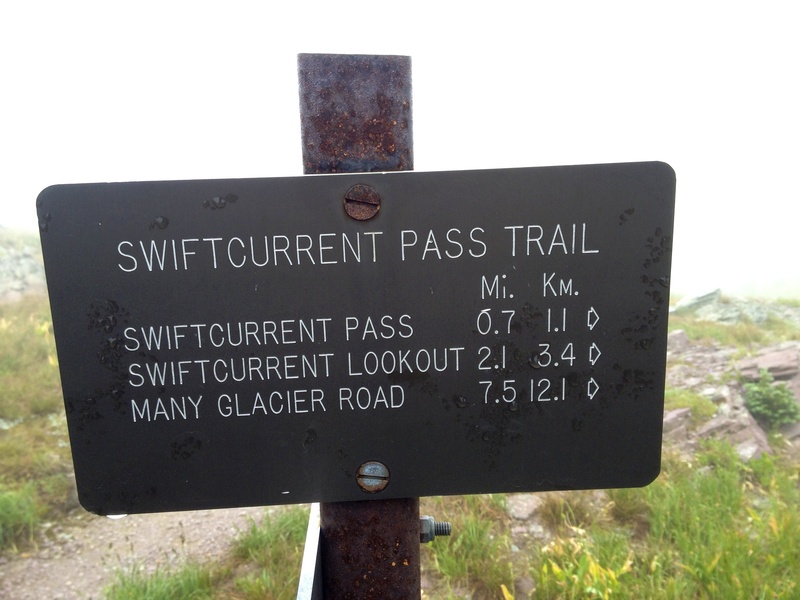 One of the coolest portions of the trail was close to Swiftcurrent Pass. 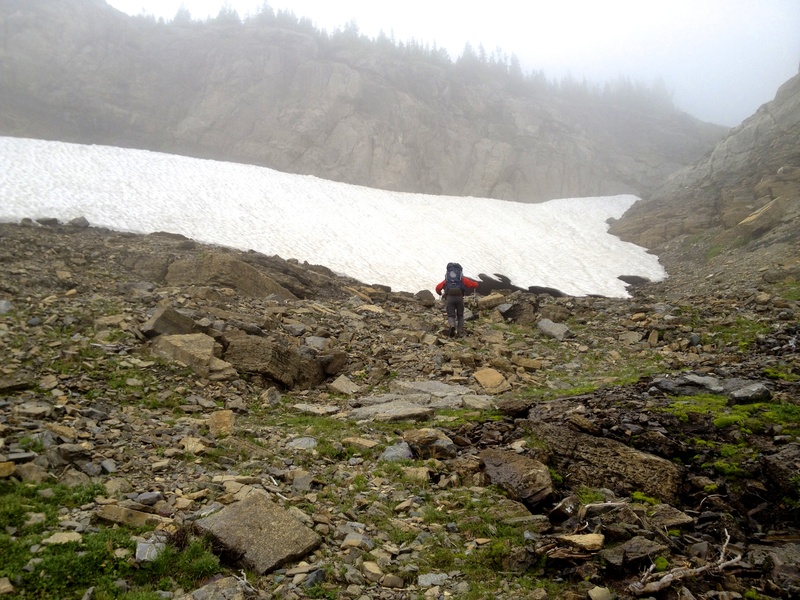 Up the hill from the trail was a large sections of frozen snow that had begun melting from the bottom-up. This created a very unique tunnel beneath it. Of course there was no way we were going to go passed the opening of it for fear of it collapsing on us. But it was really wild to look at. 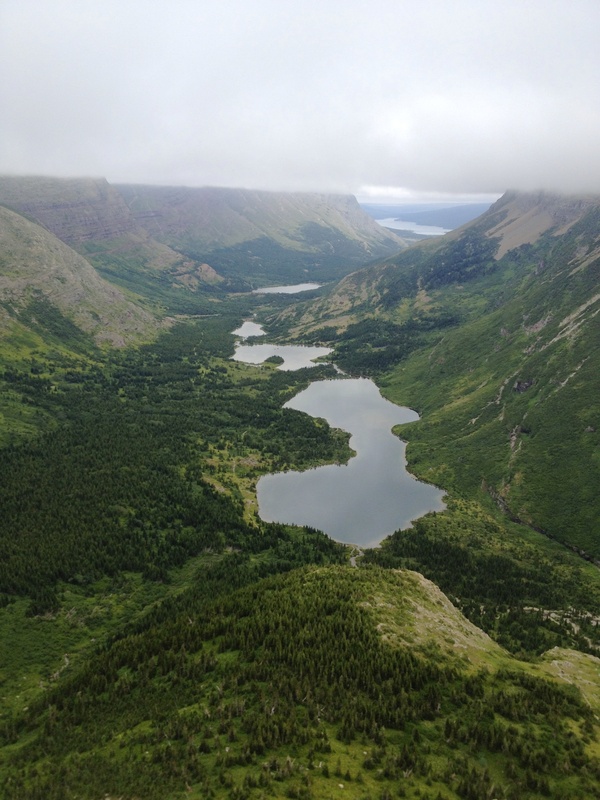 As we headed over the Pass we finally began to break below the cloud cover and see the lakes leading to Many Glacier. 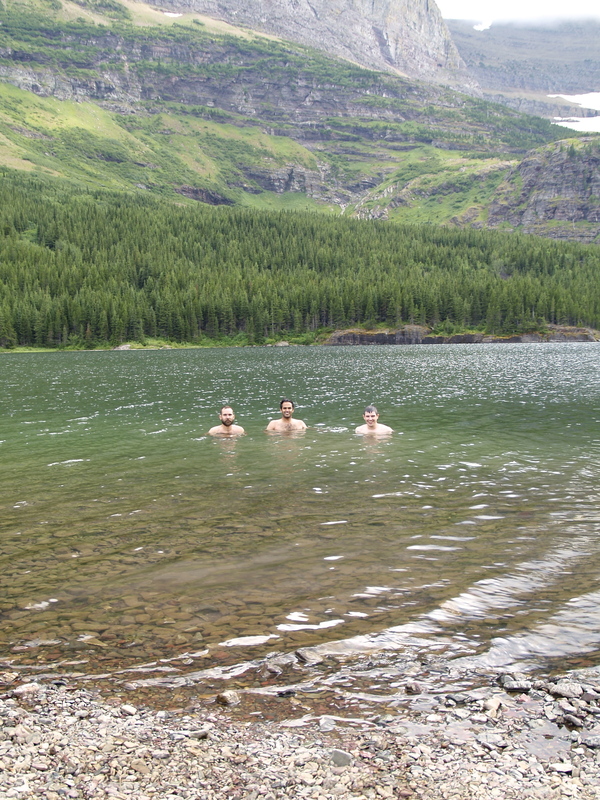 It stayed overcast most of this hike, but we were completely determined to stop at one of the lakes to swim. Many Glacier was as close to civilization as we were going to be for the remainder of the hike. This area swarms with tourists and campers. Even though we were “roughing it” as backcountry hikers and campers, the backcountry sites that were designated for us were amongst the more civilized campers. Not a big deal, as we took advantage of the restroom facilities and the water faucets to refill our bottles. 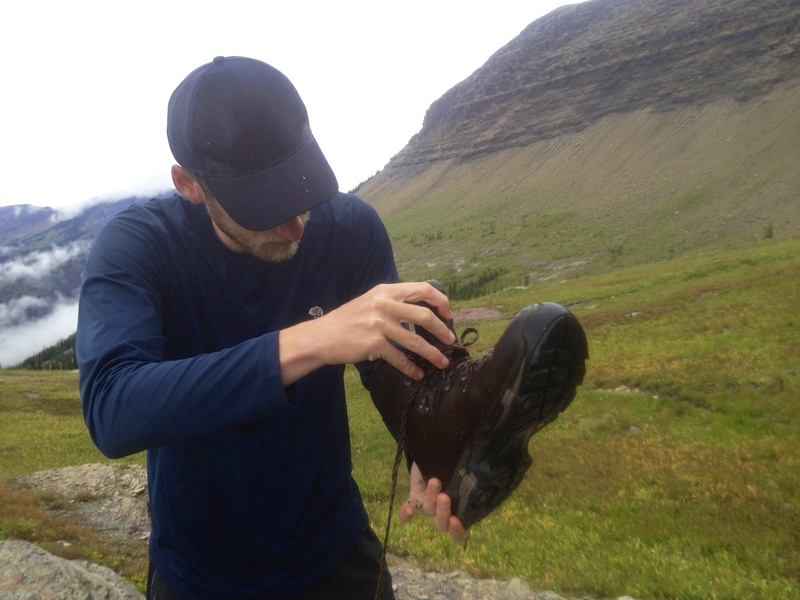 As a side note- even though we were only in our second day of eight… one of the guys noticed that his 15-year old hiking boots were dry rotting in the heels. This was a terrible discovery and one we would have to deal with over the subsequent days. 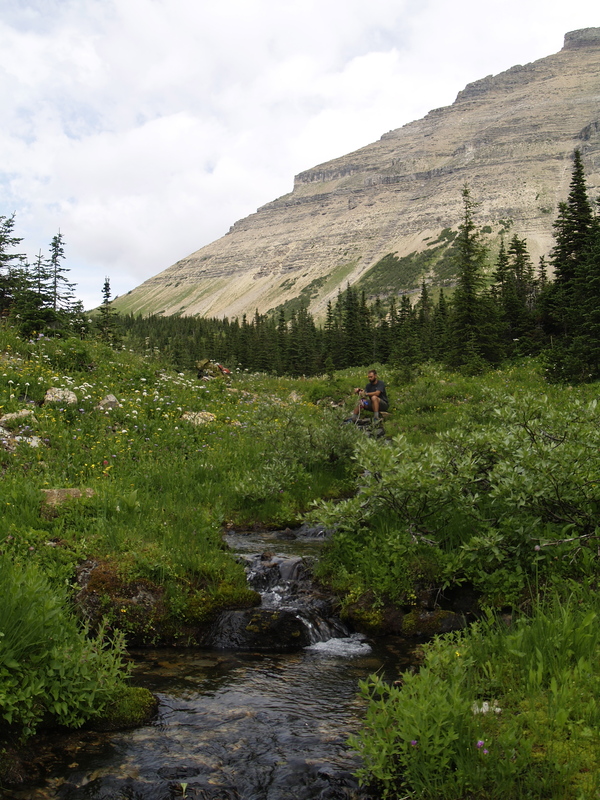 In the next post I will be detailing our amazing trek from Many Glacier through the Ptarmigan Tunnel and on to the glorious Elizabeth Lake! 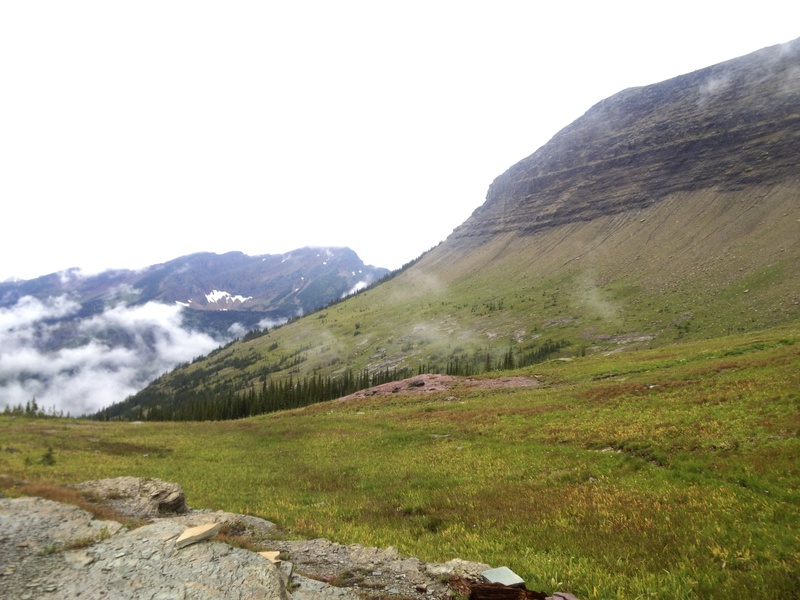 We parked at The Loop, as we would be finishing Flattop Mountain Trail there on Day 8, and took a park shuttle to Logan Pass to begin our hike on Highline Trail. 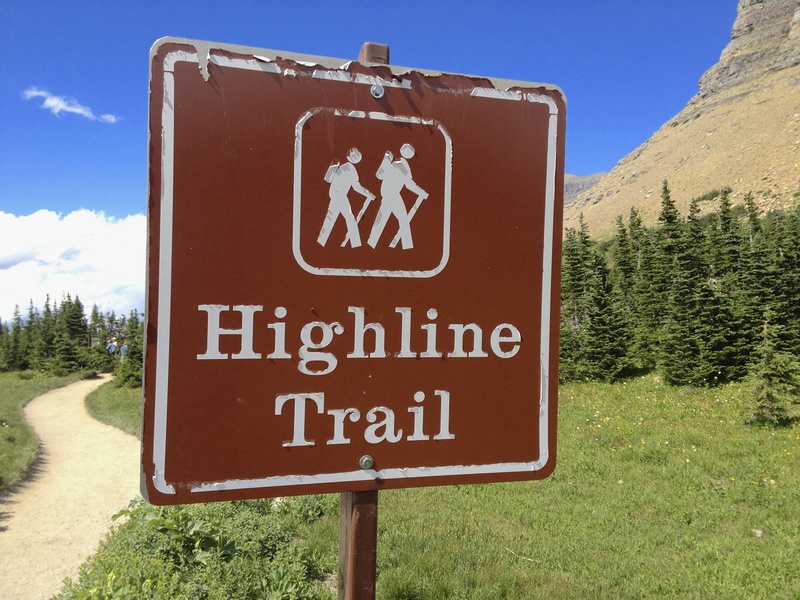 Once you are in the parking lot, which is quite busy in the summer with tourists, you will find Highline Trail located on the north side of the parking lot across Going to the Sun Road. 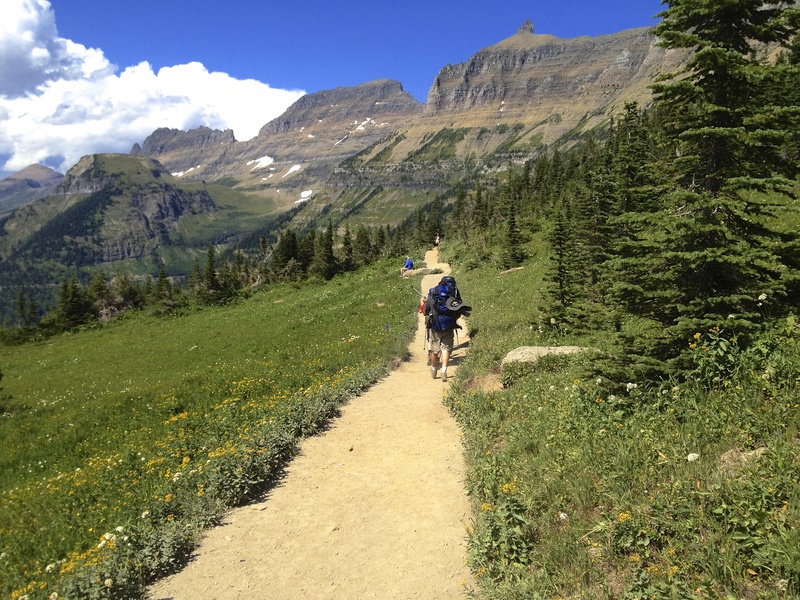 Highline immediately begins to ascend at a very nice grade above Going to the Sun Road and one can see cars backed up for miles. On this particular day everyone had stopped to see the Big Horned Sheep that were grazing near the road. 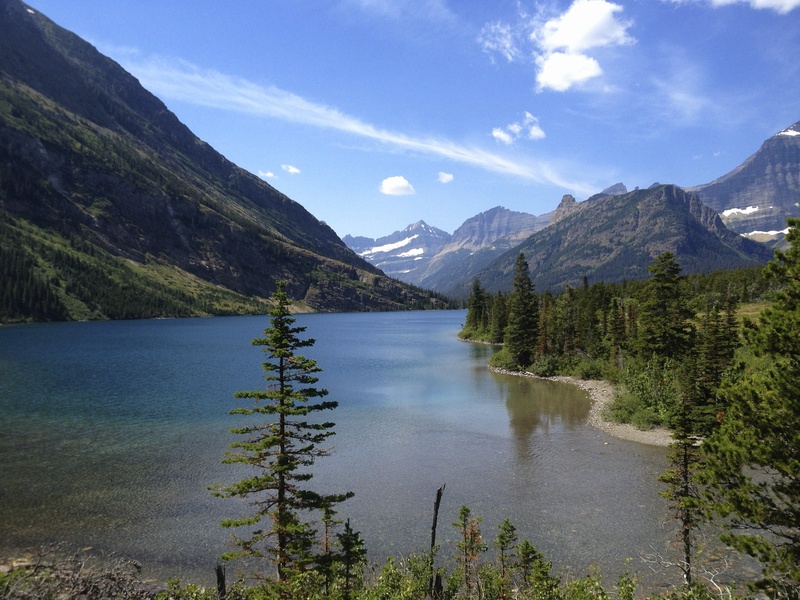 Our route for the next couple of days to Granite Park and Many Glacier would prove to be areas where tourists gathered for summer vacations and day hikes. This wasn’t a big deal because the remaining six days would be as remote as anything we had ever done. The trails were a powdery dirt with fine rocks. 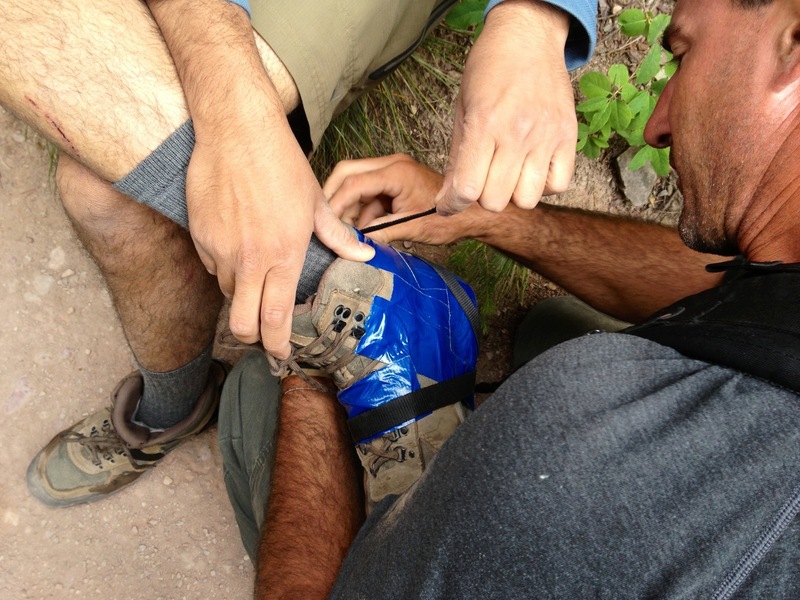 This came as a huge relief, as much of our backcountry hiking in the Rockies the year before were… well… really rocky and hard on the ankles. While portions of the North Circle Route in the touristy are wide and heavily used, the more remote portions are not heavily used, very narrow, and full of overgrowth. But more on that later. 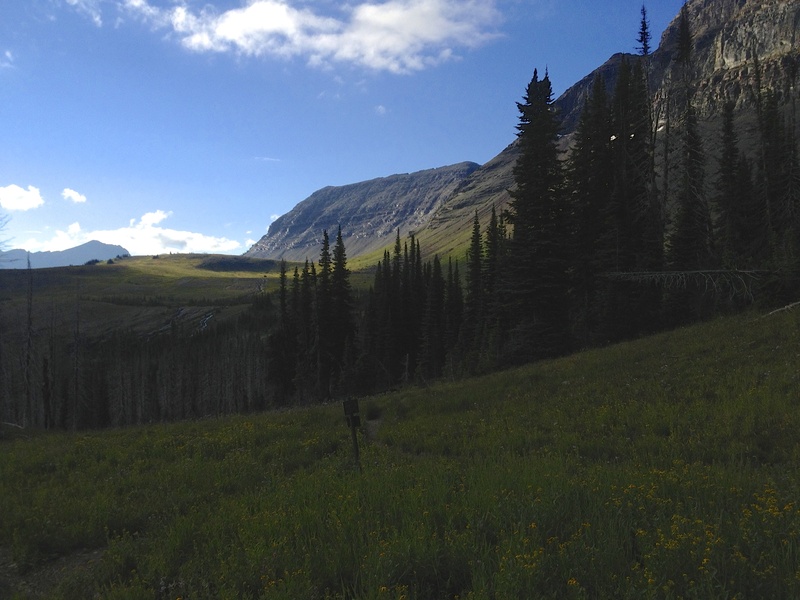 The views from Logan Pass to Granite park were nothing short of magnificent. We found out very quickly that our vocabulary was sorely lacking in being able to describe what we were seeing. You can only use words like “beautiful” and “stunning” so much… until you realize the best thing to do is just stand there in awe and not say a word. 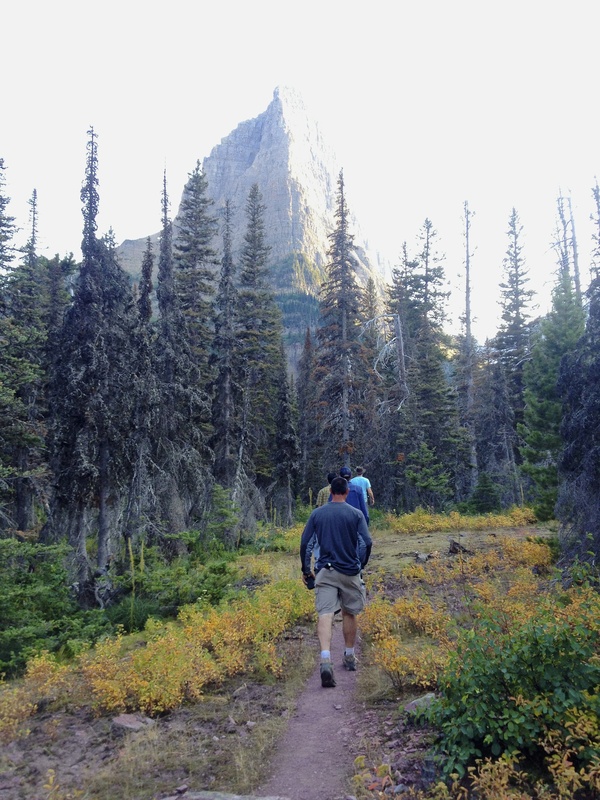 The hike from Logan Pass to Granite Park is an easy hike by any standard. Even with 40 pound packs we did not exert much effort at all. Granted, eight miles is eight miles… and you can usually go about 2 miles per hour with a heavy pack… so it took us around four hours to reach Granite Park. 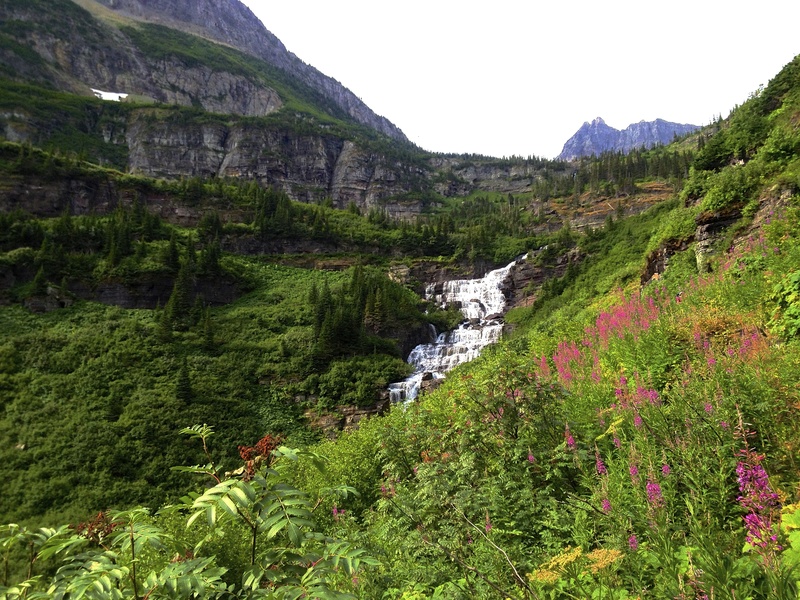 Close to the midway point of this hike you will reach the Garden Wall, which is a spectacular view of several mountain peaks but also of the colorful wildflowers that blanket the area. Once we passed Haystack Butte we stopped for some views and a quick snack. One thing to keep in mind if you are hiking this route in the mid to latter part of July is that it can still get quite cool at times. 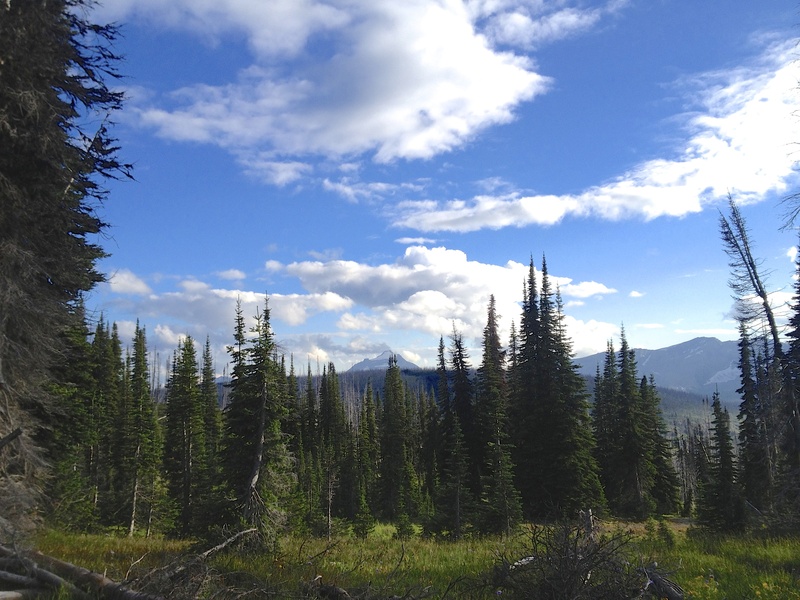 If you look closely in the distance on the second half of Highline Trail you will begin to see Granite Park Chalet. This marker, while it proved to be very close to where we would be camping, was quite deceptive. We could see it from several miles away and thought we were much closer. It was surprising how long it took us to make it to the chalet, but once we made it there we were just five minutes from our campsite for the night. Despite calling the Backcountry Office before leaving Indiana, being told that the temperatures were running warmer than the seasonal averages, and that we would not need warm jackets or gloves… we were definitely getting cold once we reached Granite Park around 7pm. 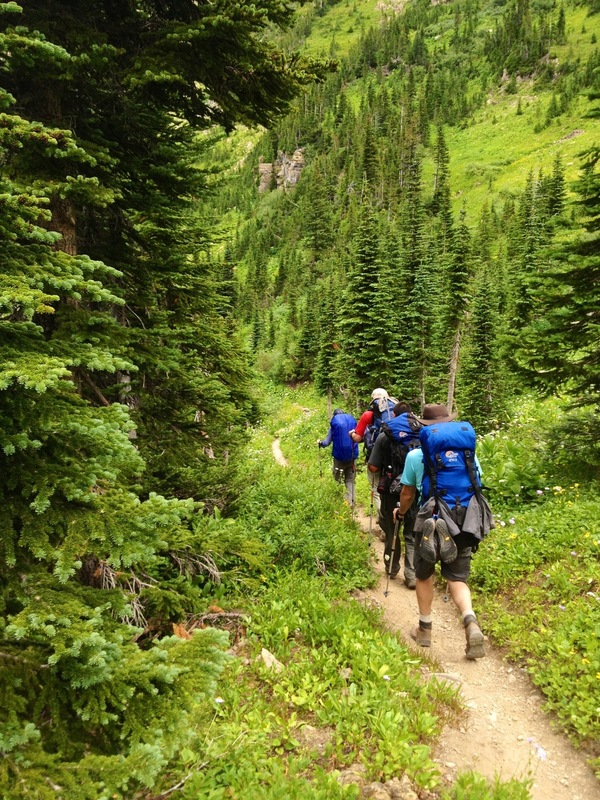 We started the hike around 3pm because we had to pick up our backcountry permit, watch a 30 minute instructional video, and then shuttle to Logan Pass. While we didn’t have warm jackets or gloves, we just added more shirt layers and wind breakers. 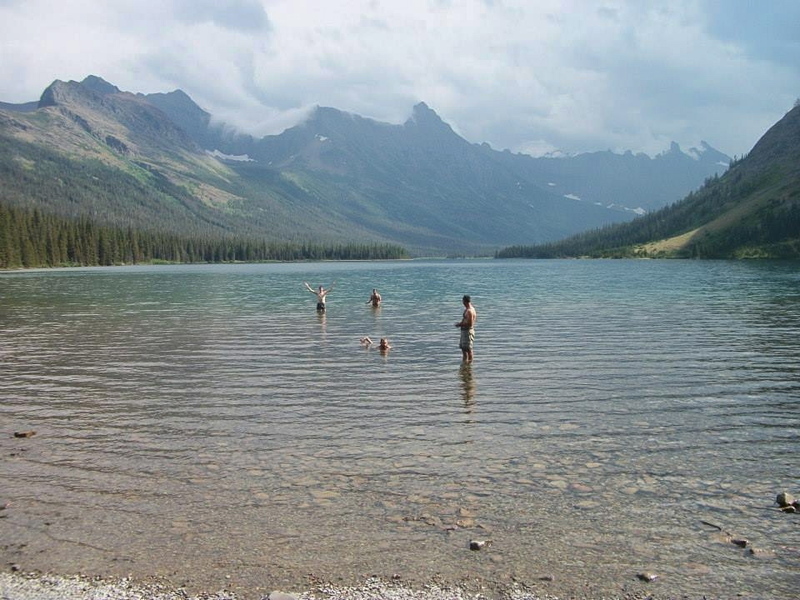 Granite Park camp has designated areas for camping and eating. It is mandatory you eat and that your bagged food is hung up by rope in the food area. Yes, bears and other wildlife will come after your food. Do not have your food in any other areas because animals will take it. 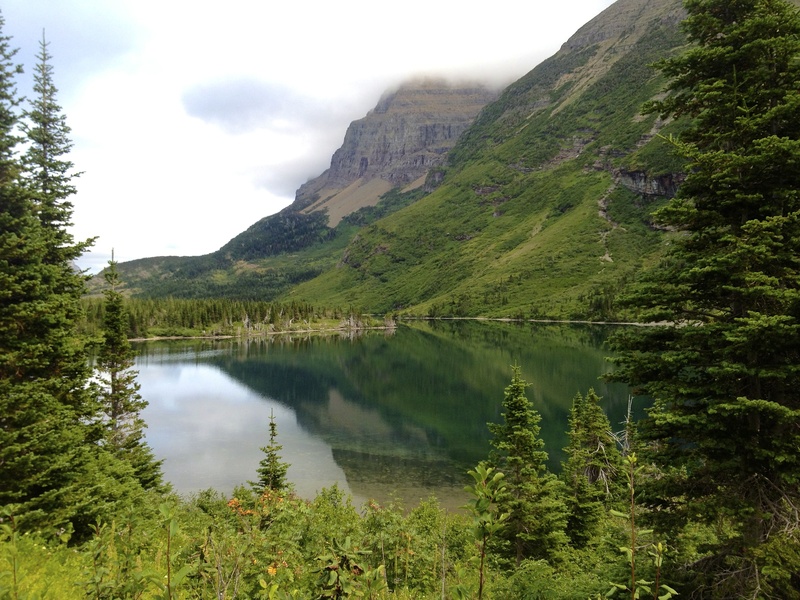 The next post will detail our trek from Granite Park to Many Glacier.